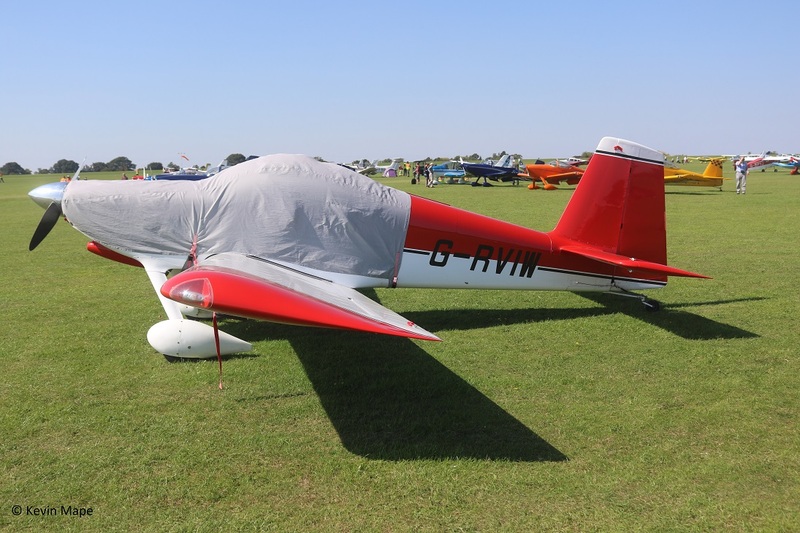 Aircraft pictured on the day. 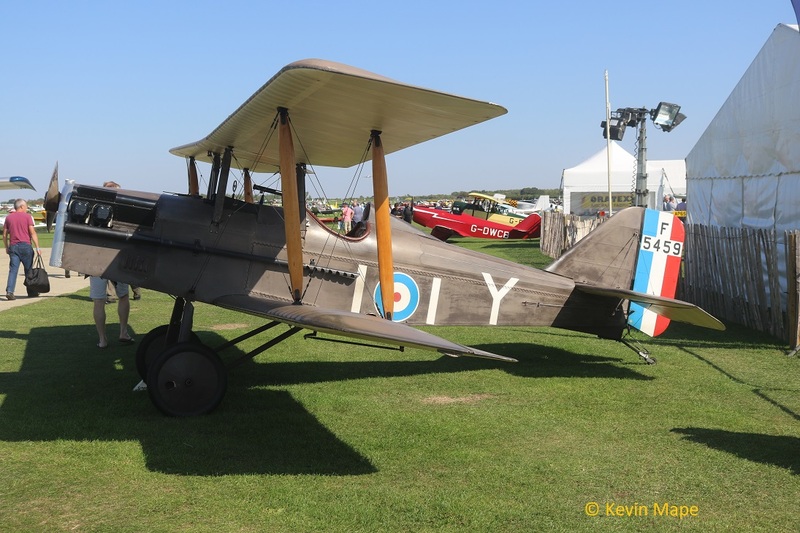 13/BAPC 179 – A’653 – Sopwith Pup Replica. 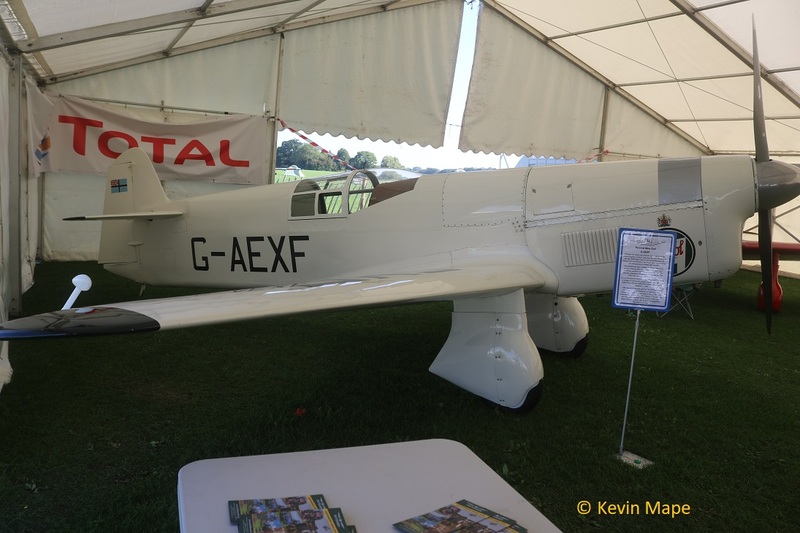 21/G-AEXF – Percival Mew Gull. – Built 1936. 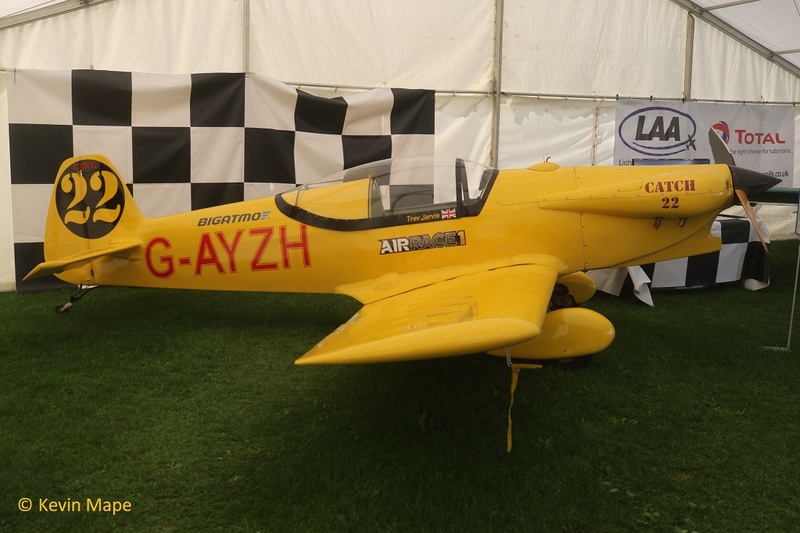 15/G-AFSV – Chilton DW1A – Built 1939. 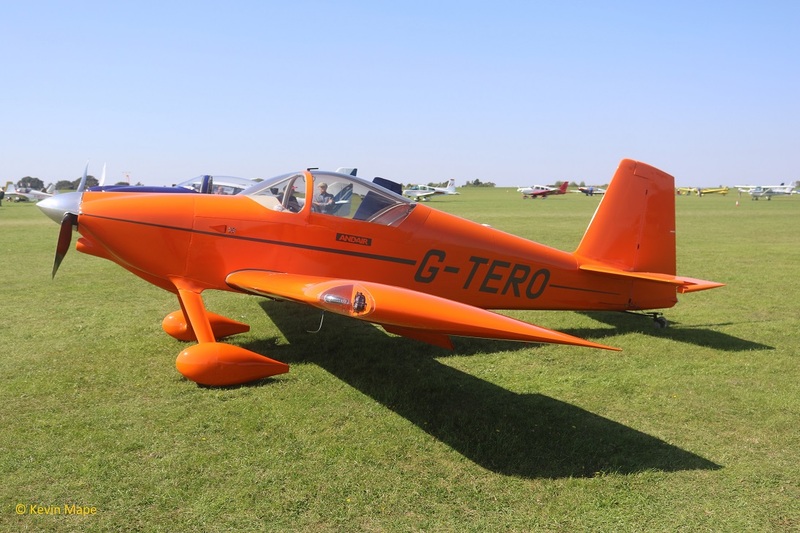 34/G-AFZL – Porterfield CP50. Built 1939. 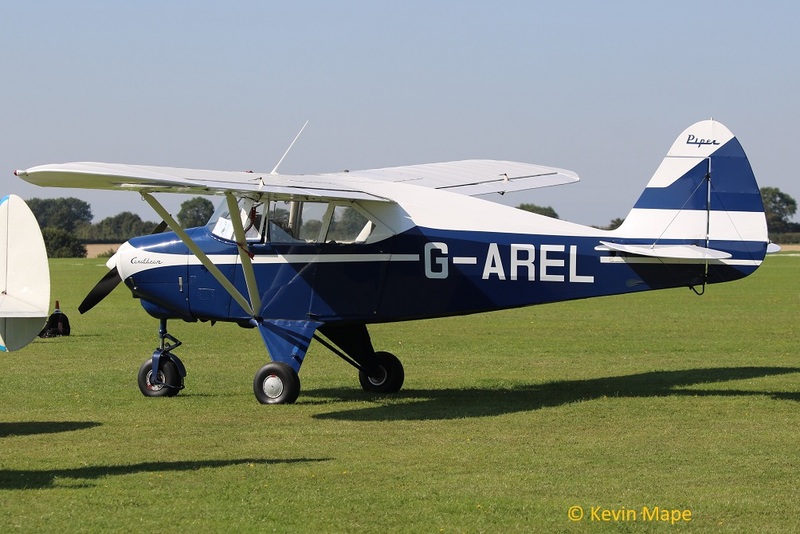 33/G-AIGF- Auster J1/N . Built 1946. 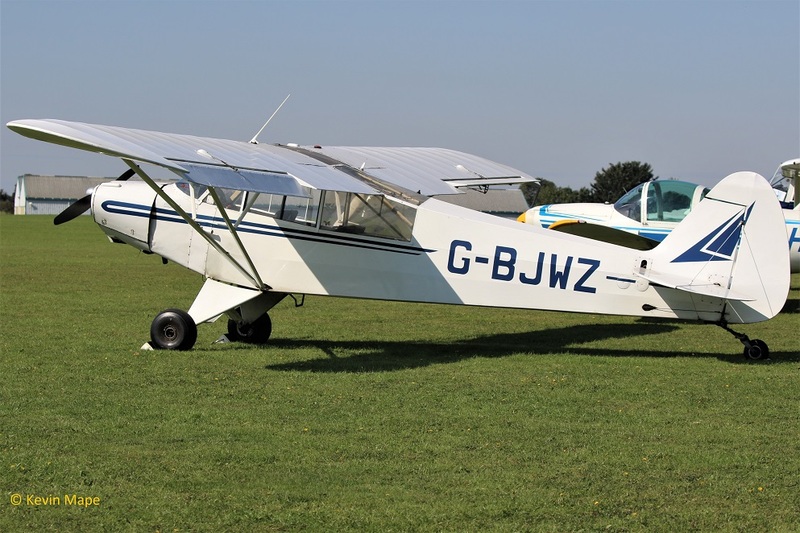 76/G-AJKB – Luscombe 8E – Built 1946. 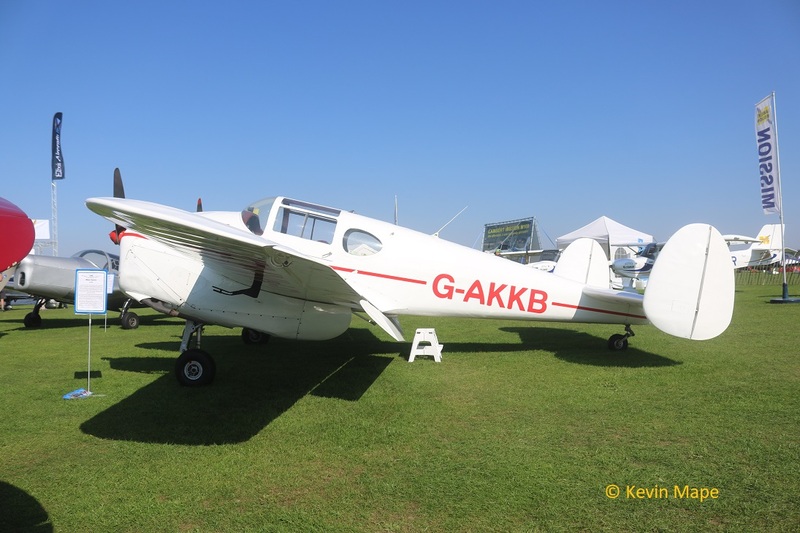 1/G-AKIN – Miles M38 Messenger 2A – Built 1947. 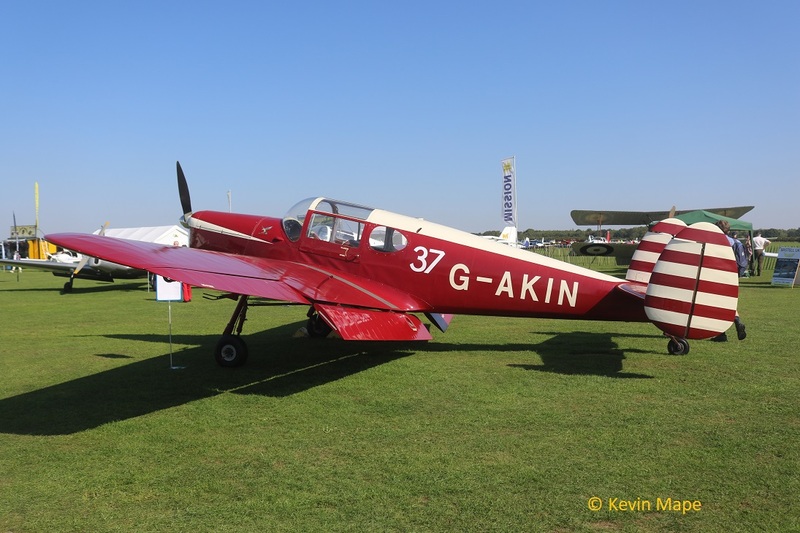 2/G-AKKB – Miles M65 Gemini 1A – Built 1947. 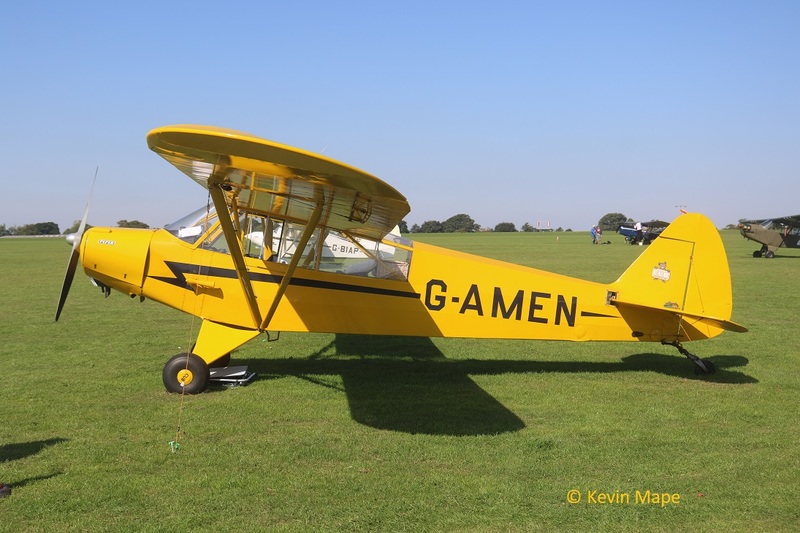 59/G-AMEN – Pa – L-18C Cub. Built 1952. 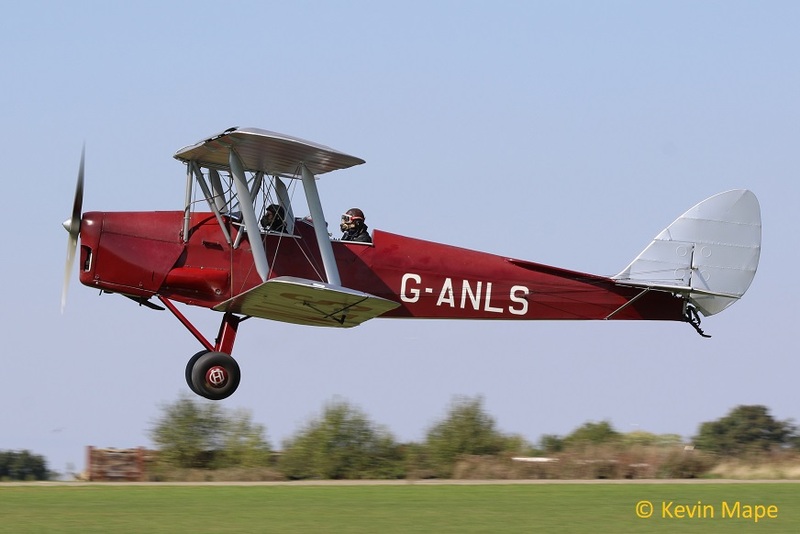 45/G-ANLS – DH82A Tiger Moth. Built 1944. 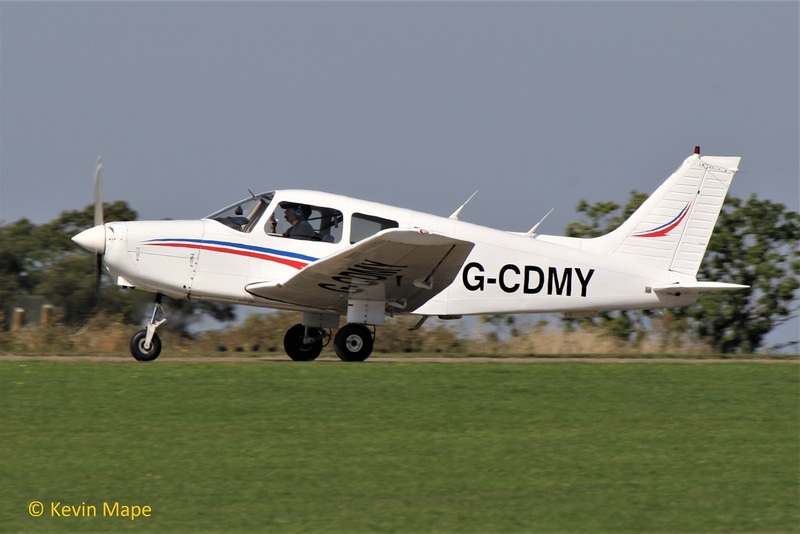 58/G-AREL – Pa- 22-150 Caribbean . Built 1960. 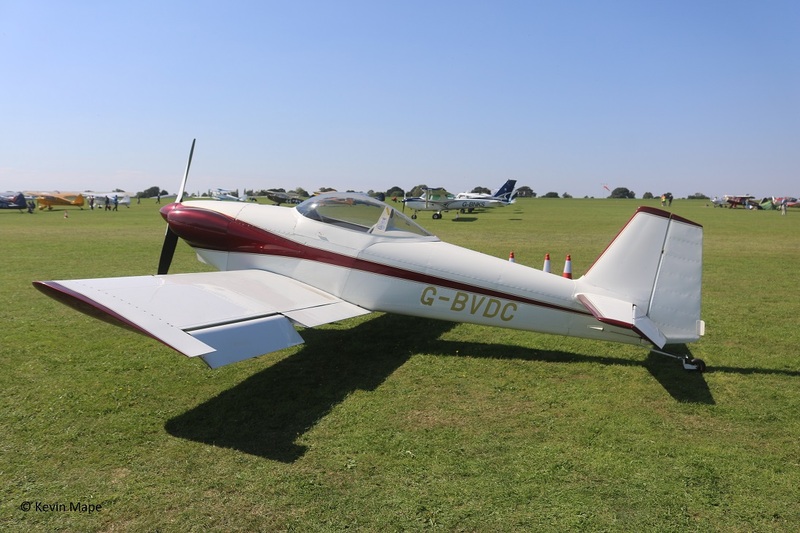 88/G-ARHZ -Druine D.62 Condor. Built 1961. 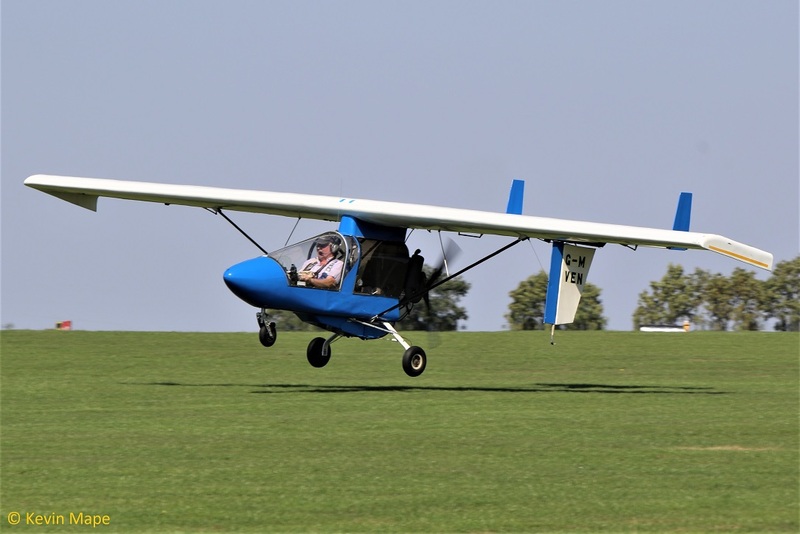 35/G-ARRT – Wallis WA-116/MC. Built 1961. 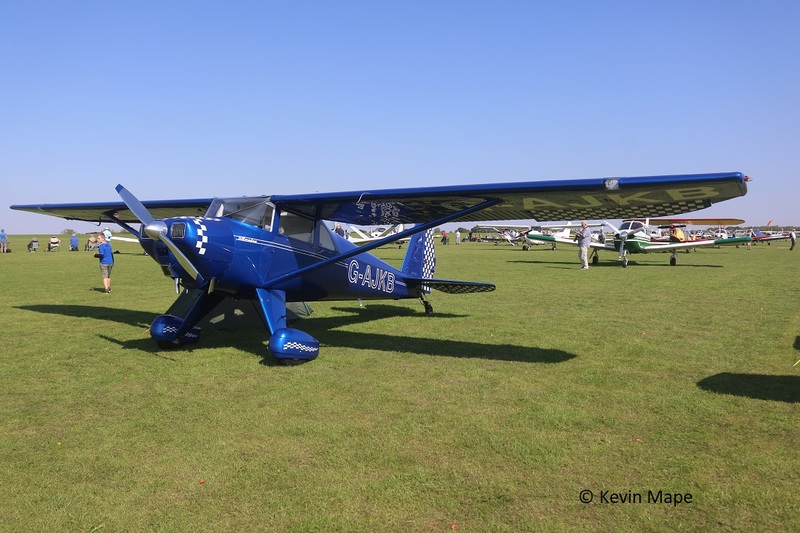 256/G-ARUI – Beagle A.61 Terrier. Built 1962. 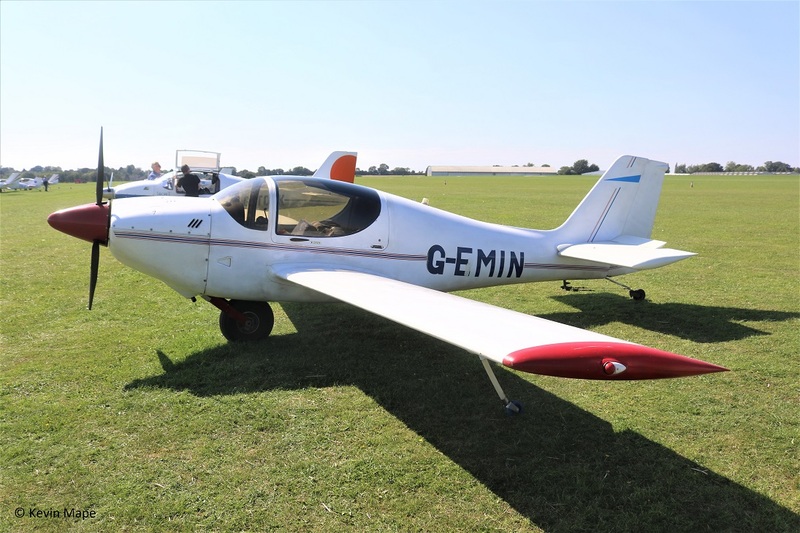 16/G-ARUL – Cosmic Wind- Built 1973. 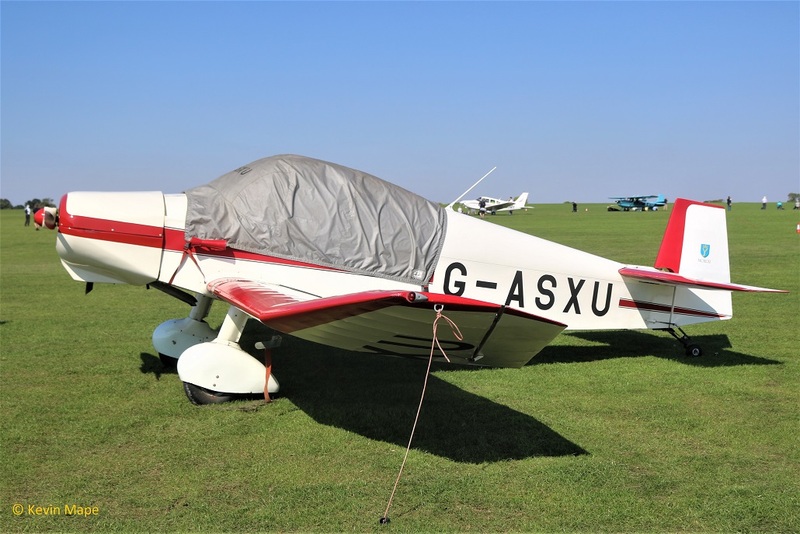 109/G-ASXU – Jodel D.120A Built 1961. 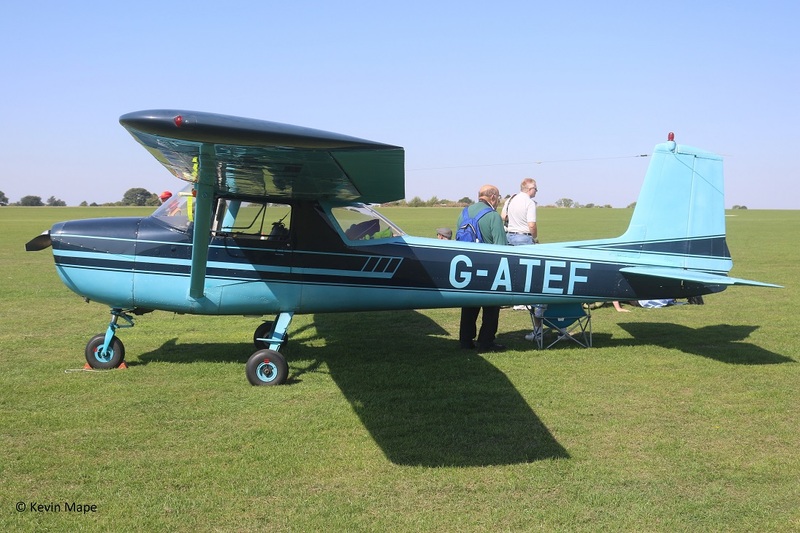 G-ATEF – Cessna 150E Built 1965. 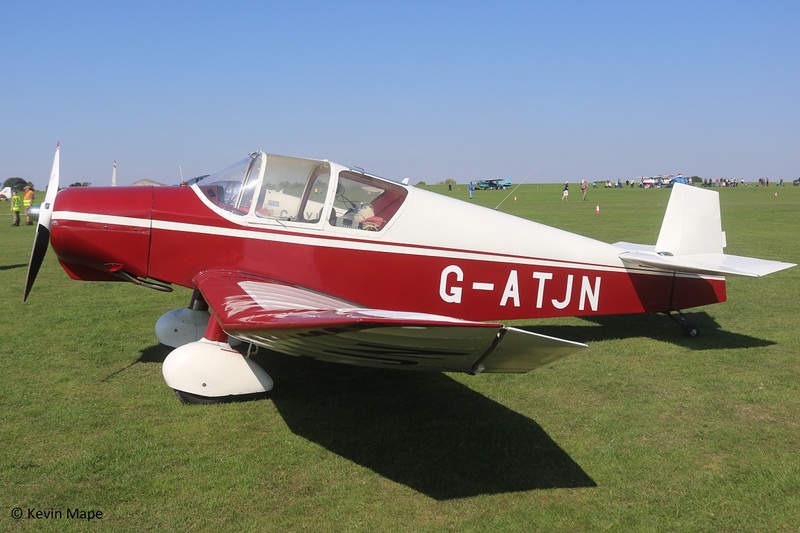 G-ATJN – Jodel D.119 Built 1958. 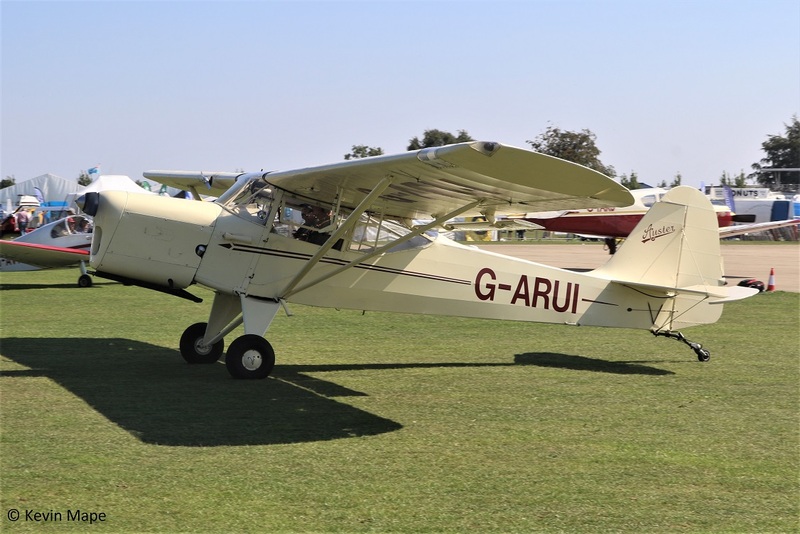 G-ATUG – Druine D.62B Condor Built 1966. 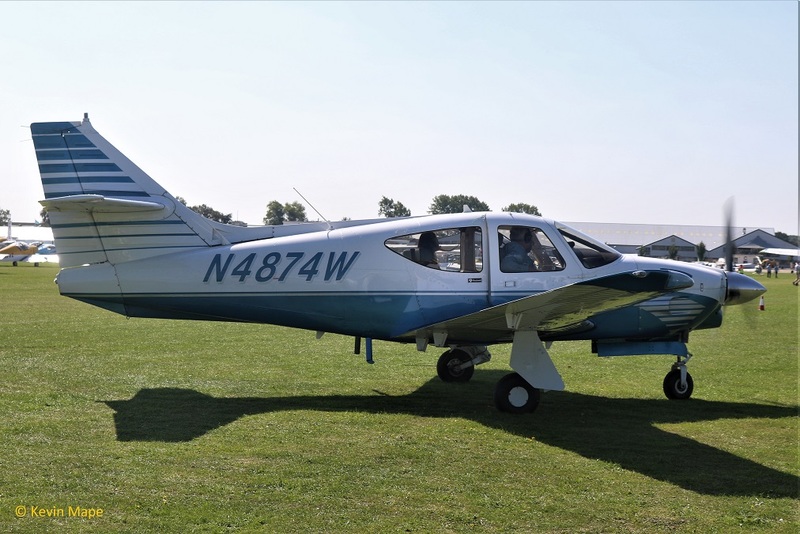 114/G-ATXD – Pa-30 Twin Comanche Built 1966. 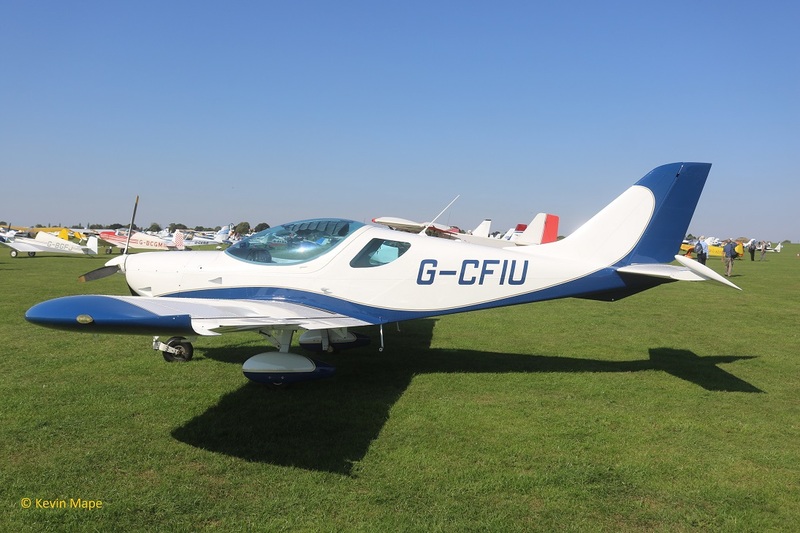 G-AVNY – Fournier RF4D. Built 1967. 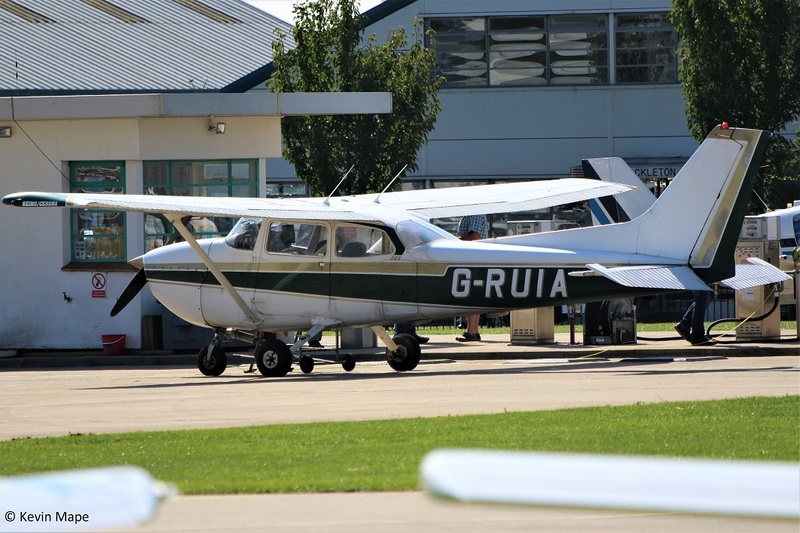 G-AVRW – Minicab . Built 1968. 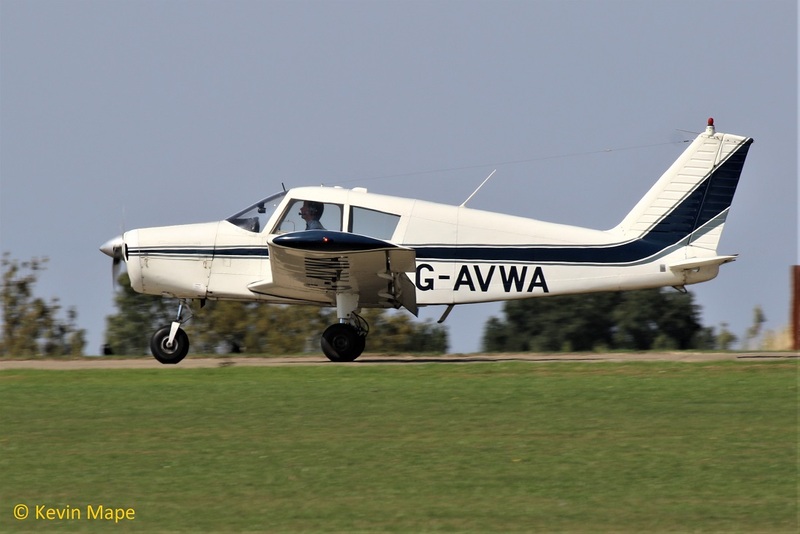 G-AVWA – Pa-28-140 Cherokee. Built 1967. 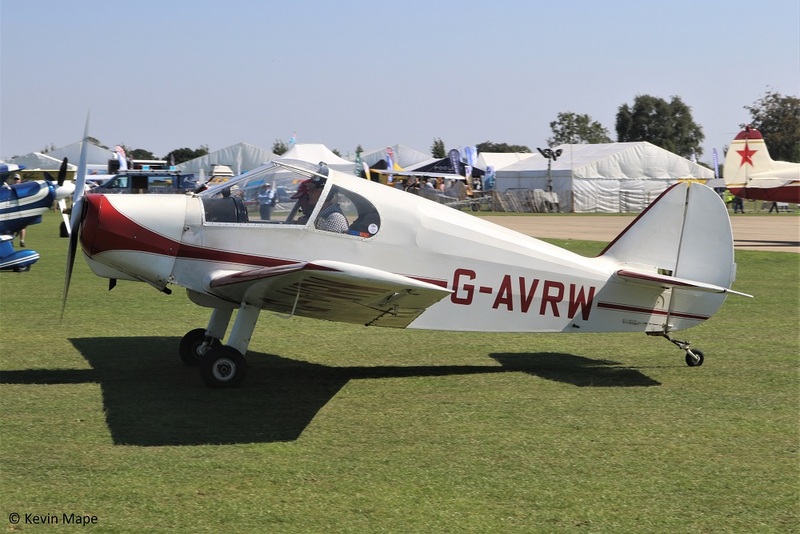 G-AWAZ – Pa-28R – 180 Cherokee Arrow. Built 1968. 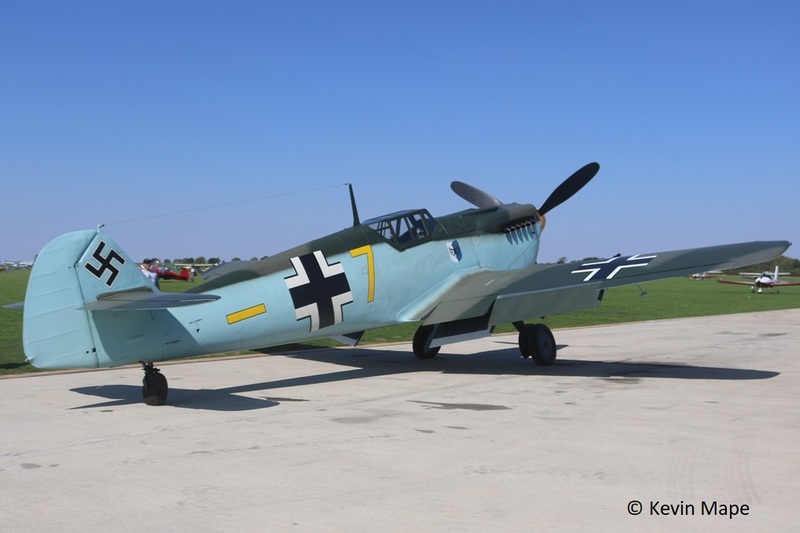 G-AWHM – Hispano HA1112 – M4L Buchon – wears Luftwaffe yellow 7. Built 1958. 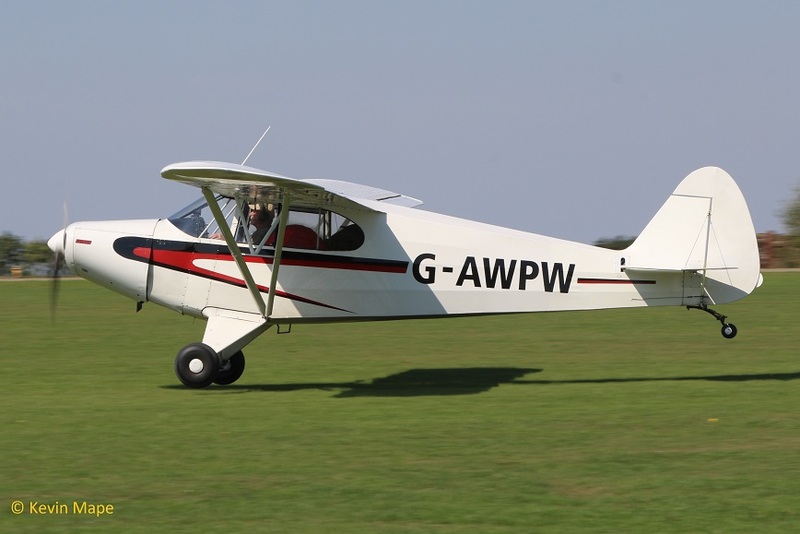 G-AWPW – Pa-12 Super Cruiser. Built 1947. 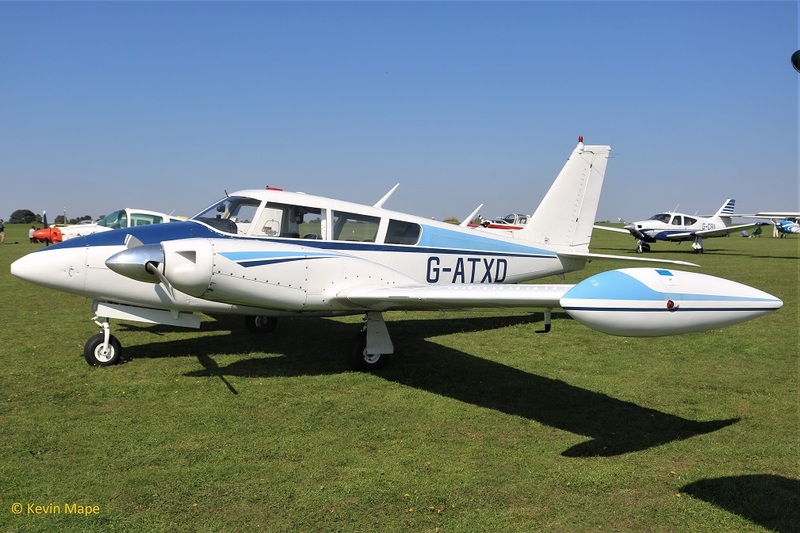 G-AXTC – Pa-28- 140 Cherokee. Built 1969. 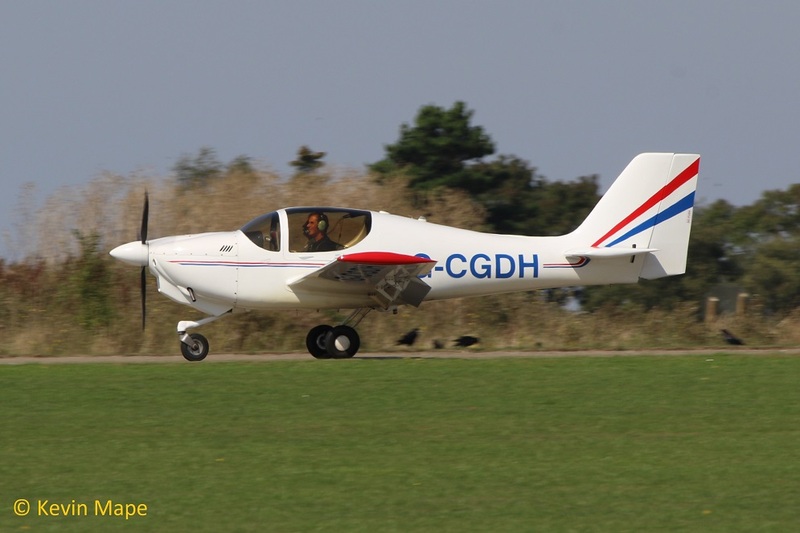 G-AYEW – Jodel DR1050 . Built 1963. 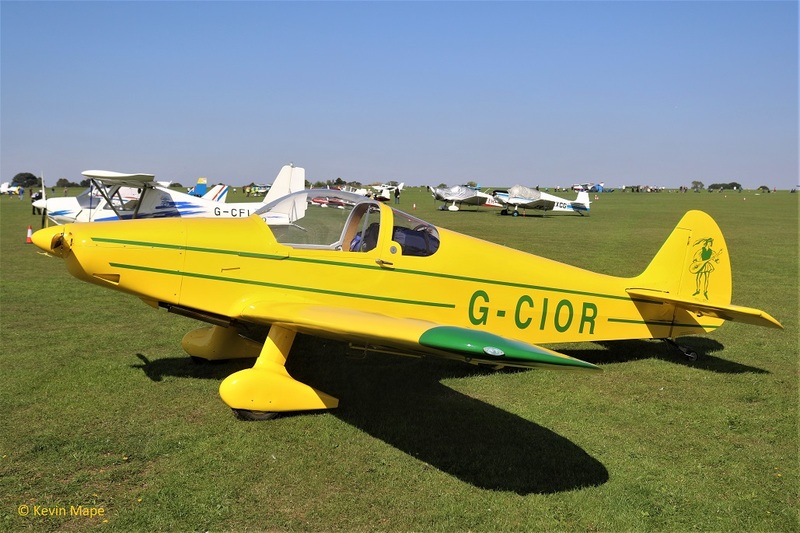 G-AYLC – Jodel DR1051 . Built 1964. 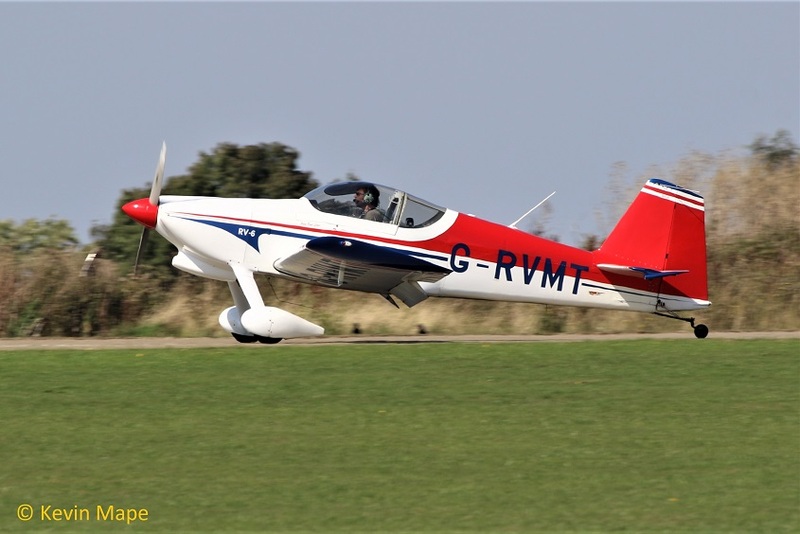 G-AYVO – Wallis WA-120 Srs 2. Built 1971. 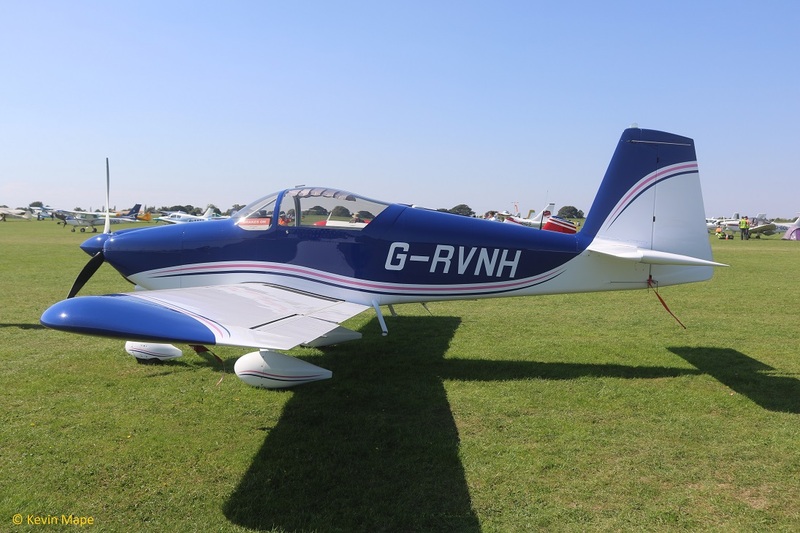 G-AYZH – Taylor Titch – Built 2007. 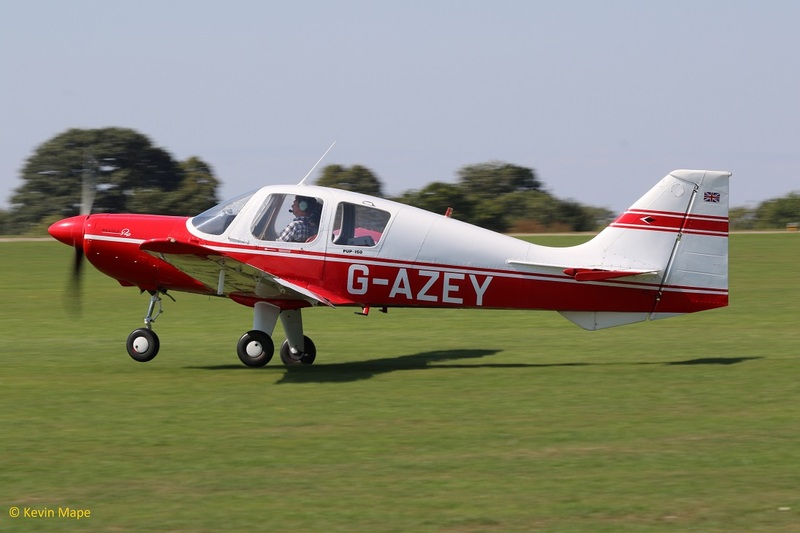 G-AZEY – Beagle B121 Pup – 150 series 2. Built 1969. 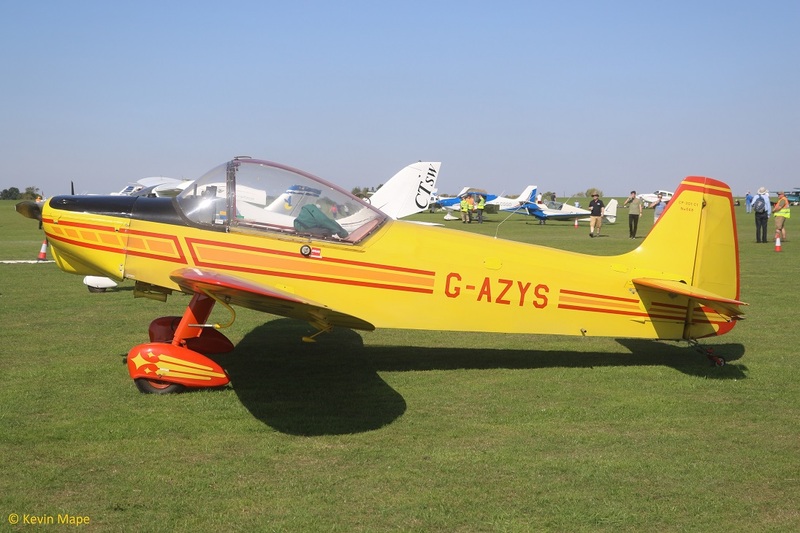 G-AZYS – Scintex CP301-C1 . Built 1961. 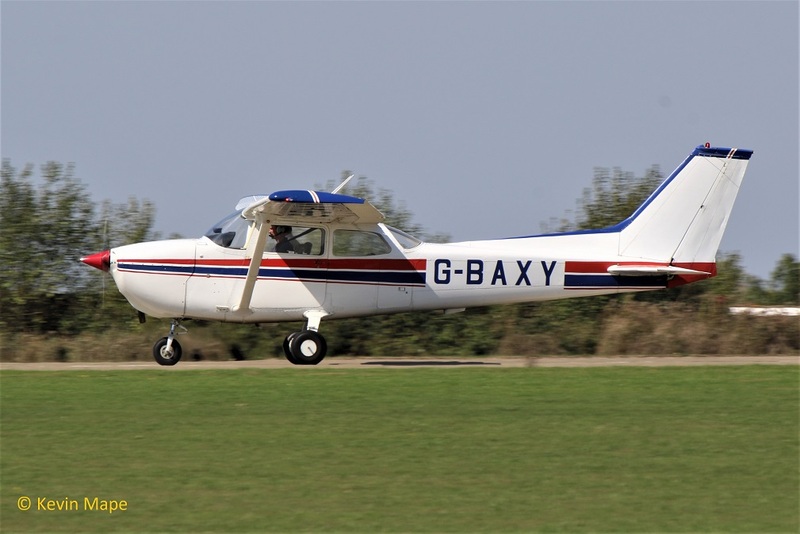 182/G-BAXY – Cessna F172M Skyhawk. Built 1973. 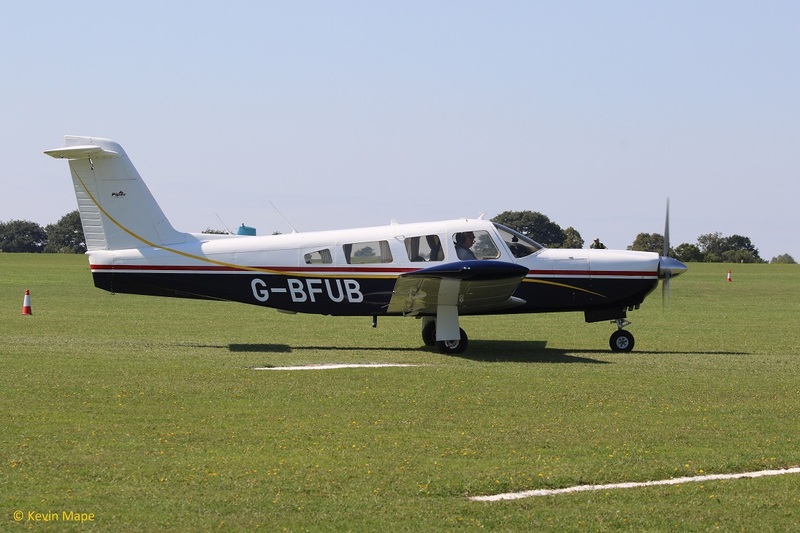 193/G-BBXW – Pa-28-151 Warrior . Built 1973. 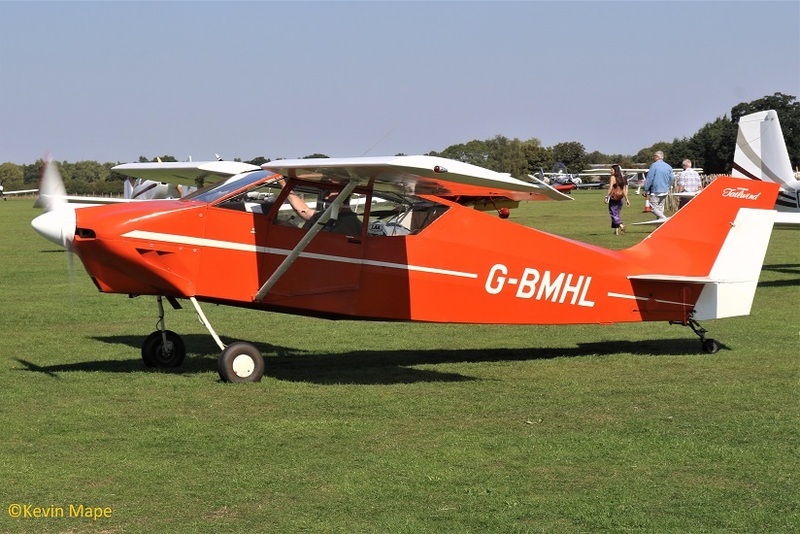 G-BCGM – Jodel D.120. Built 1957. 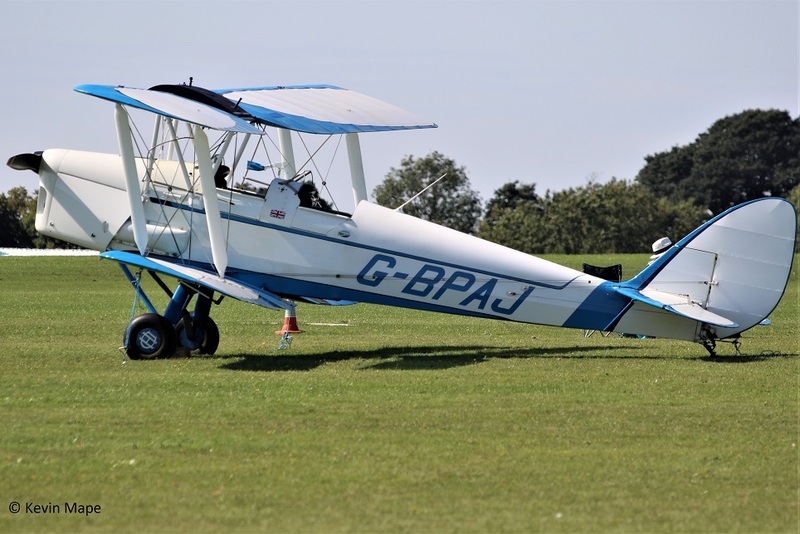 G-BCWH -Practavia Sprite. Built 1978. 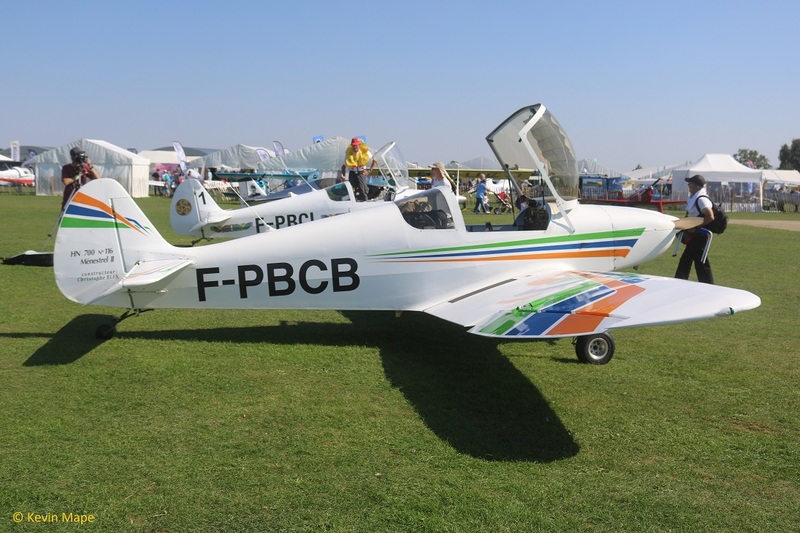 G-BDKH – Piel CP301a Emeraude. Built 1958. 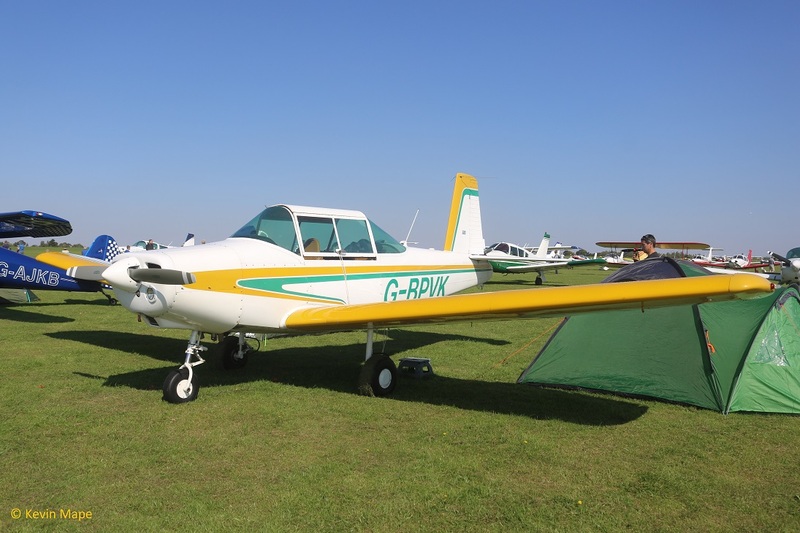 G-BDLT – Rockwell Commander 112. Built 1975. 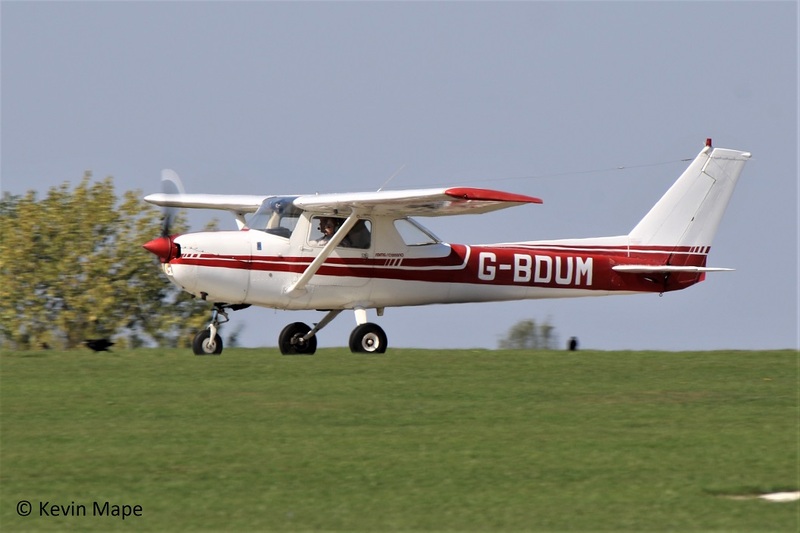 G-BDUM – Reims Cessna F150M. Built 1976. 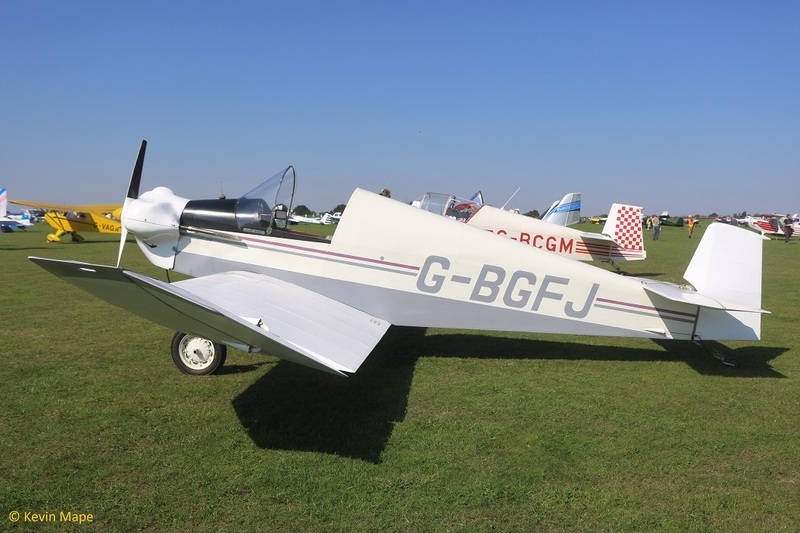 G-BDWM/Bonsall DC-1 Mustang Replica . 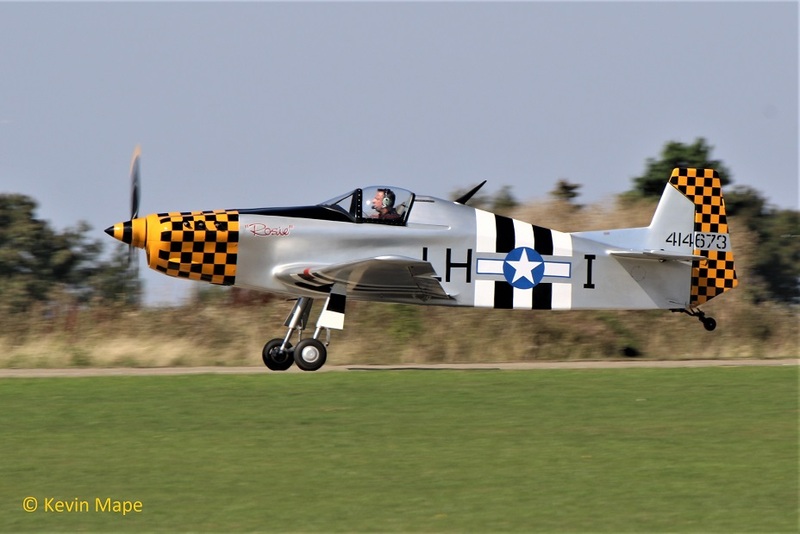 Built 1990 – wears 414673 LH-I USAAF. 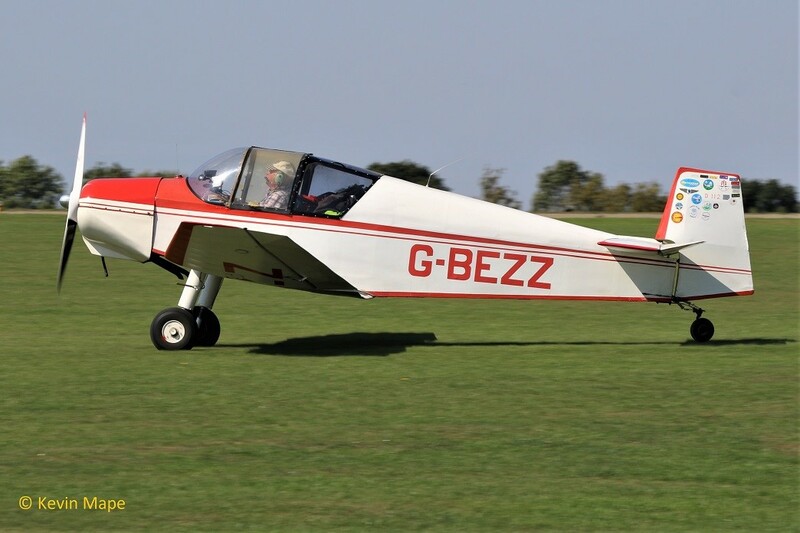 166/G-BEZZ – Jodel D.112. Built 1956. 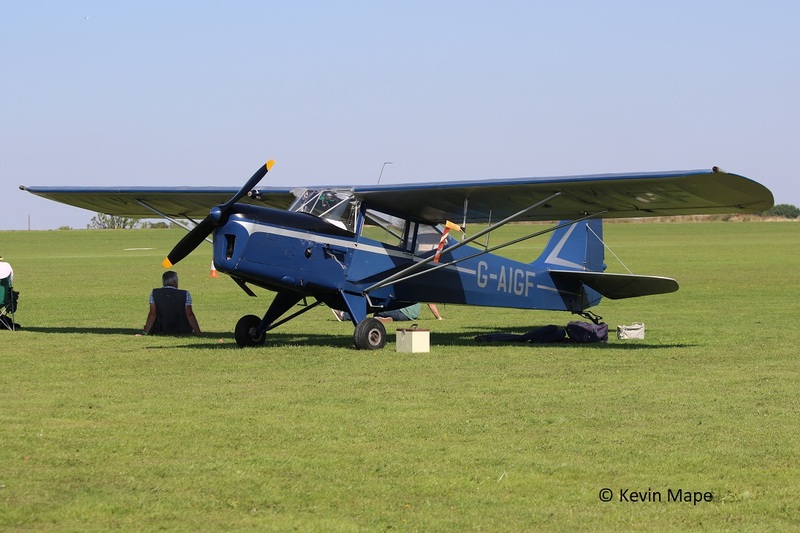 53/G-BFNG – Jodel D.112. Built 1966. 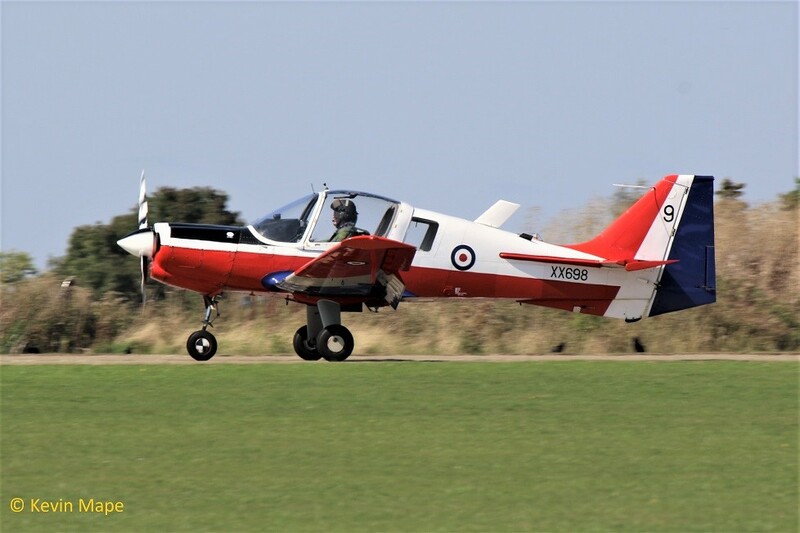 221/G-BFUB – Pa-32RT – 300 Lance II. Built 1978. 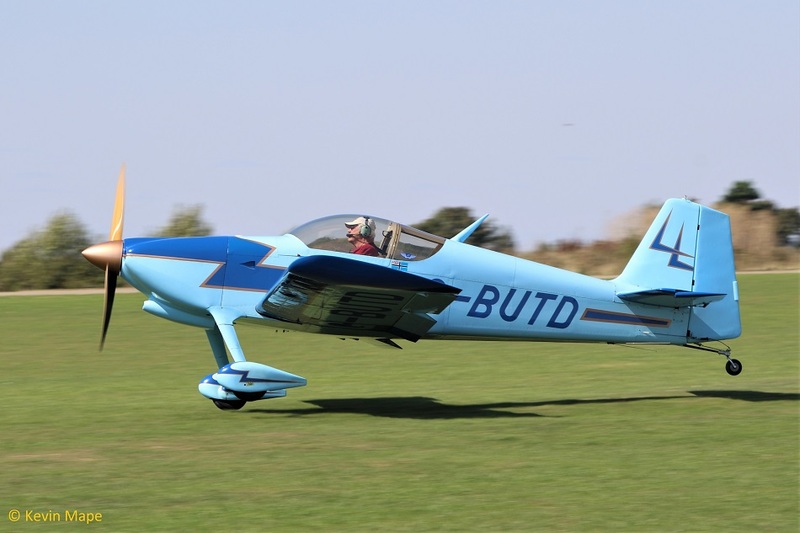 97/G-BGFJ – Jodel D9. Built 1982. 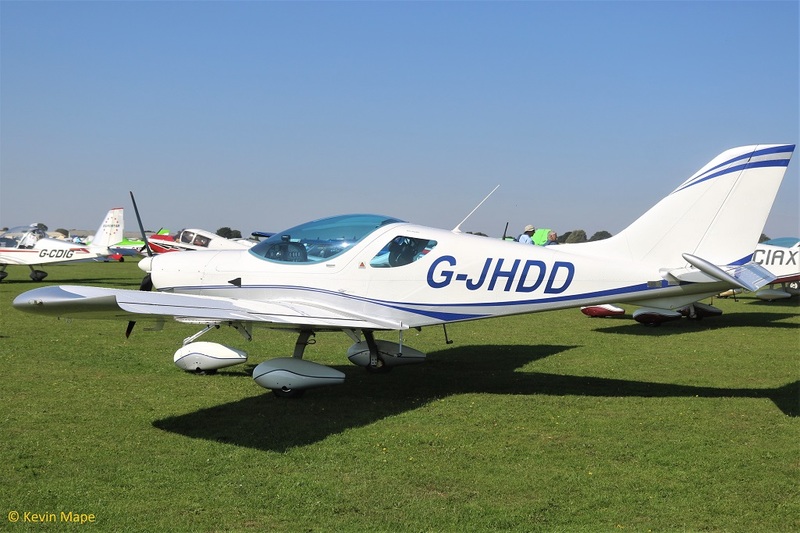 257/G-BHHE – Jodel DR1051-M1. Built 1965. 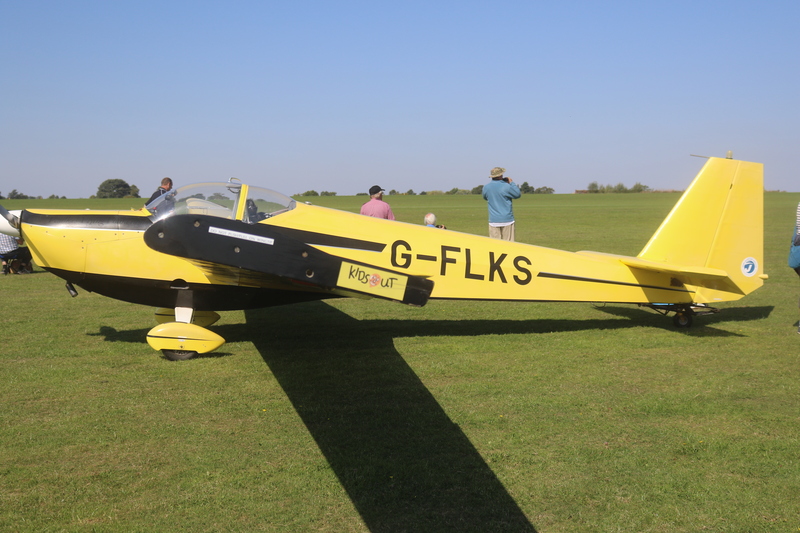 194/G-BHLX – AA5B Tiger. Built 1977. 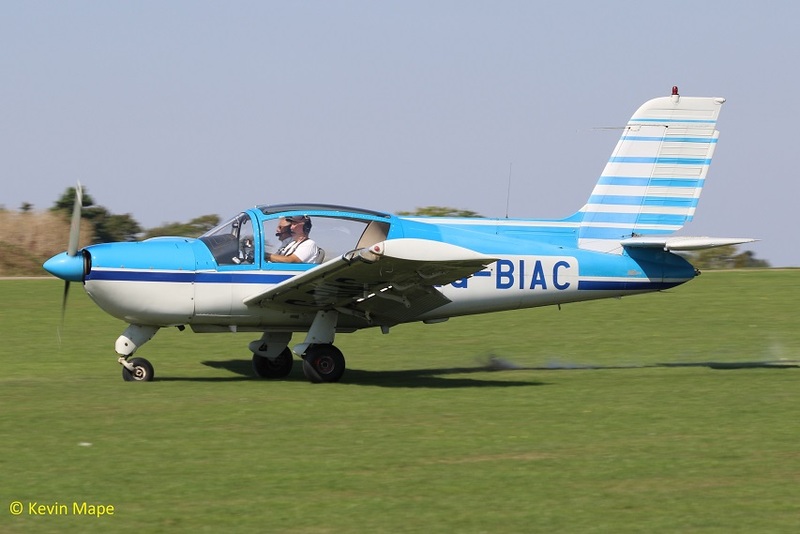 131/G-BIAC – M.S Rally 235E. Built 1980. 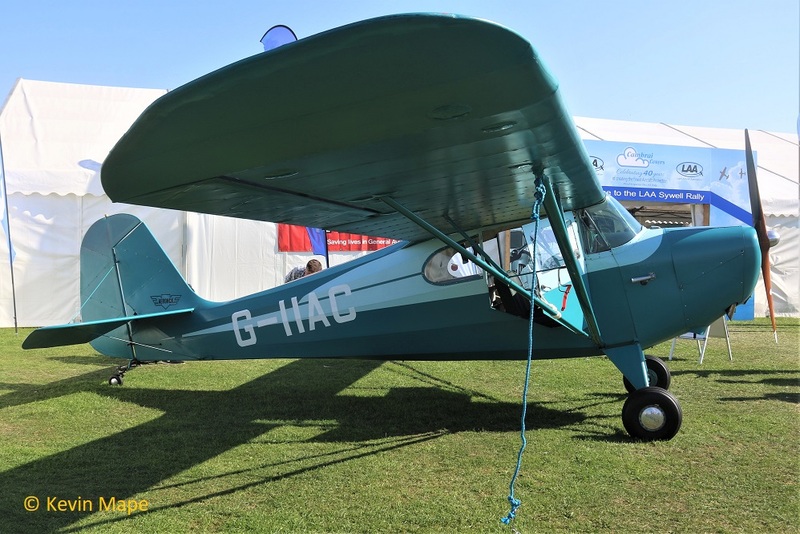 60/G-BIAP – Pa -16 -108 Clipper – Built 1950. 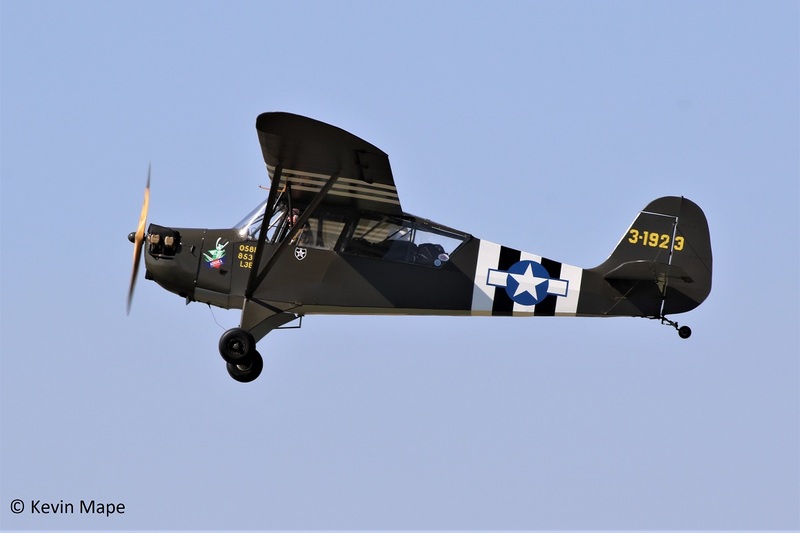 65/G-BILI – Pa- L-4H Grasshopper – Built 1948 Wears USAAC 454467 coded 44-J Invasion stripes. 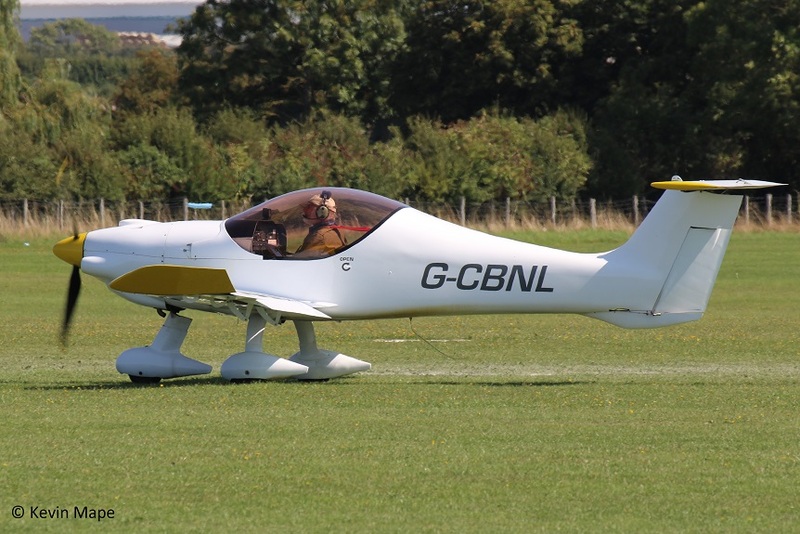 155/G-BJWK – Jodel D120A. Built 1960. 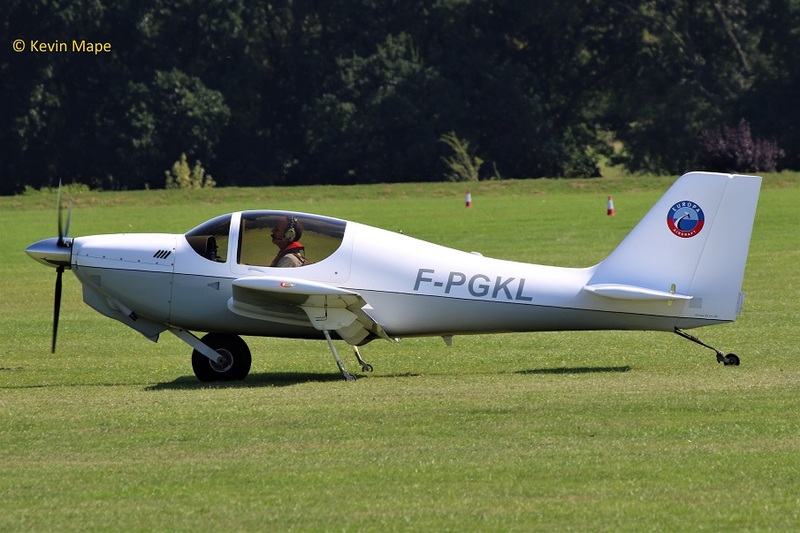 116/G-BJXK – Fournier RF-5. Built 1970. 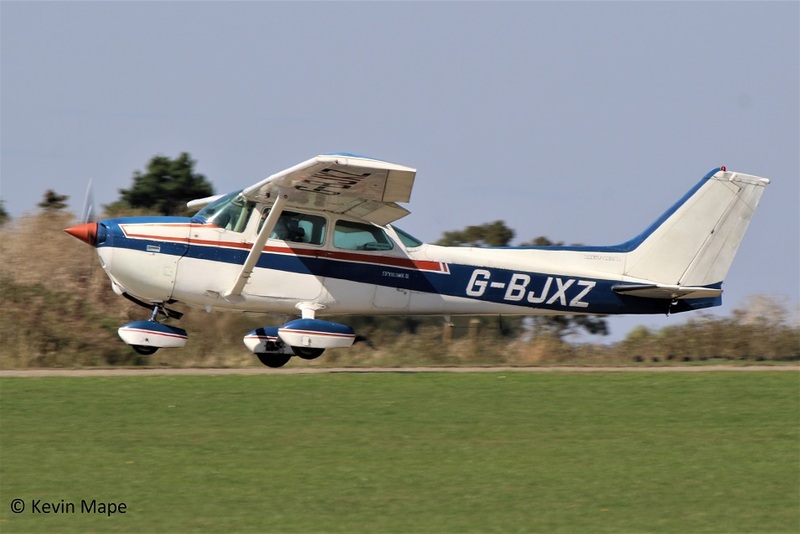 G-BJXZ – Cessna 172N. Built 1980. 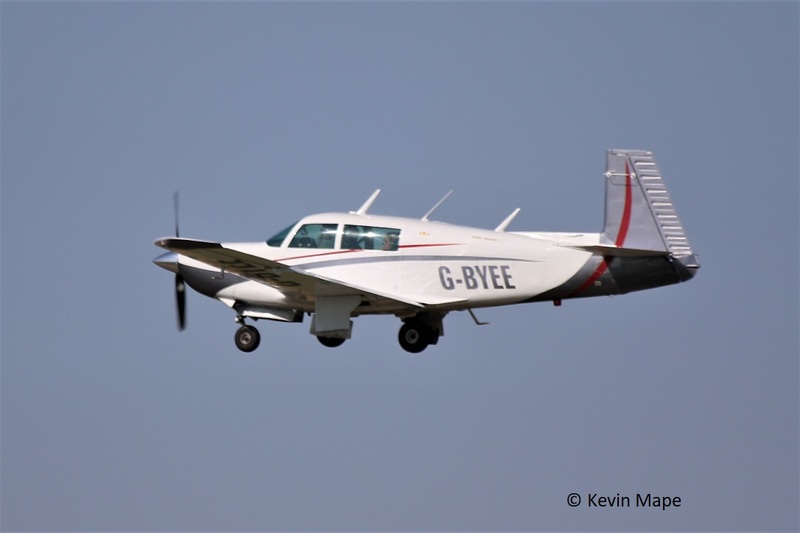 G-BJYD – Reims Cessna F152. Built 1982. 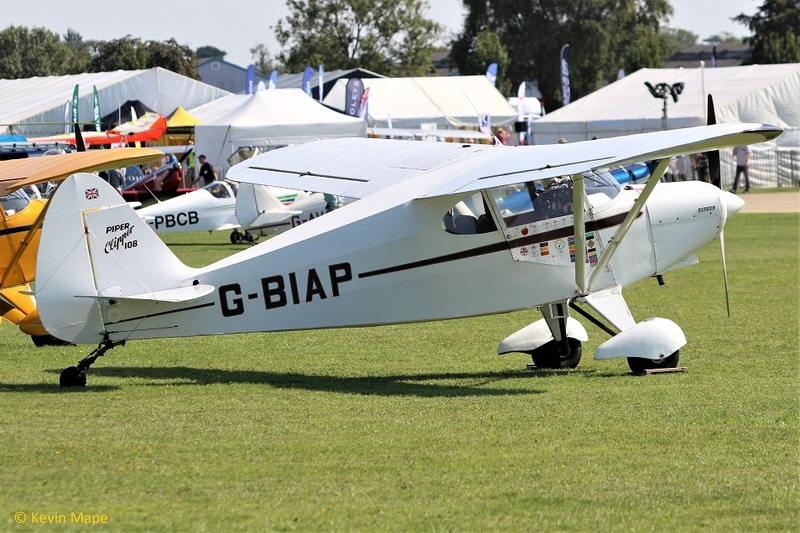 G-BKCV – Aerosport 2. Built 1990. 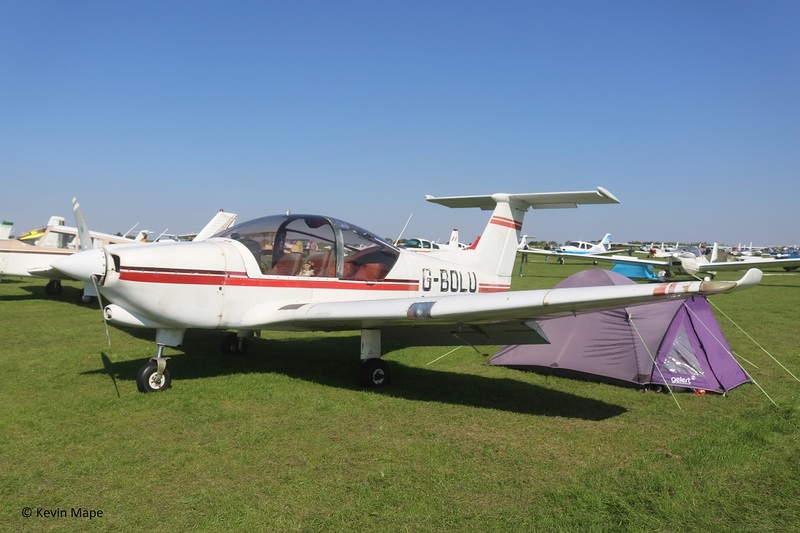 197/G-BKCW – Jodel D120. Built 1965. 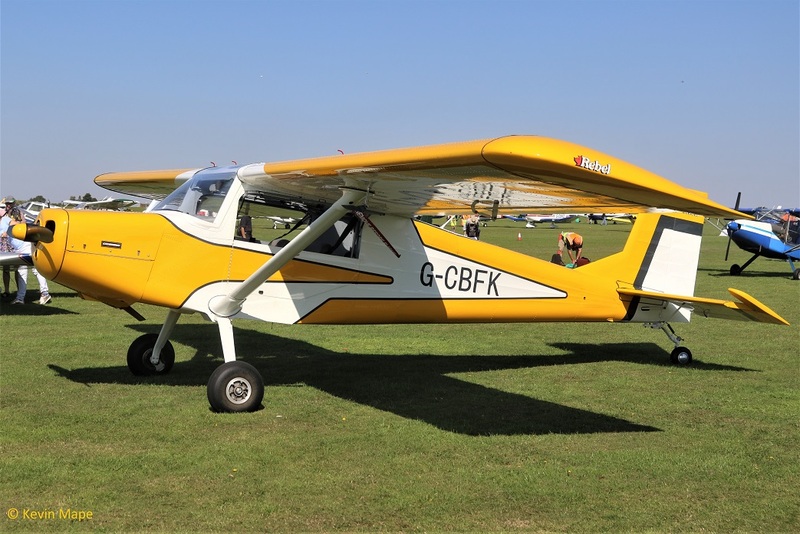 G-BKVG -Schiebe SF25E SuperFalke. Built 1983. 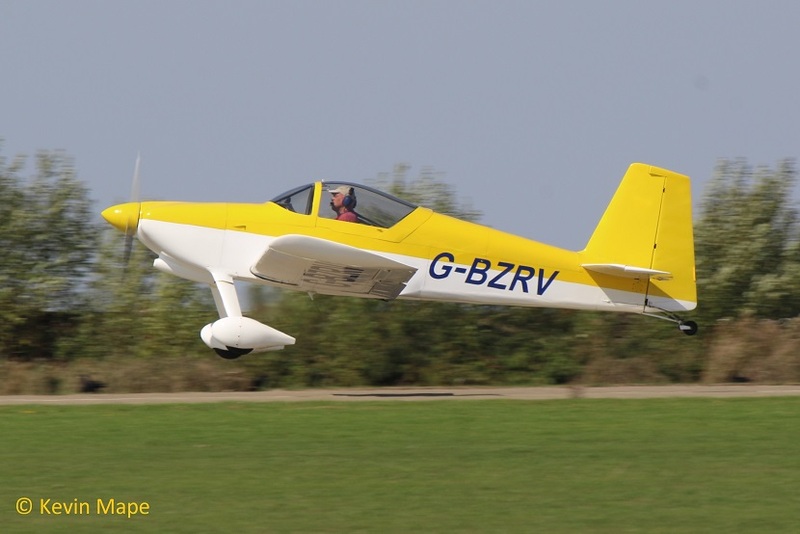 G-BMHL – Wittman W8 Tailwind. Built 1986. 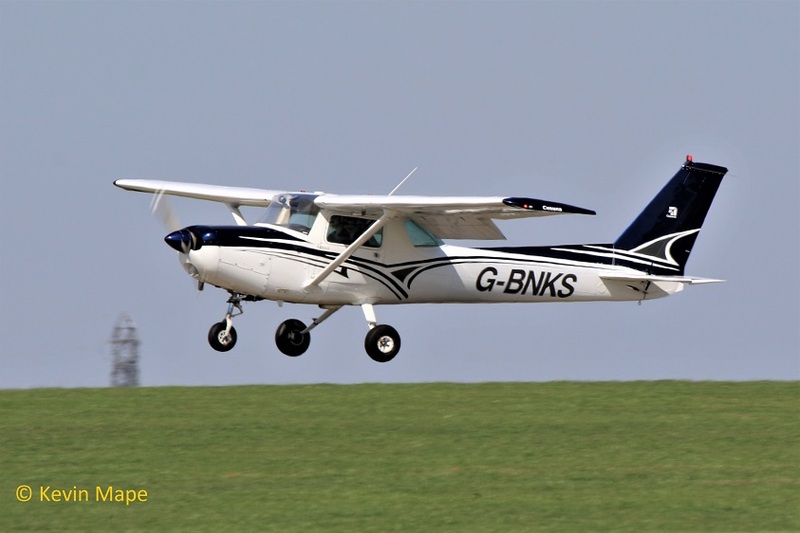 G-BNKS – Cessna 152 Built 1979. 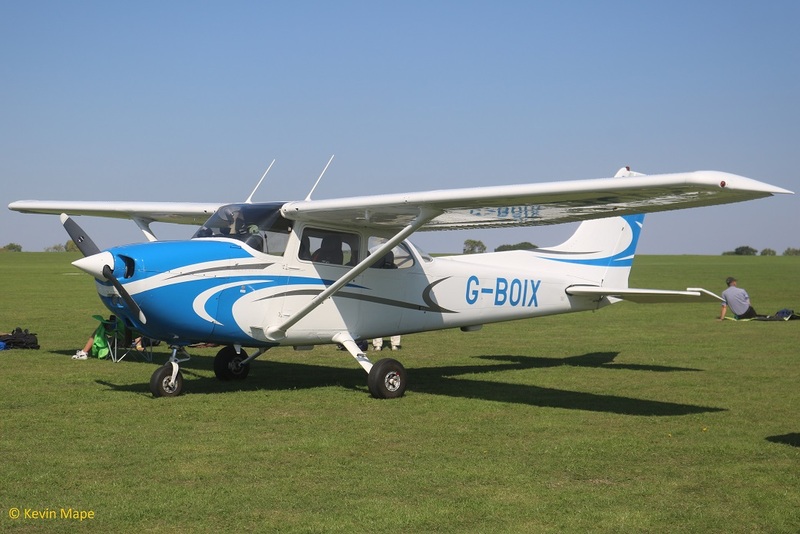 122/G-BOIX – Cessna 172N. Built 1979. 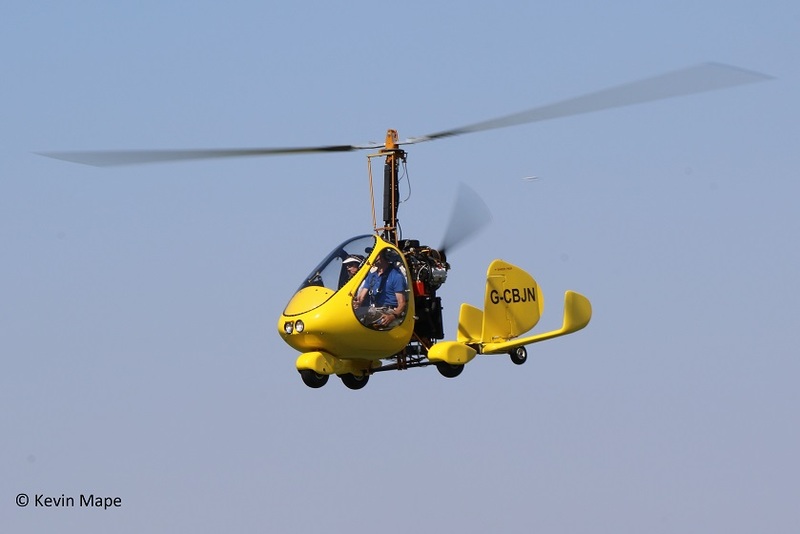 G-BOLU – Robin R3000-120. Built 1985. 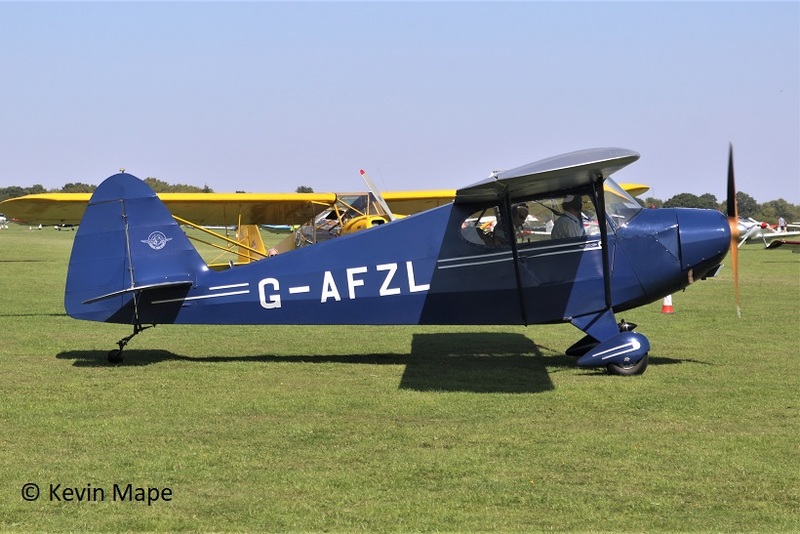 G-BPAJ – DH82A Tiger Moth. built 1940. 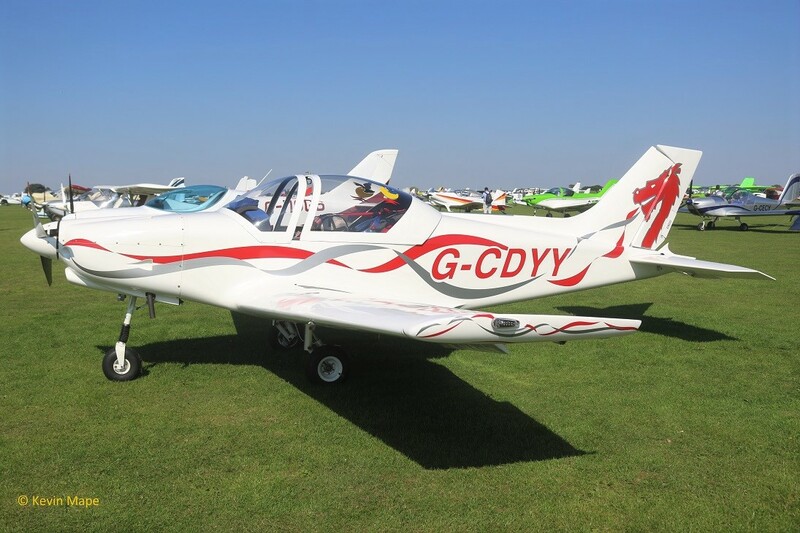 G-BPVK – Varga 2150A Kachina. Built 1977. 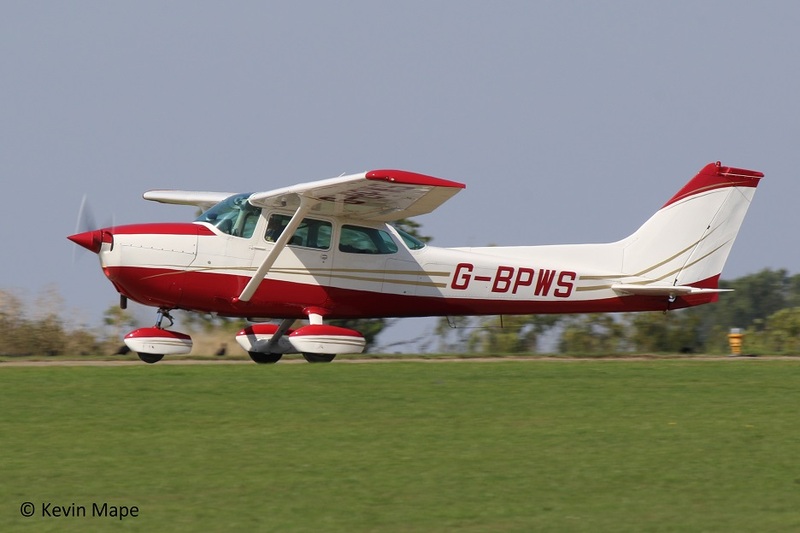 G-BPWS – Cessna 172P. Built 1981. 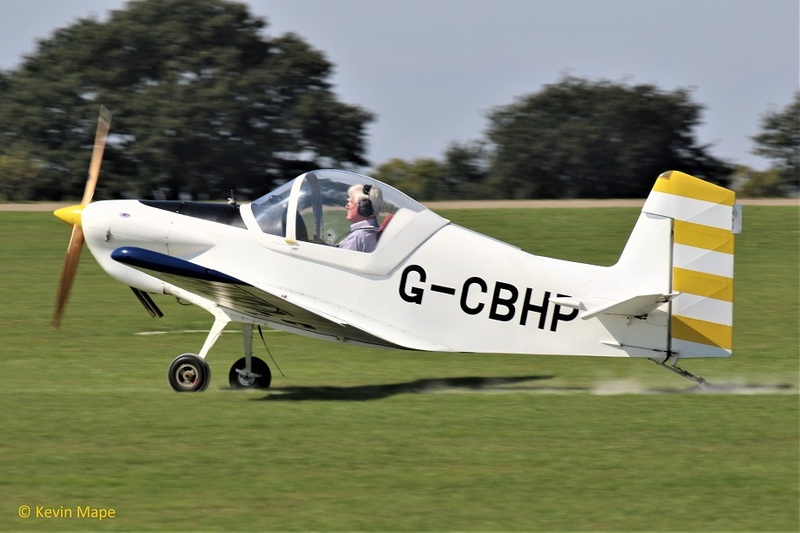 G-BPYJ – Wittman W8 Tailwind. Built 1990. 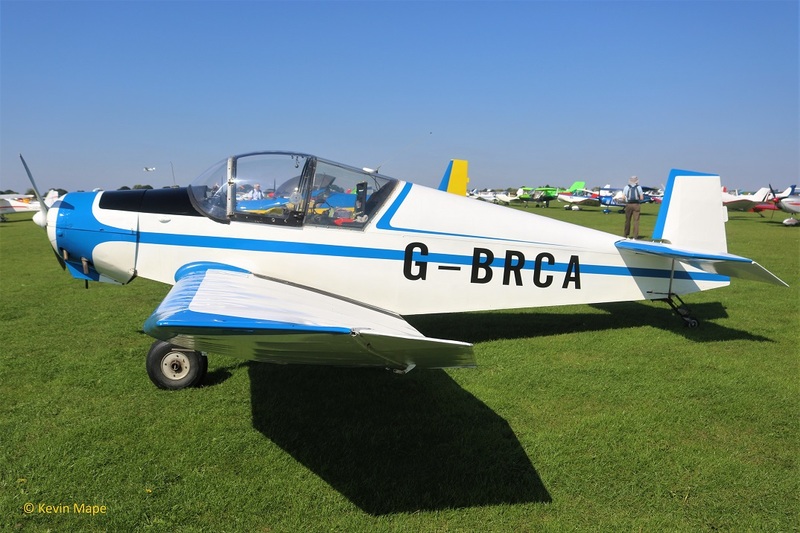 G-BRCA – Jodel D.112. Built 1963. 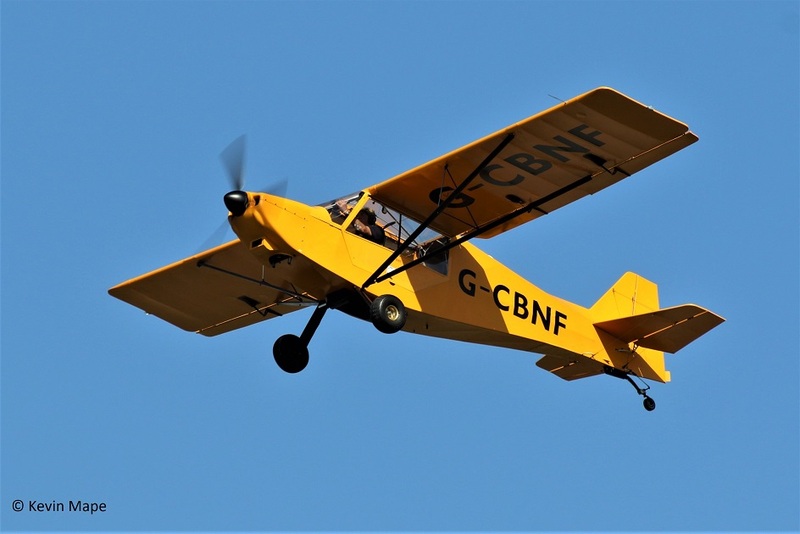 G-BRHP – Aeronca L3B Grasshopper . Built 1942 . 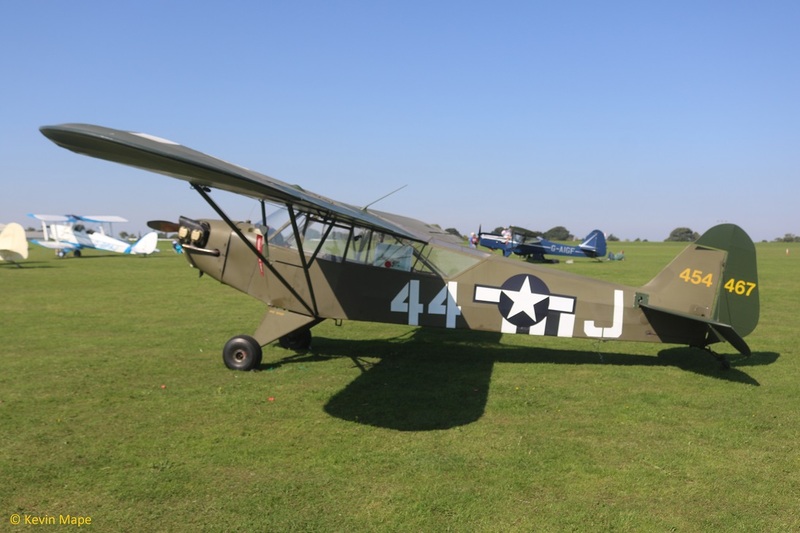 Wears 3-1923 USAAC . 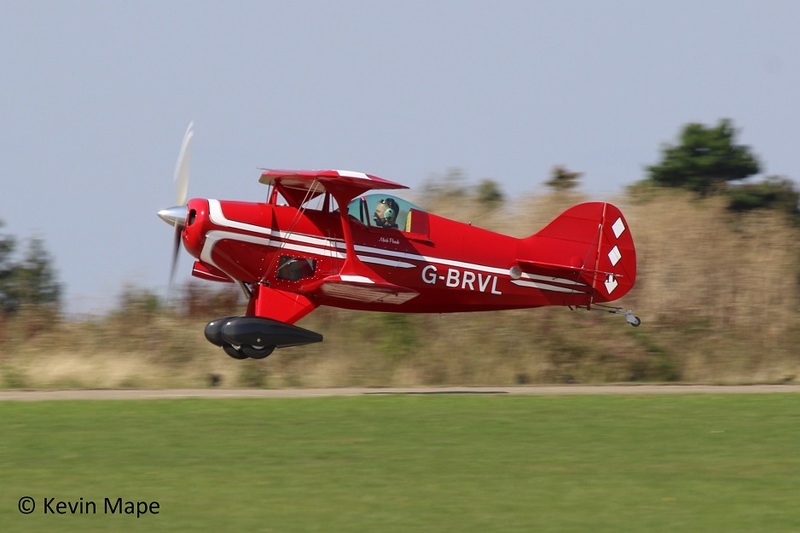 G-BRVL – Pitts S-1C. Built 1981. 203/G-BRNT – Robin DR400/180 Regent. Built 1989. 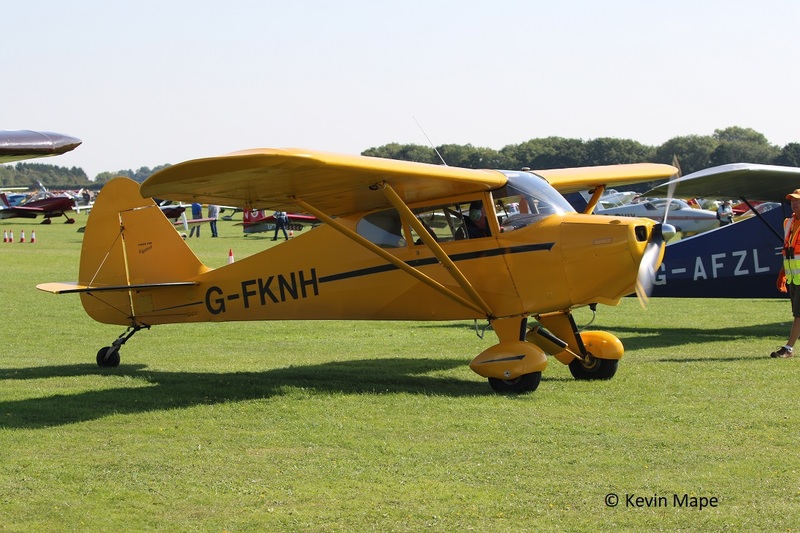 189/G-BRWR – Aeronca 11AC.Built 1946. 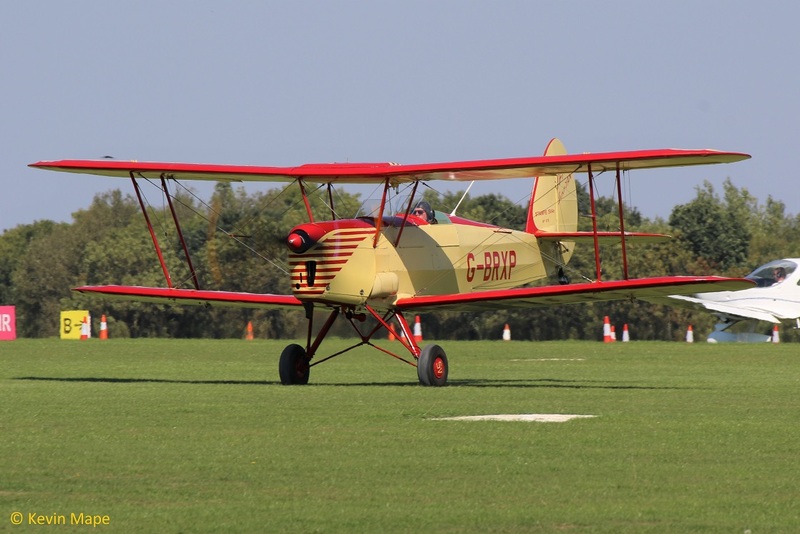 G-BRXP – SV-4C Stampe. Built 1948. 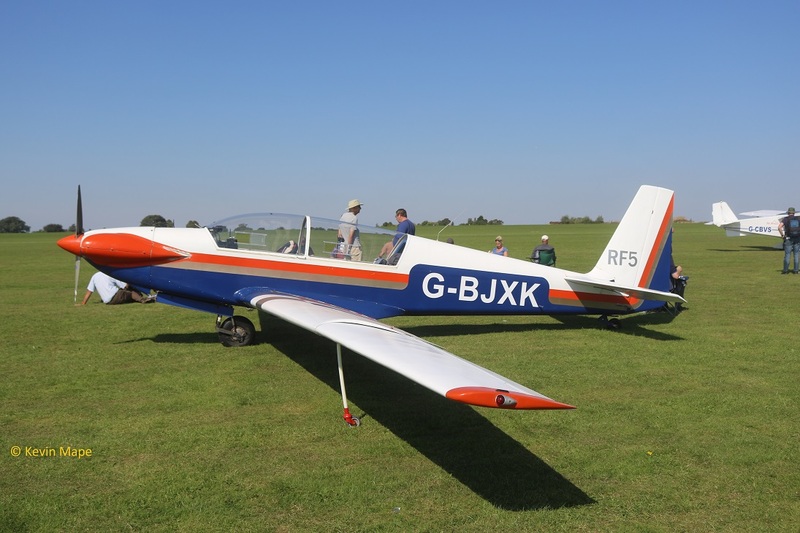 G-BSYF – Luskcombe 8E Silvaire Deluxe. Built 1946. 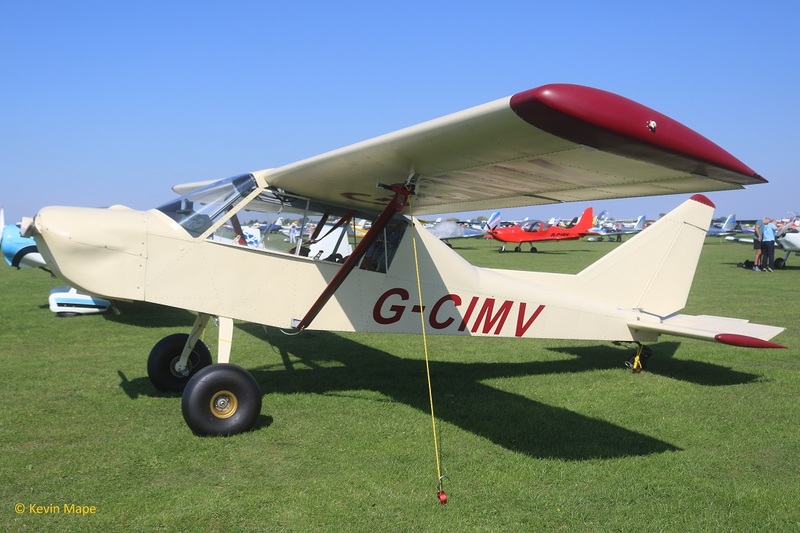 G-BTRI – Aeronca 11CC. Built 1948. 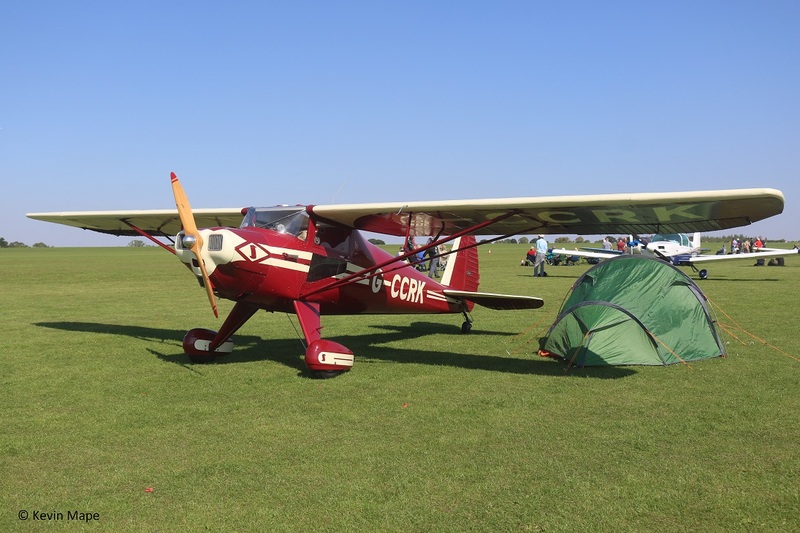 G-BUCO – Pietenpol Air Camper. Built 1992. G-BUTD – Vans RV-6. Built 1993. 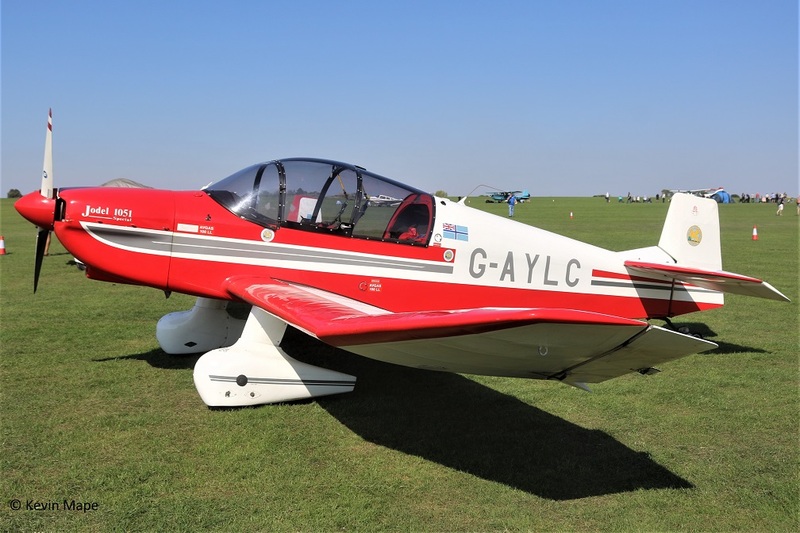 G-BUYS – Robin DR4-00/180. Built 1993. 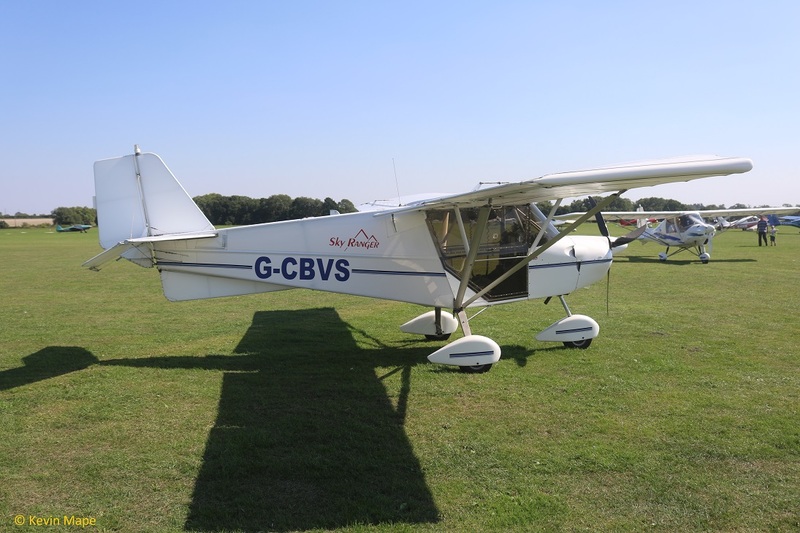 G-BVDC – Vans RV-3. Built 1994. 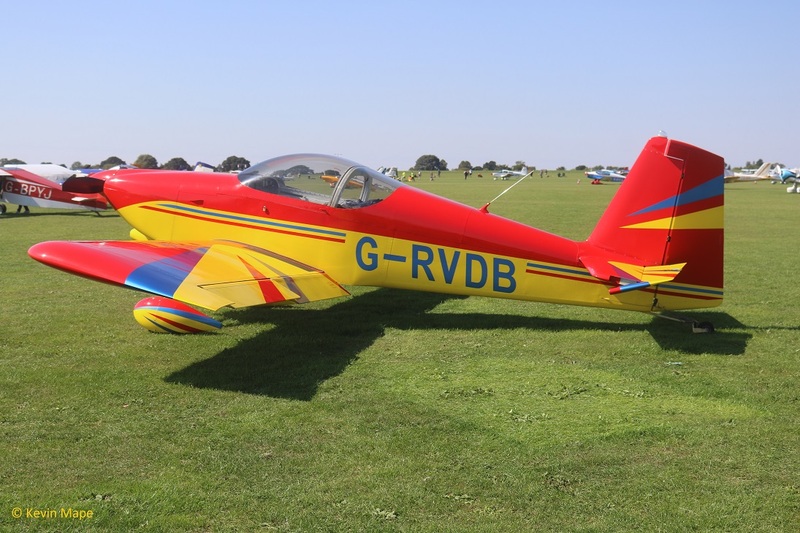 G-BVLR – Vans RV-4. Built 2014. 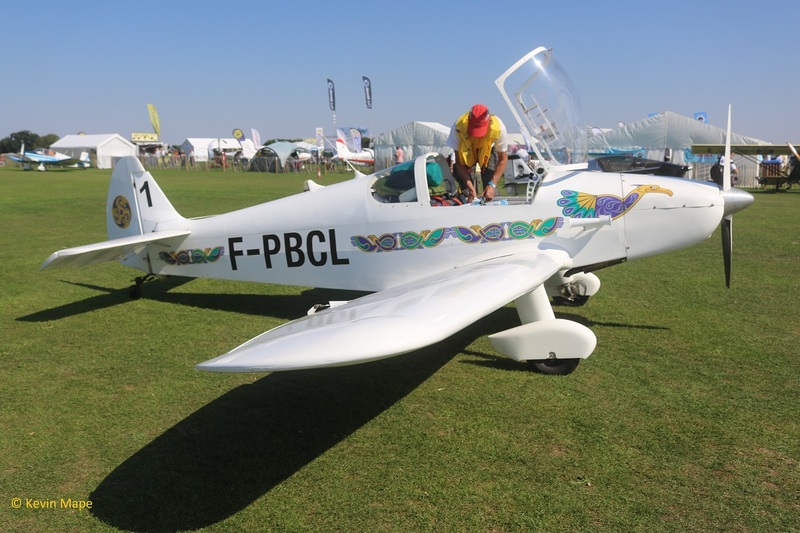 227/G-BWMB – Jodel D119. Built 1956. 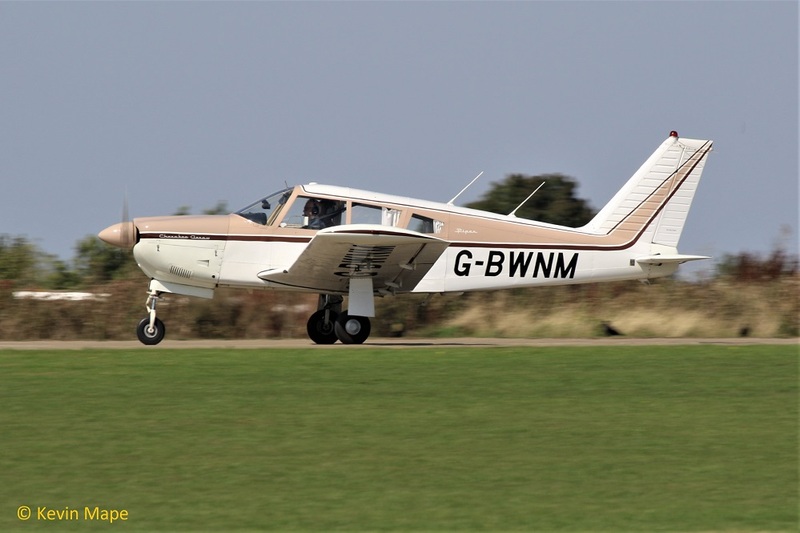 G-BWNM – Pa-28R-180 Arrow. Built 1968. 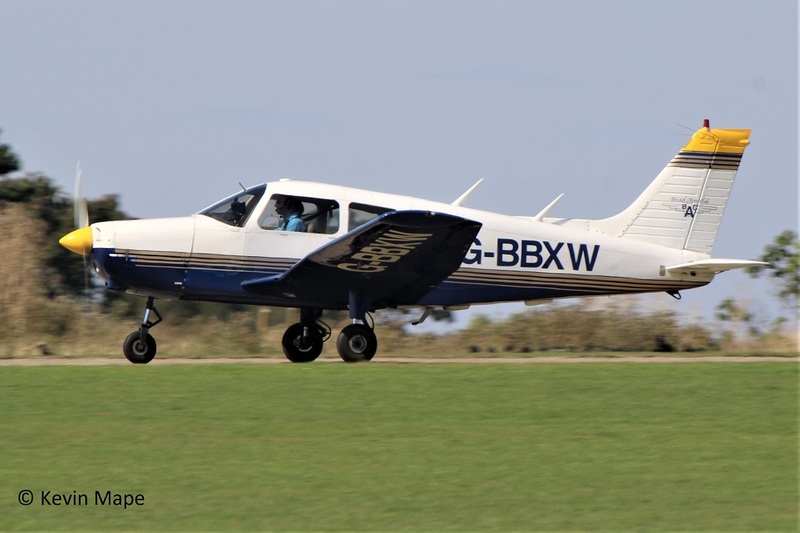 G-BXFE – Cap 10B . Built 1981. 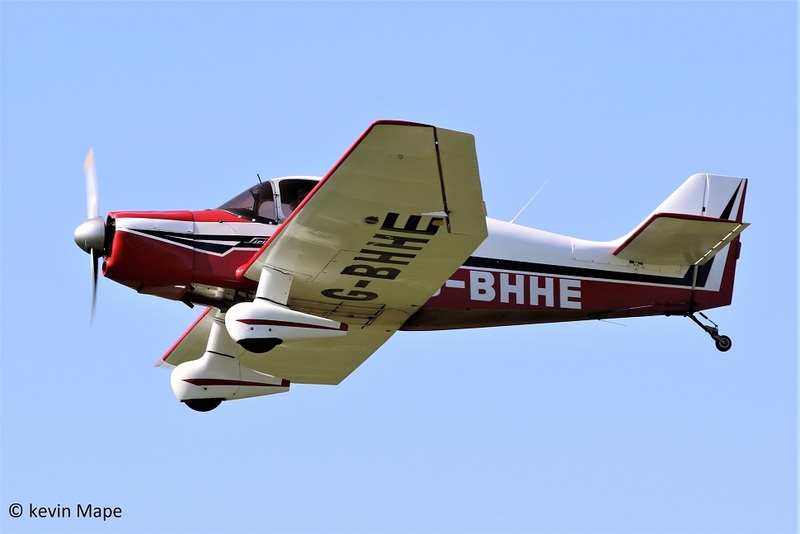 260/G-BXHY – Europa Built 1998. 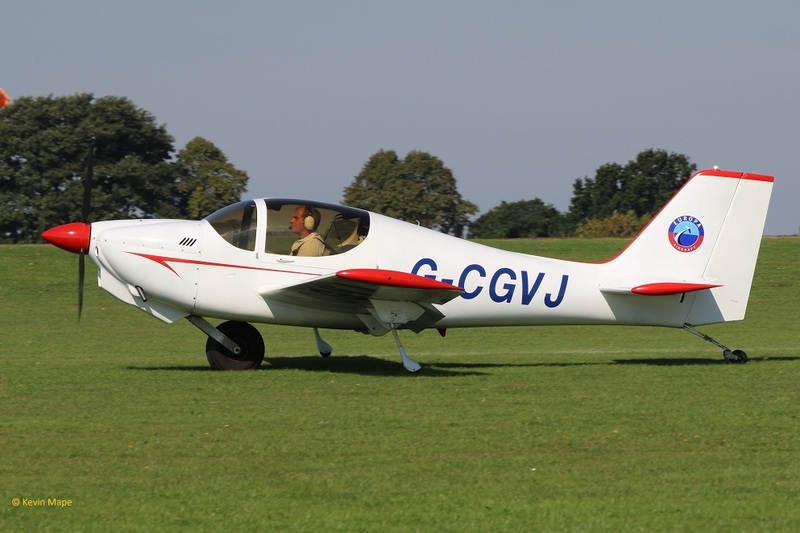 G-BXRV – Vans RV-4. Built 2002. 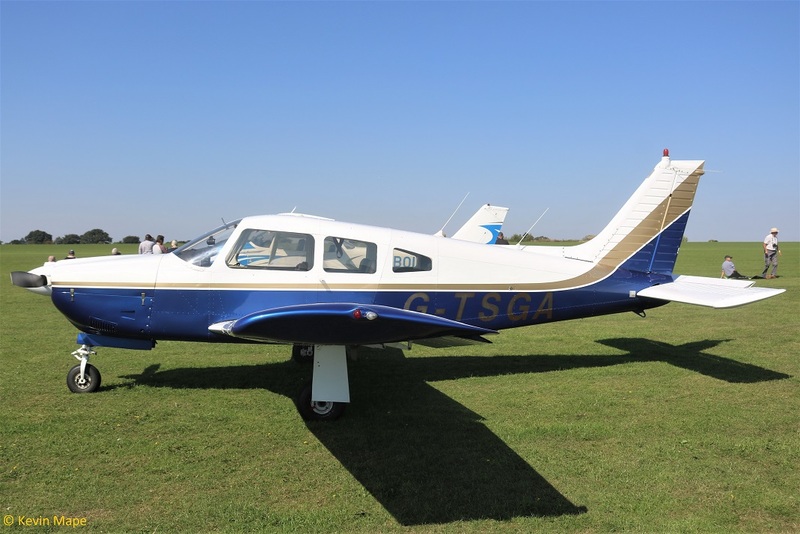 G-BYEE – Mooney M20K . Built 1980. 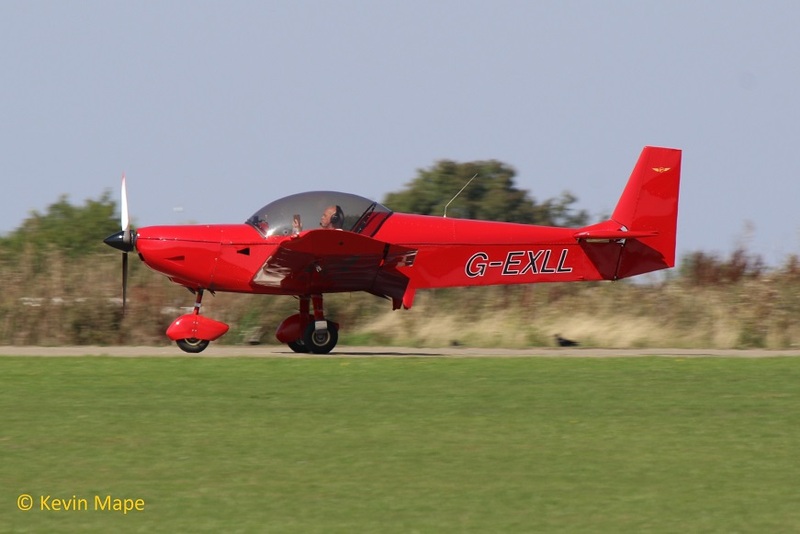 204/G-BYEL – Vans RV-6. Built 2000. 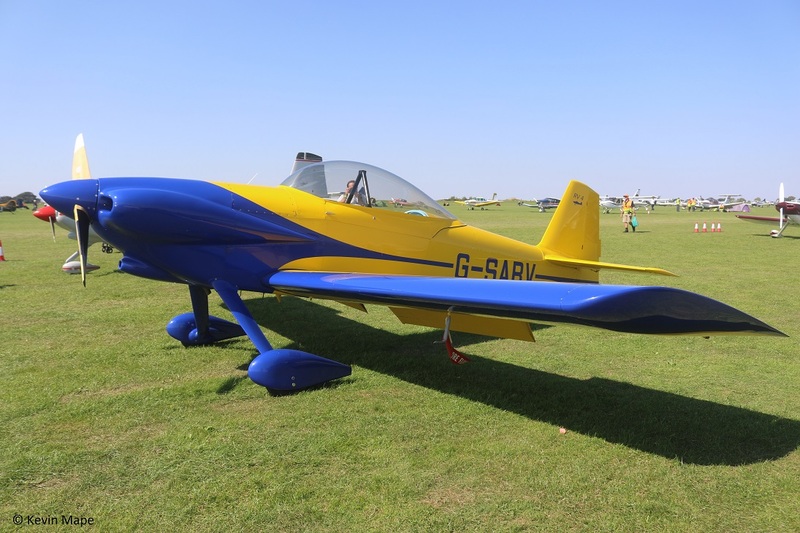 G-BZGF – Rans S6-ES. Built 2000. 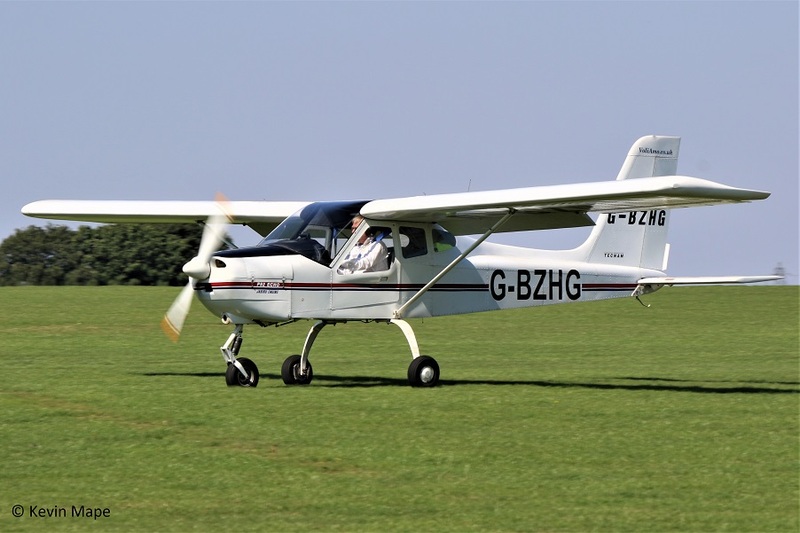 220/G-BZHG – Tecnam. P92-EM Echo. Built 2000. 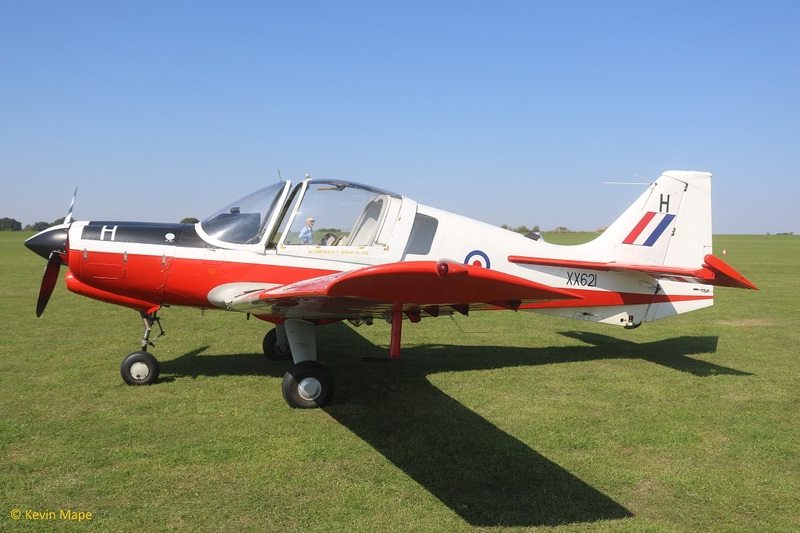 G-BZME – Bulldog T1 – wears XX698 RAF coded 9. 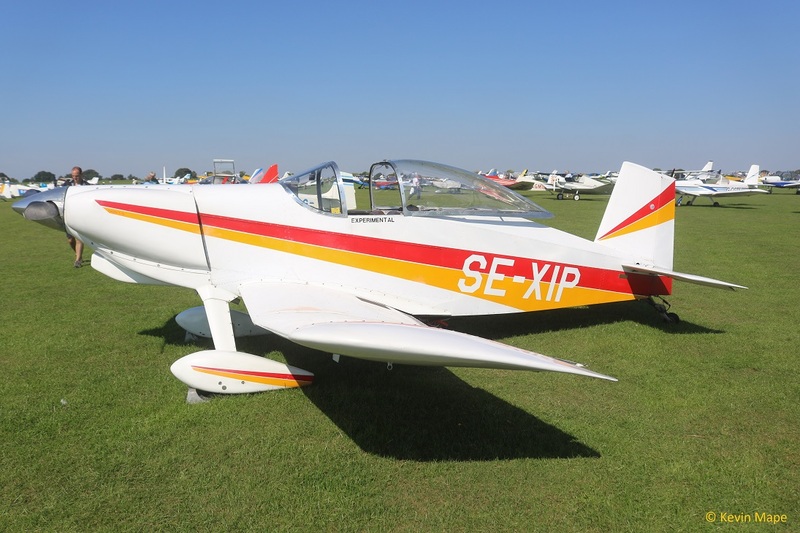 264/G-BZNY – Europa XS. Built 2002. 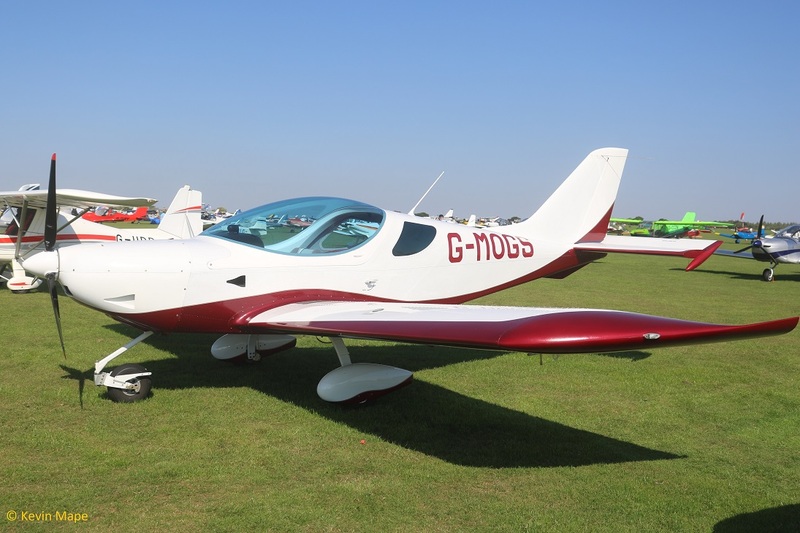 G-BZRV – Vans RV-6. Built 2002. 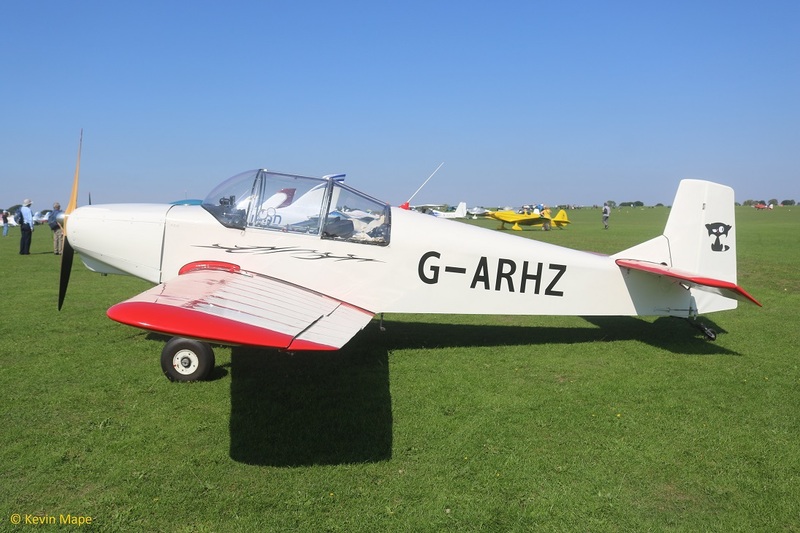 G-BZRY – Rans S6-ES. Built 2001. 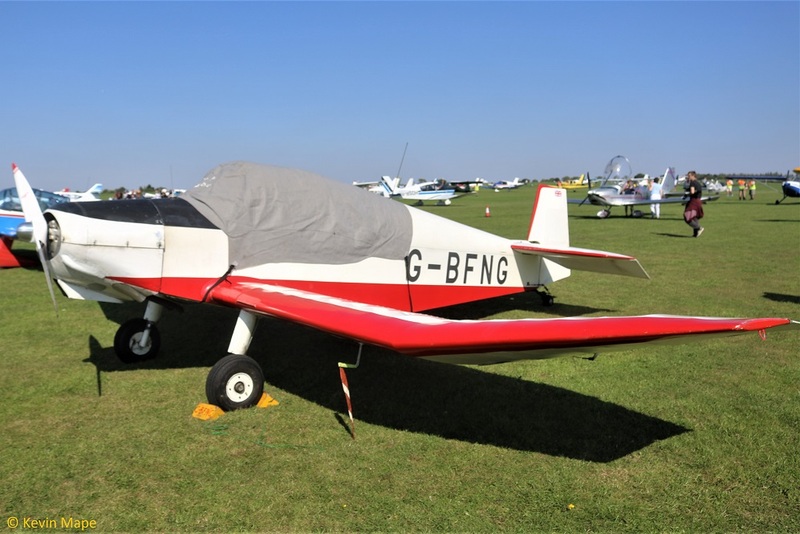 G-BZWJ – Streak Shadow. – Built 2002. 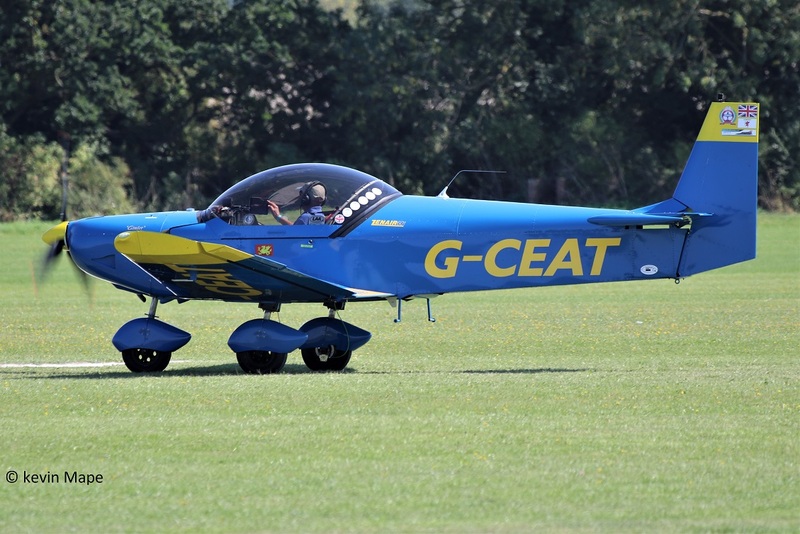 G-CBEF – Bulldog T1 wears XX621 coded H RAF . Built 1974. G-CBFK – Rebel. Built 2002. 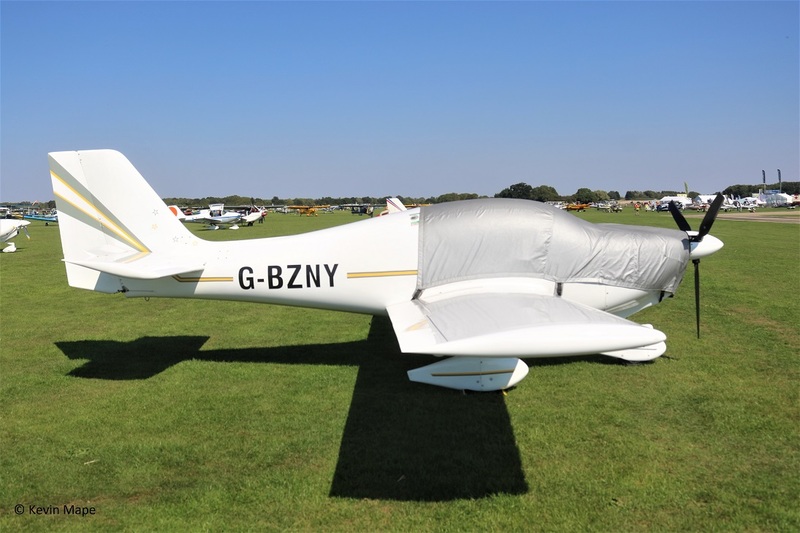 G-CBGB – Zenair CH601UL. built 2001. 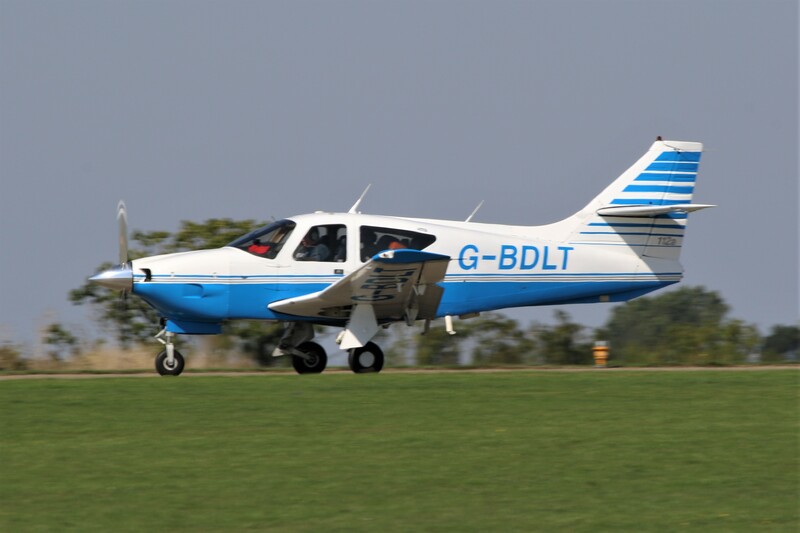 167/G-CBGC – Socata TB10 Tobago. Built 1993. 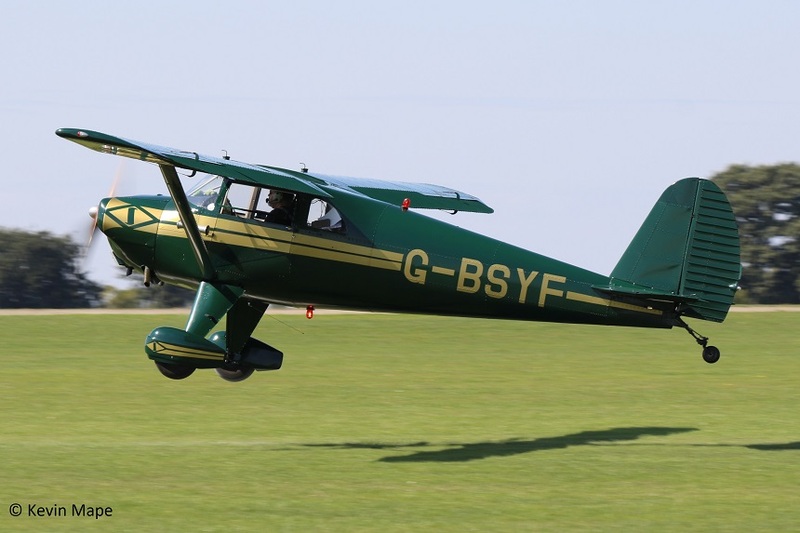 G-CBHP – Corby CJ-1 Starlet. Built 2005. 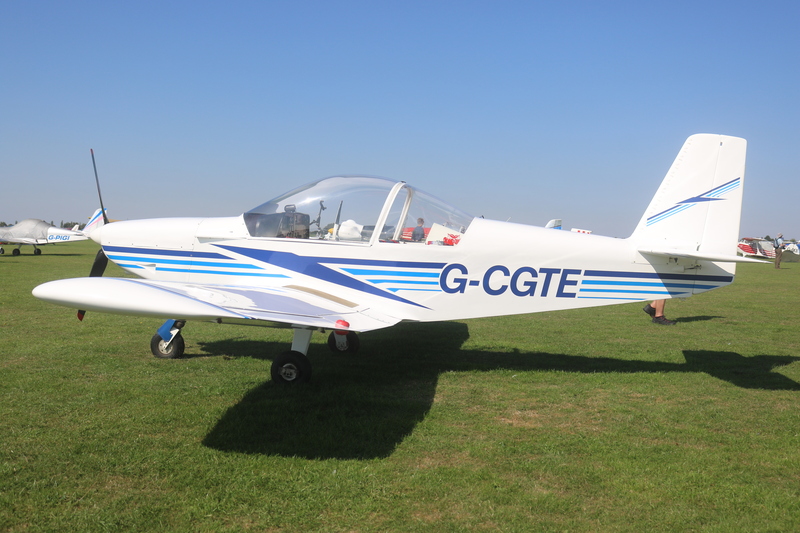 200/G-CBJN – RAF 2000 GTX-SE. Built 2014. 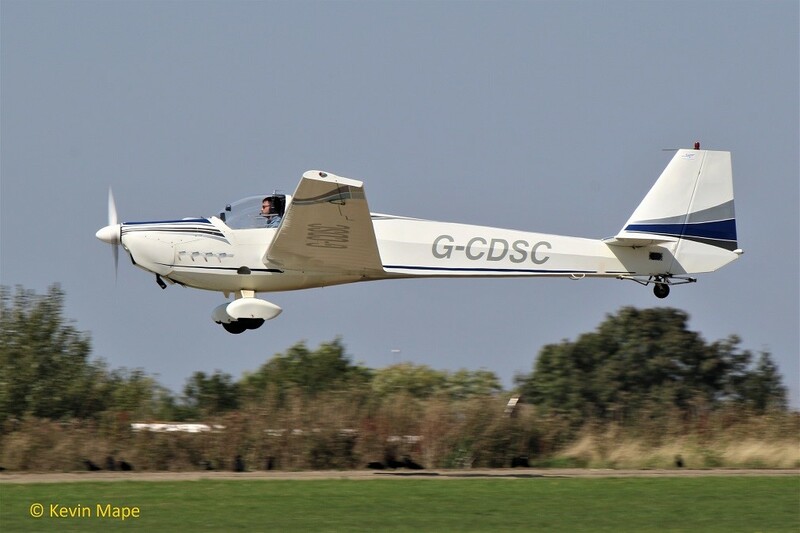 277/G-CBLZ – Rutan Long – Eze. Built 1988. 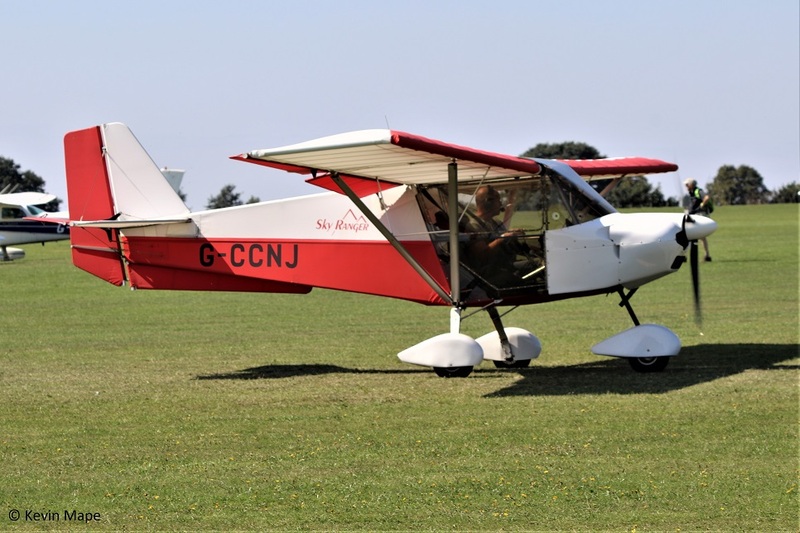 G-CBNL – MCR-01 Club. Built 2004. 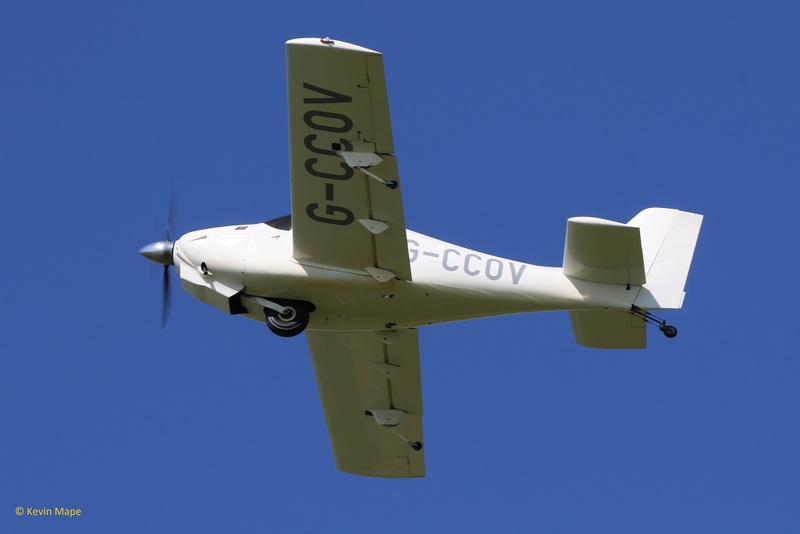 G-CBVS – Skyranger Swift 912(1). Built 2003. 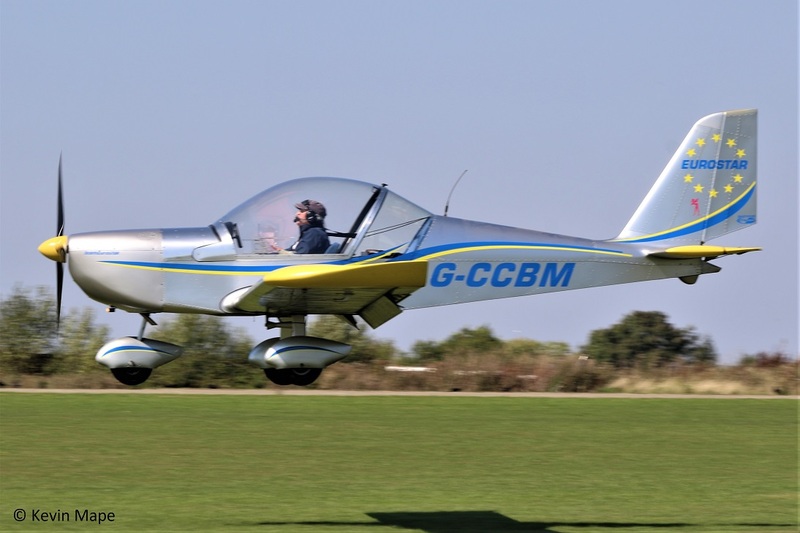 G-CCBM – EV-97 Eurostar UK. Built 2003. 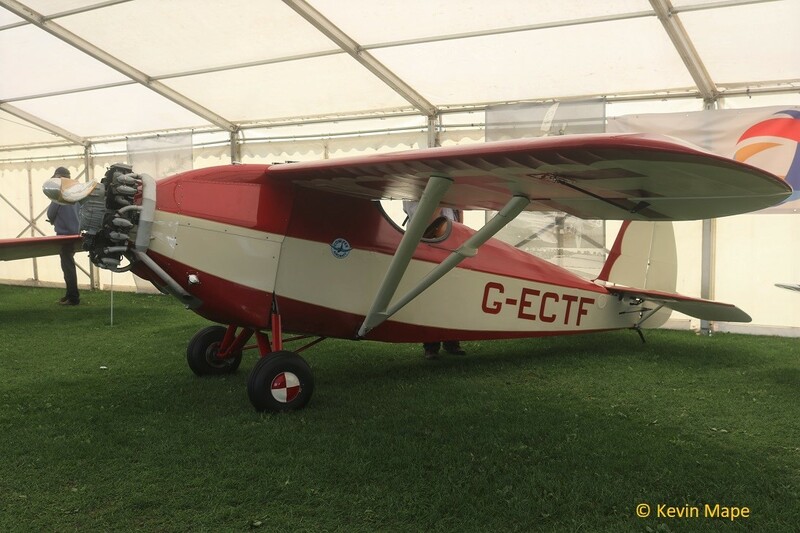 G-CCEF – Europa. Built 2004. 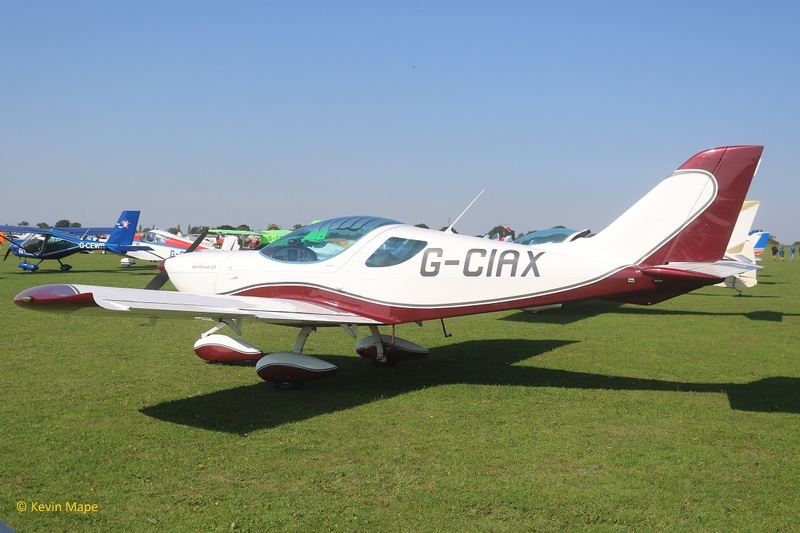 G-CICA – Europa XS. Built 2013. 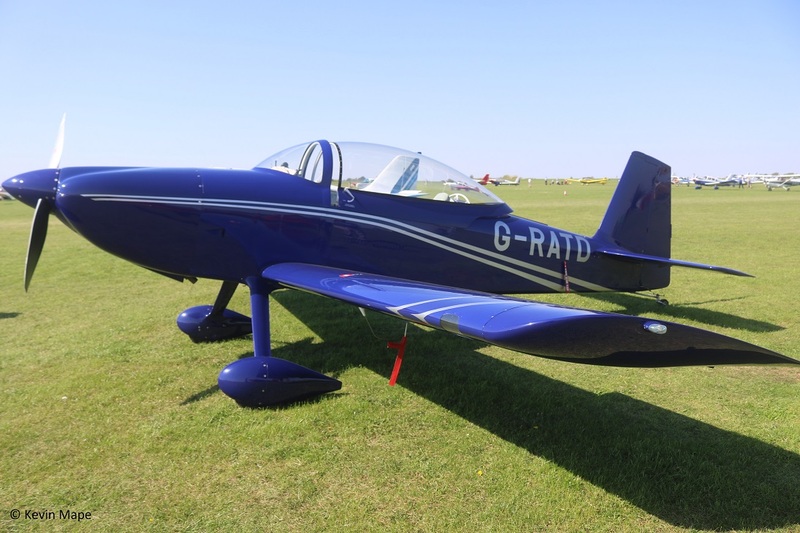 G-CIED – Fox16T/RIP1. Built 2014. 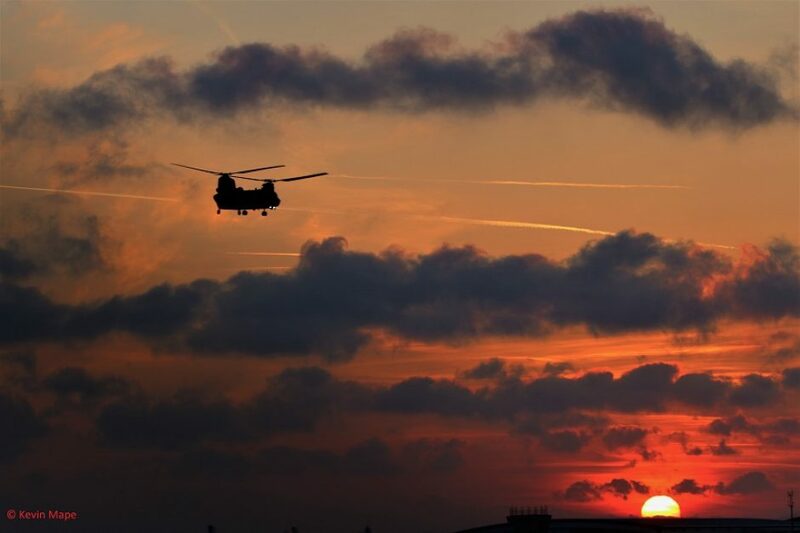 G-CJLD – Misson M108. Built 2017. 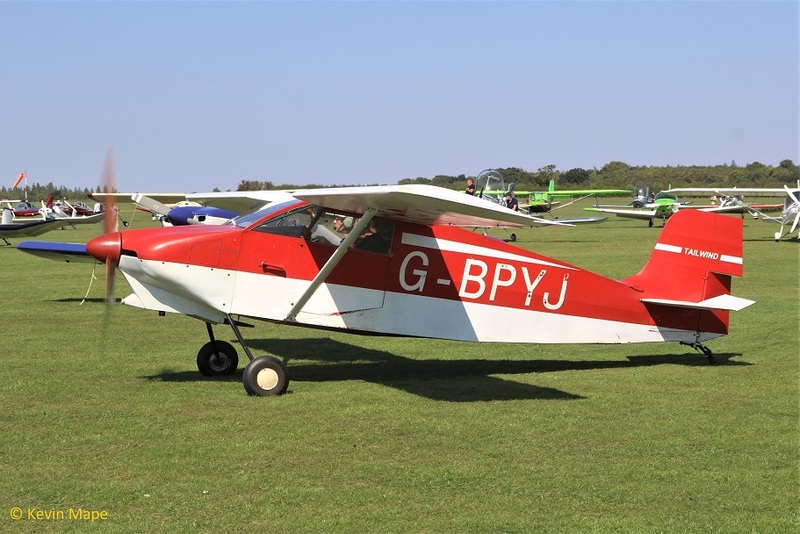 G-CCNJ – Skyranger 912(2). Built 2004. 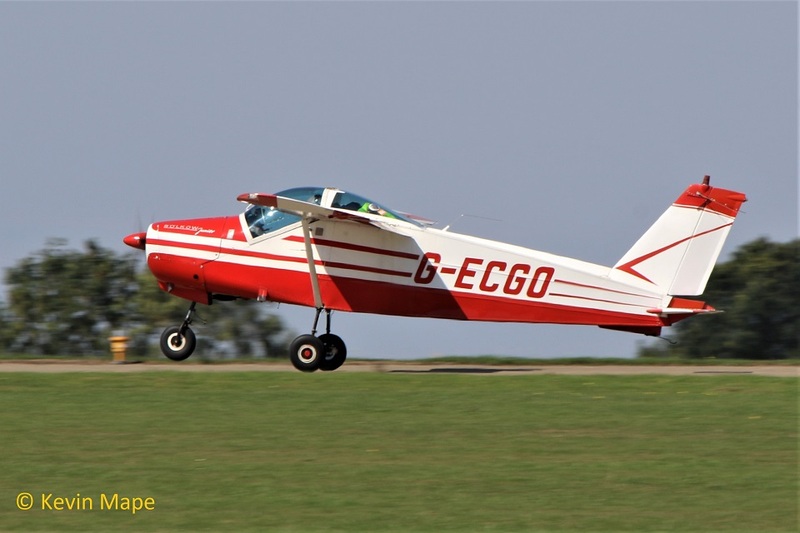 G-CCOV – Europa XS . Built 2004. 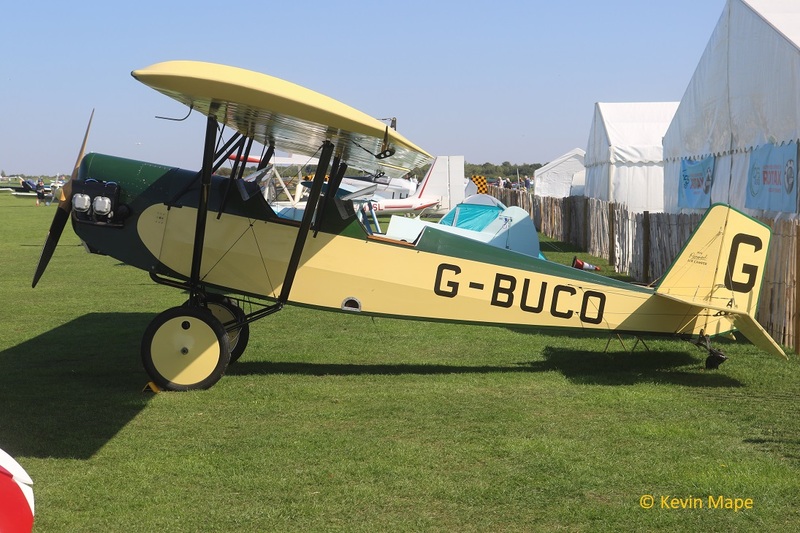 G-CCRK – Luscombe 8A Silvaire. Built 1946. 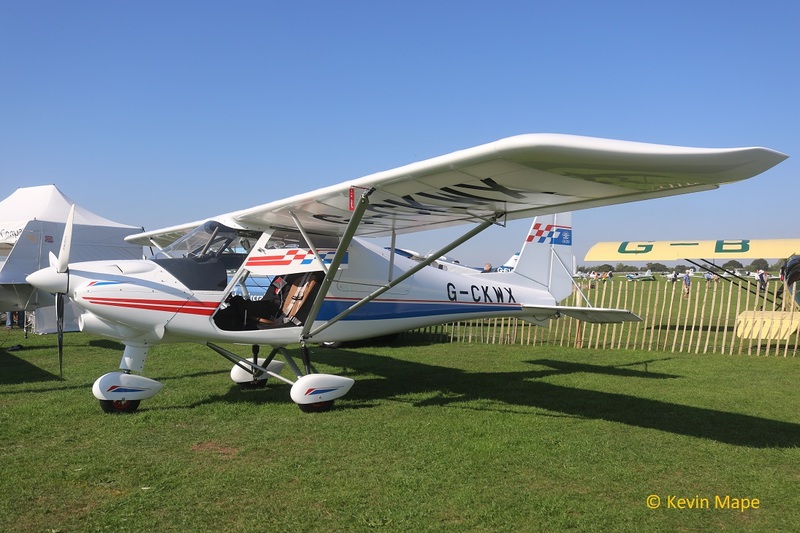 G-CCZN – Rans S6 -ES. Built 2005. 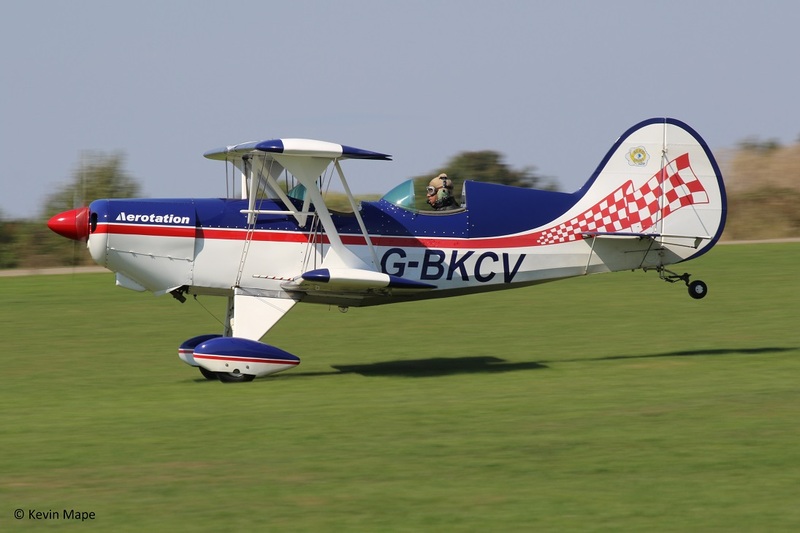 G-CDMY – Pa-28-181 Warrior II. Built 1979. 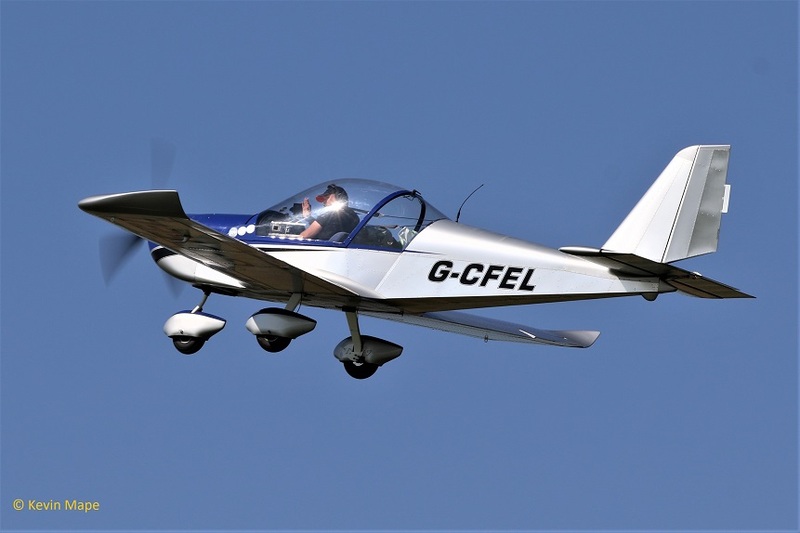 G-CDSC – Scheibe SF25C Falke . Built 1999. 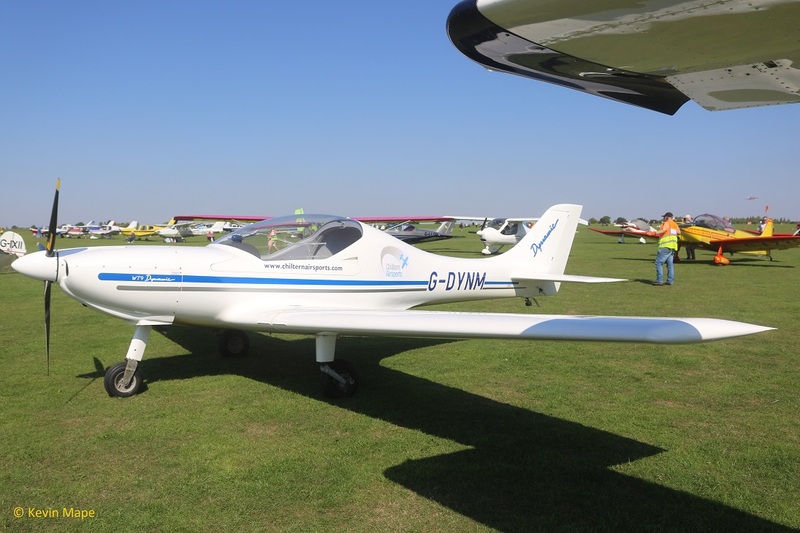 G-CDYY – Pioneer 300. Built 2007. 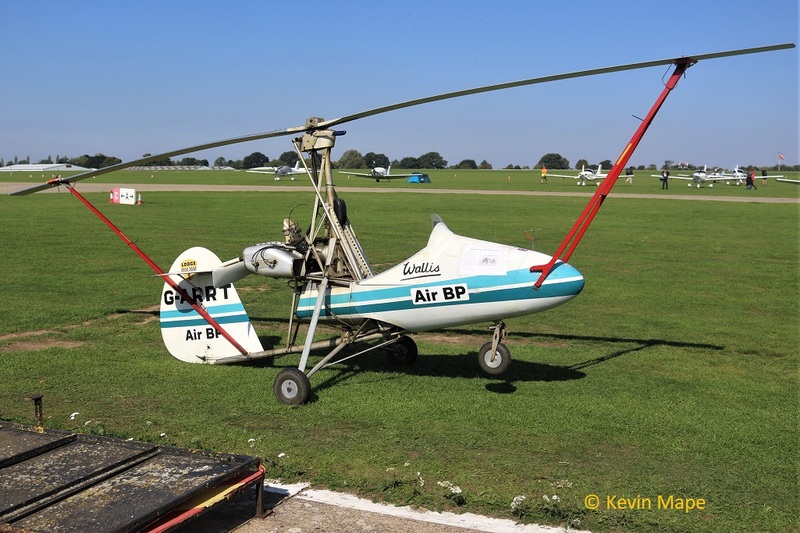 211/G-CEAT – Zenair CH-601. Built 2007. 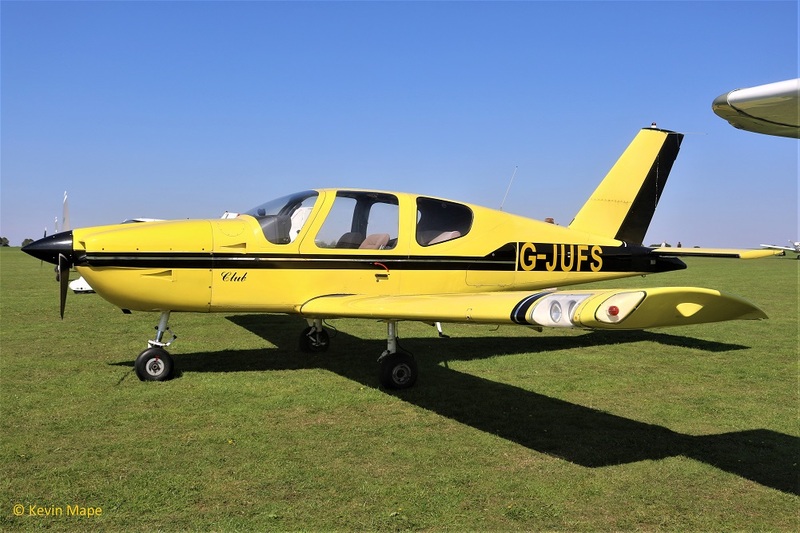 53/G-CEBP – EV-97 Eurostar UK. Built 2006. 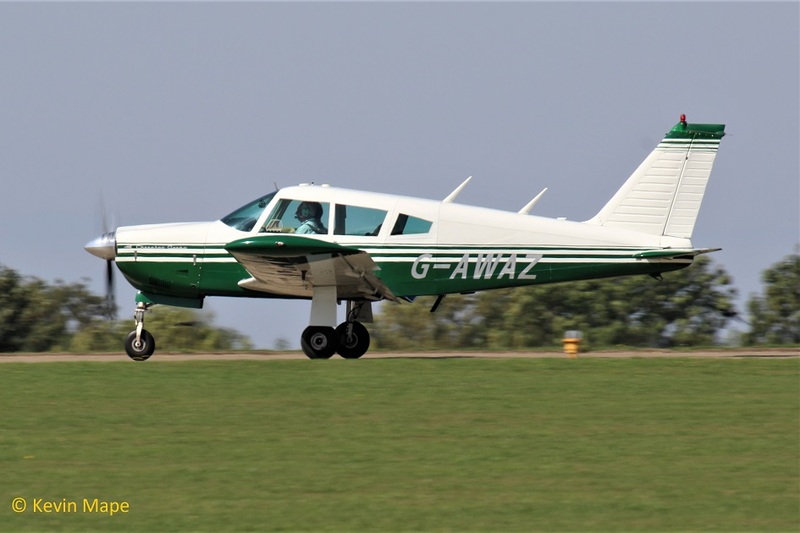 51/G-CEBZ – Zenair CH601 UL. Built 2006. 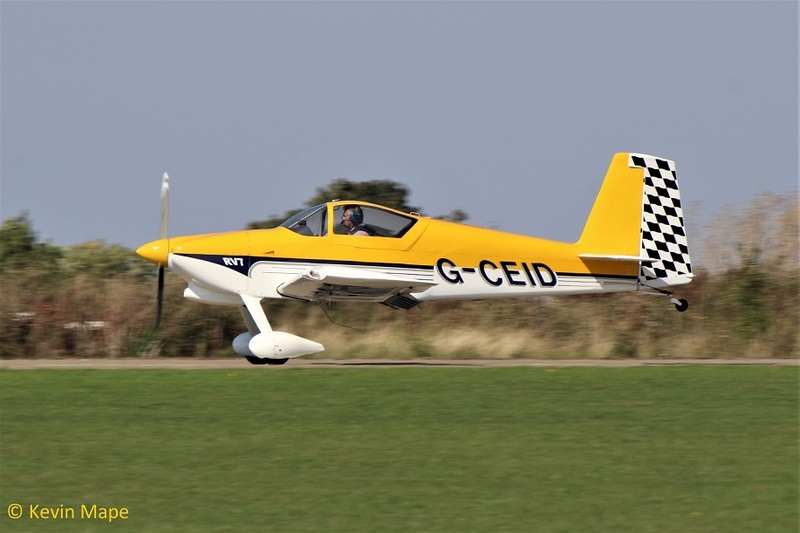 G-CEID – Vans RV-7. Built 2007. 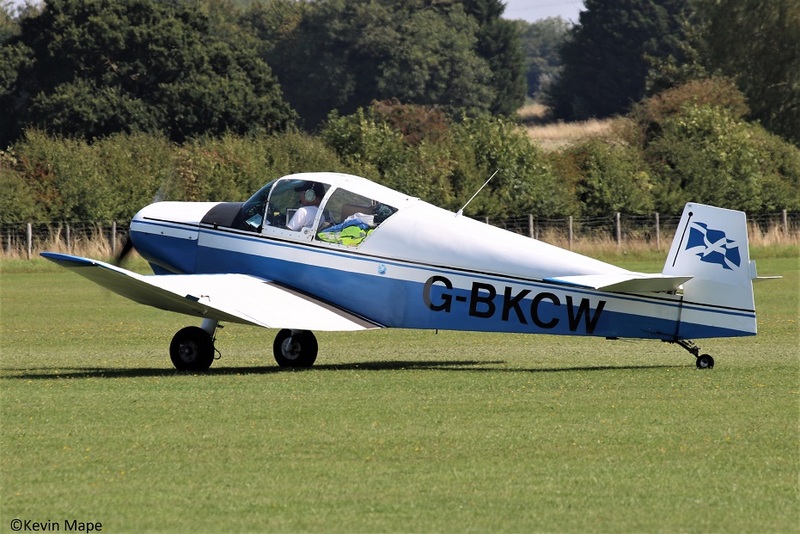 44/G-CEKD – CTSW . Built 2007. 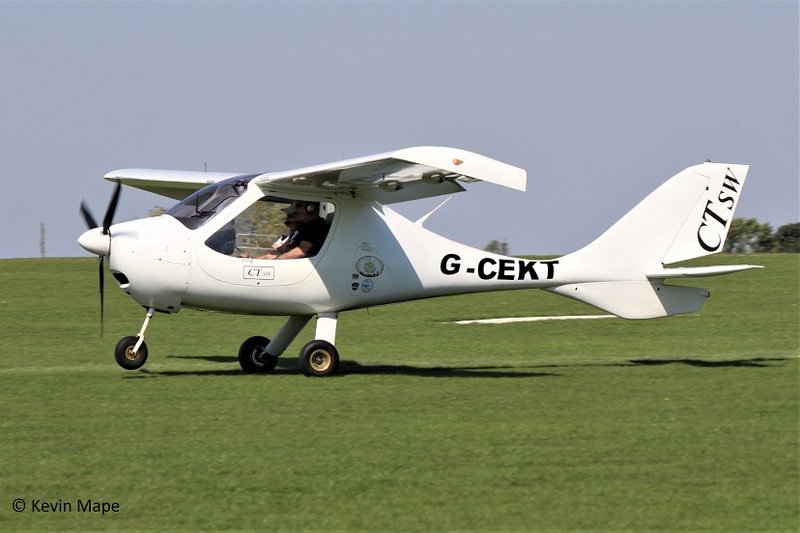 126/G-CEKT – CTSW . Built 2007. 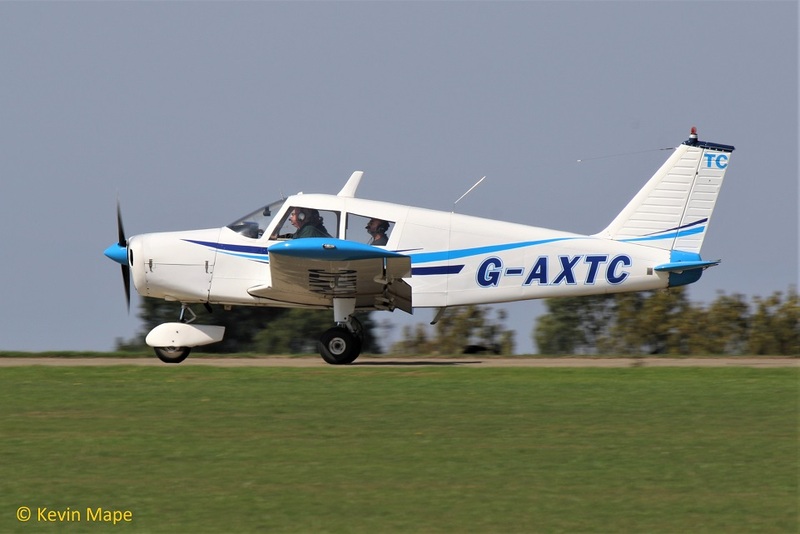 G-CETX – Pioneer 300. Built 2009. 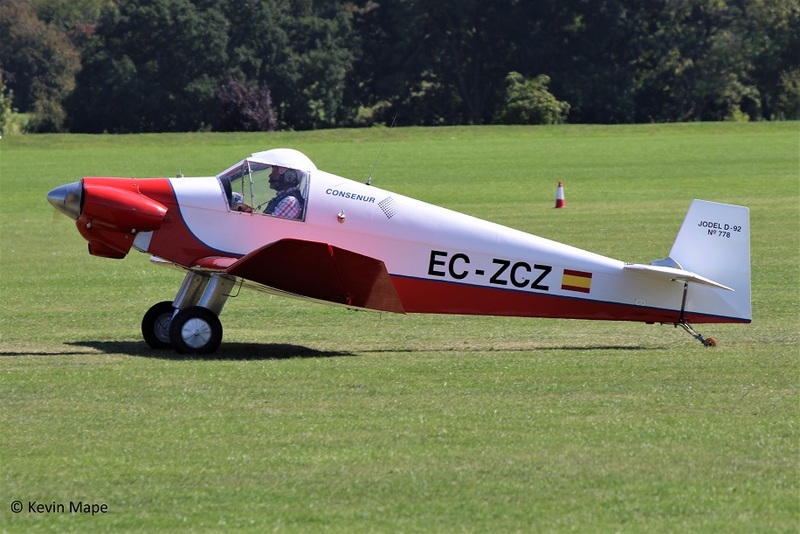 262/G-CEYK – Eurpoa XS . Built 2008. 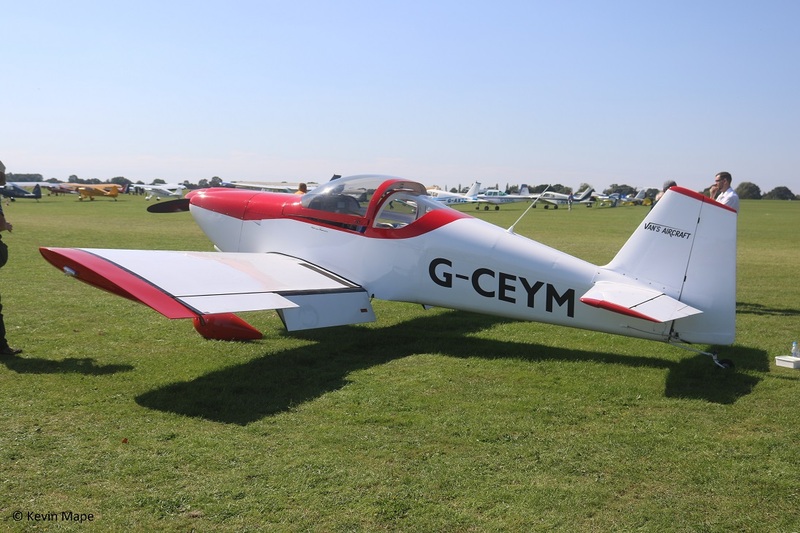 G-CEYM – Vans RV-6 .Built 2007. 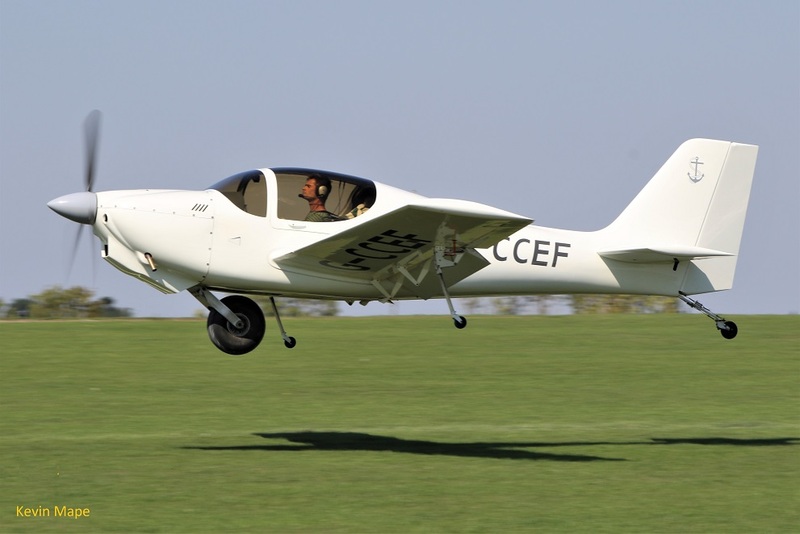 G-CFEL – EV-97A Eurostar UK. Built 2008. 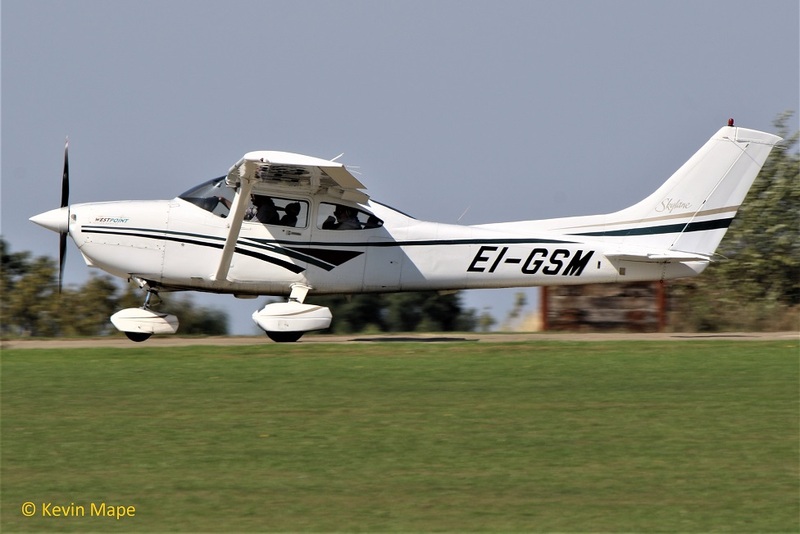 G-CFEZ – CZAW Sportscruiser. Built 2008. 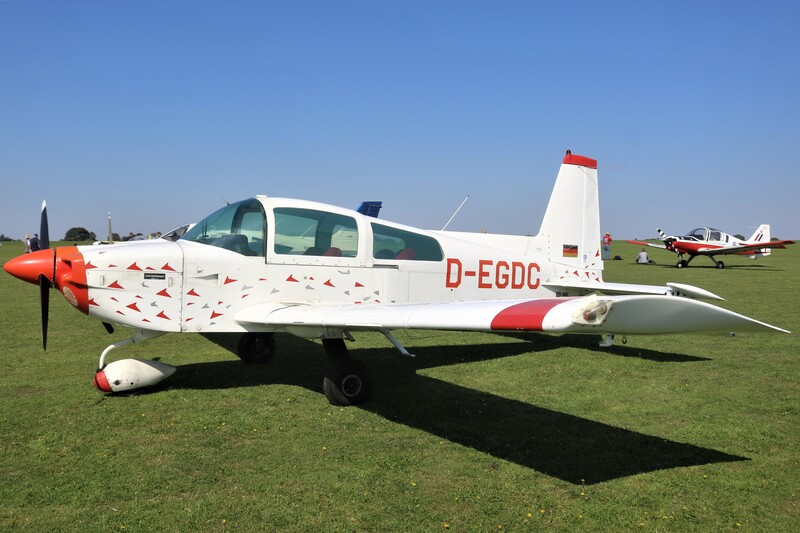 G-CFIU – CZAW Sportscruiser. Built 2008. 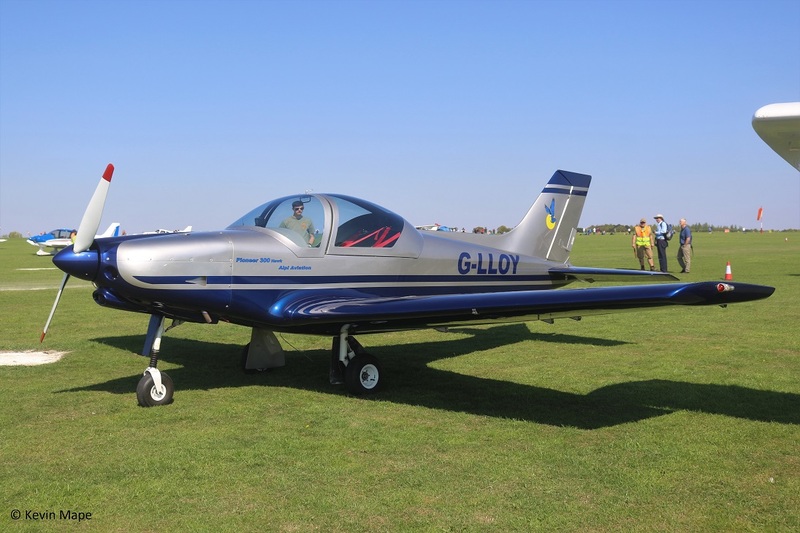 G-CFLO – Rotarsport UK MT-03. Built 2008. 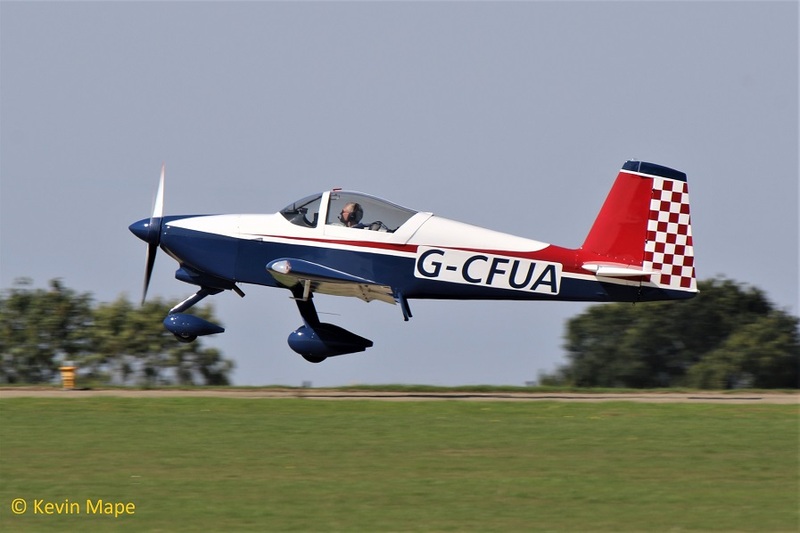 G-CFUA – Vans RV-9A . Built 2010. 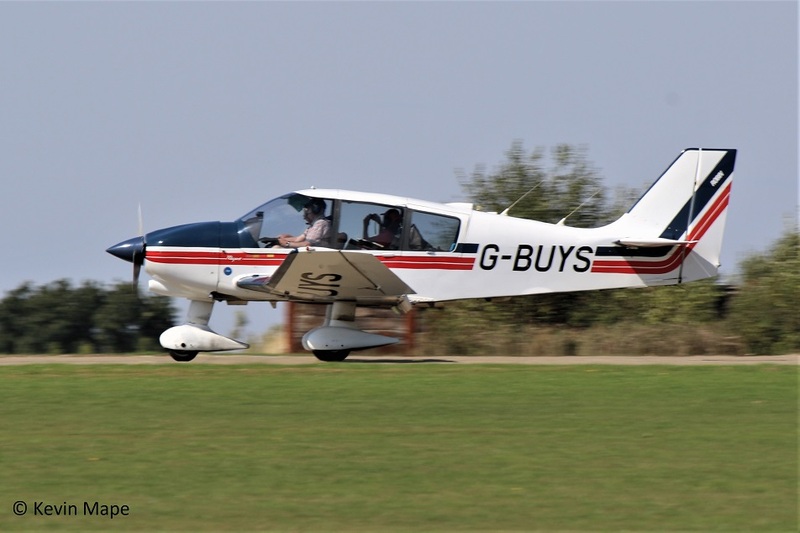 G-CGDH – Europa XS . Built 2004. 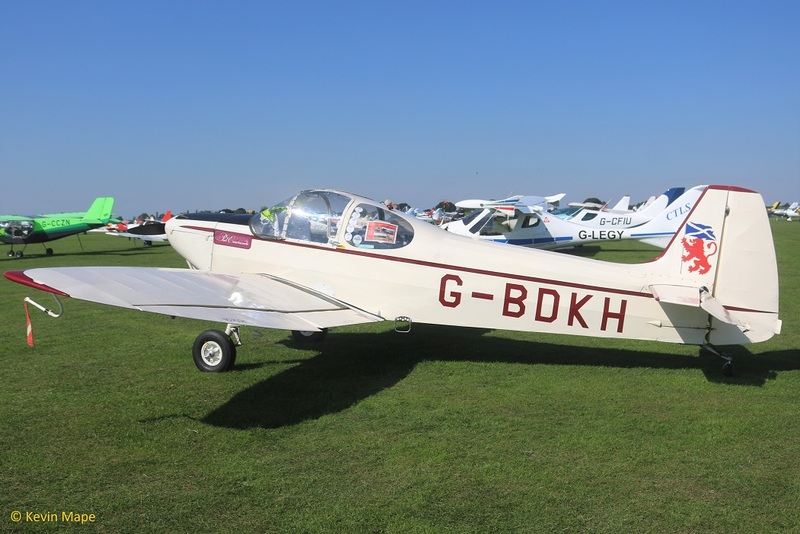 G-CGTE – Cherry BX-2 Built 2011. 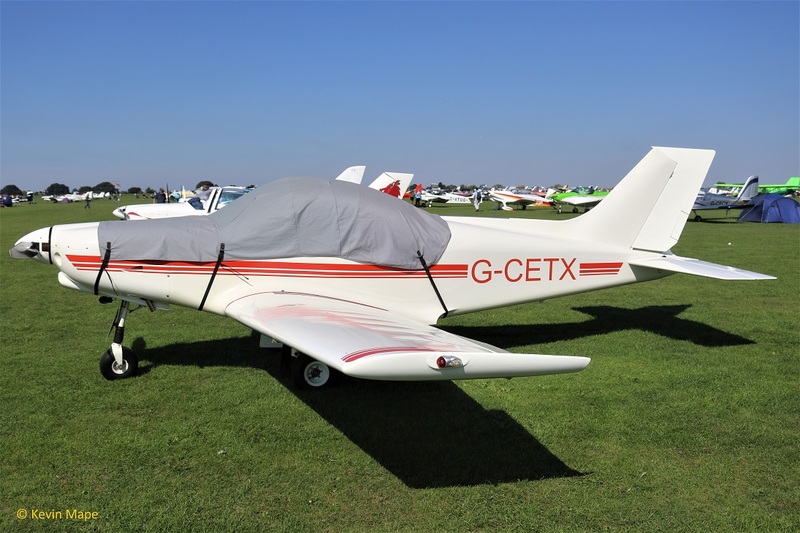 G-CGVJ – Europa XS. Built 2014. 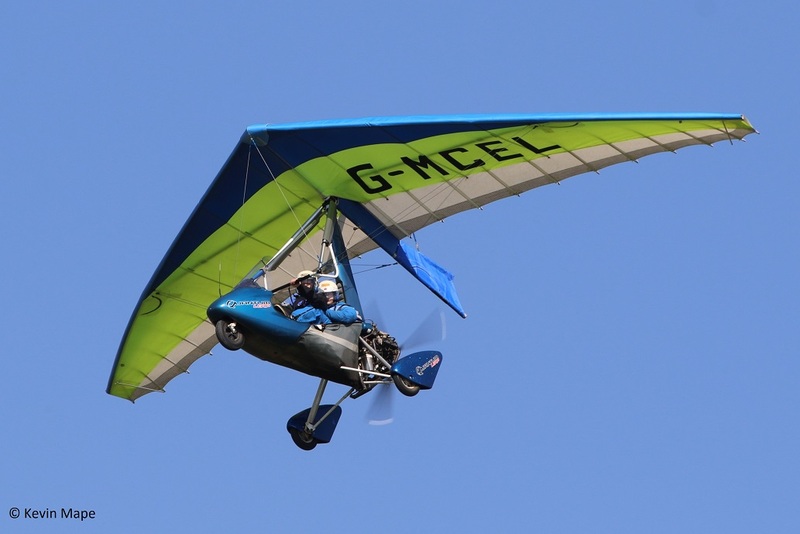 38/G-CIDX – Sonex. Built 2015. 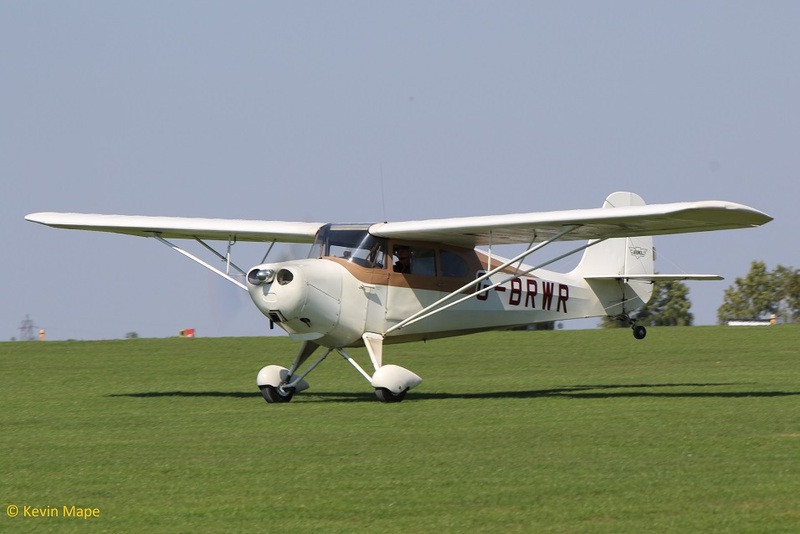 G-CIAX – CZAW Sportscruiser. Built 2013. 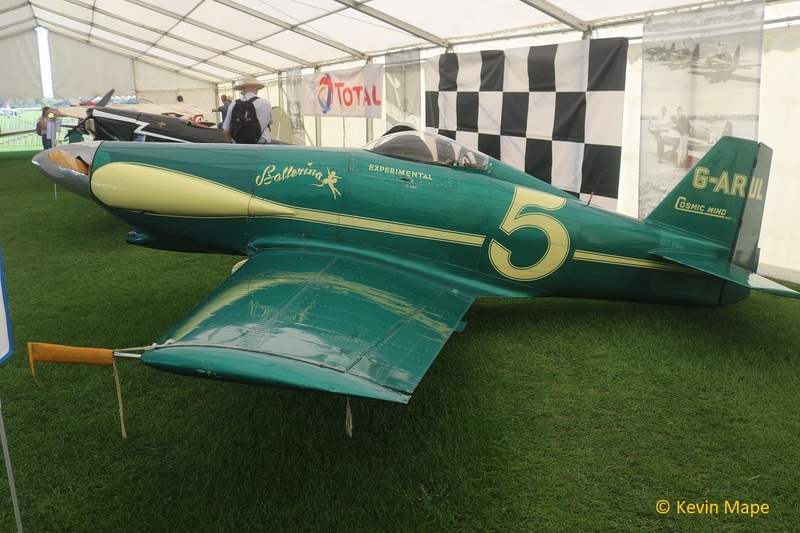 G-CILL – Bristell NG5 Speed Wing. Built 2014. 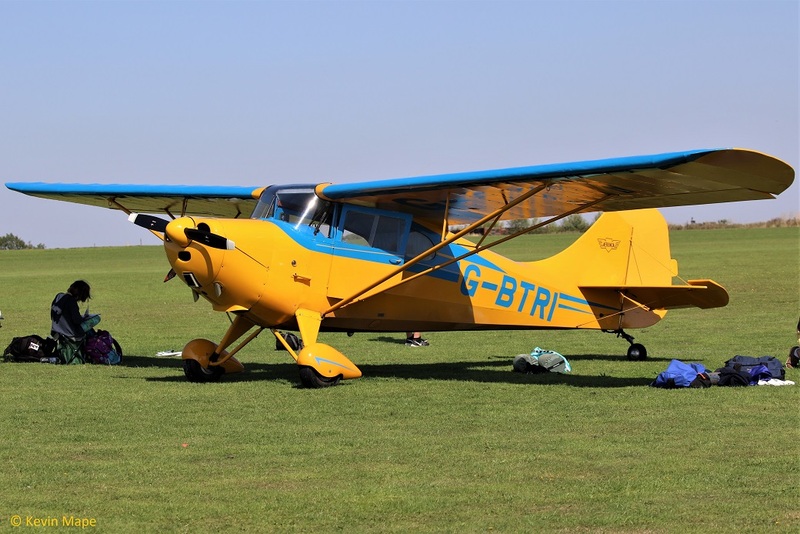 G-CIMV – Groppo Trail . Built 2016. 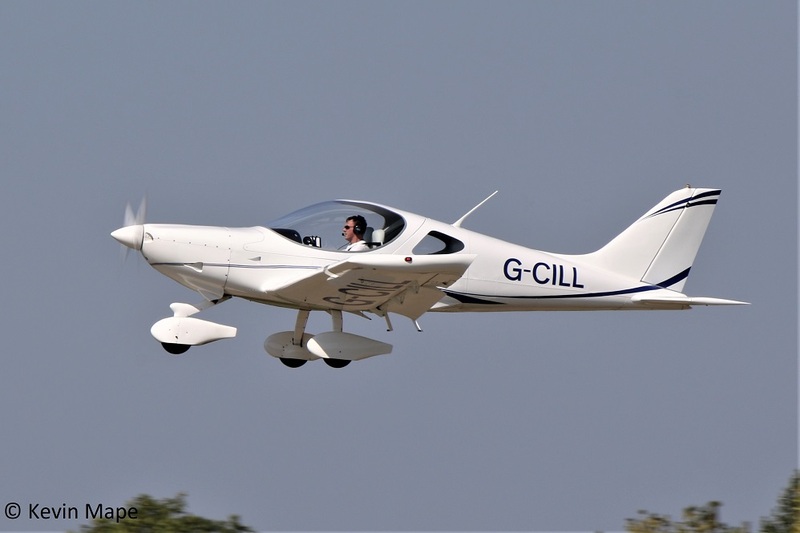 G-CIOR – Nicllier HN 700 Menetrel II. Built 2015. 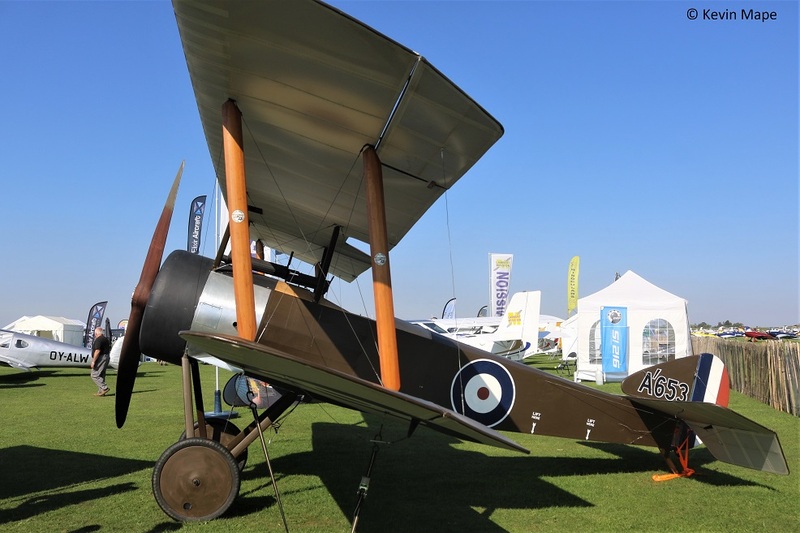 G-CJBU – Bristell NG5 Speed Wing. Built 2016. 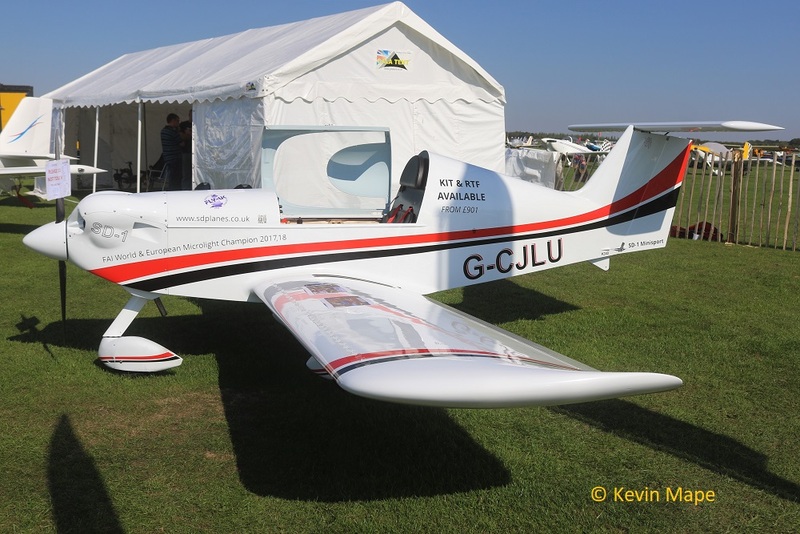 G-CJLD – Mission 108 – Built 2017. 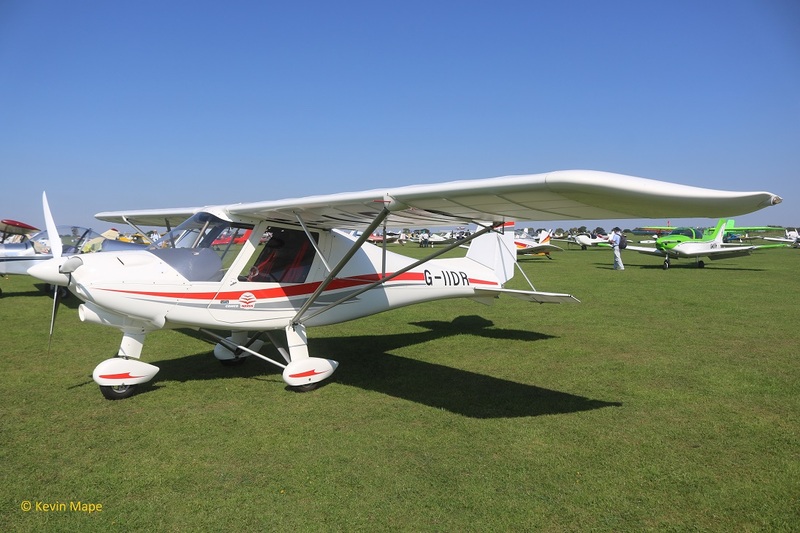 G-CJLU – SD1 Mini Sport. Built 2016. 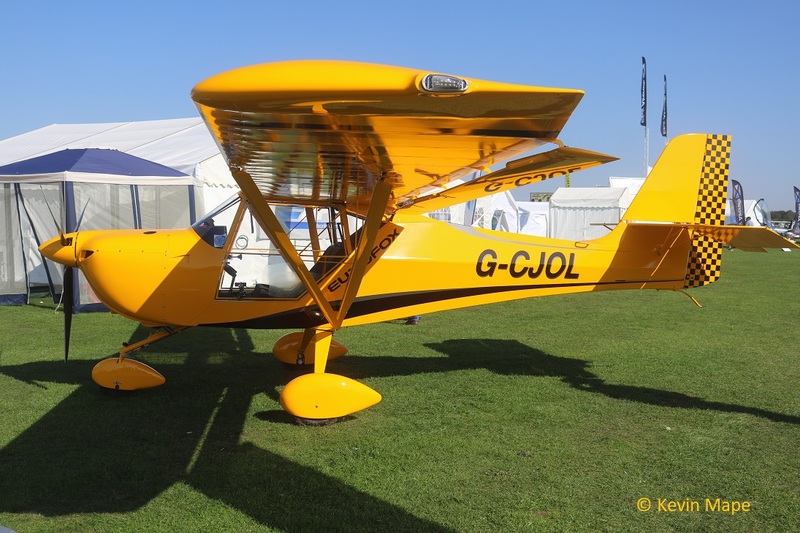 G-CJOL – Eurofox CK – Built 2017. 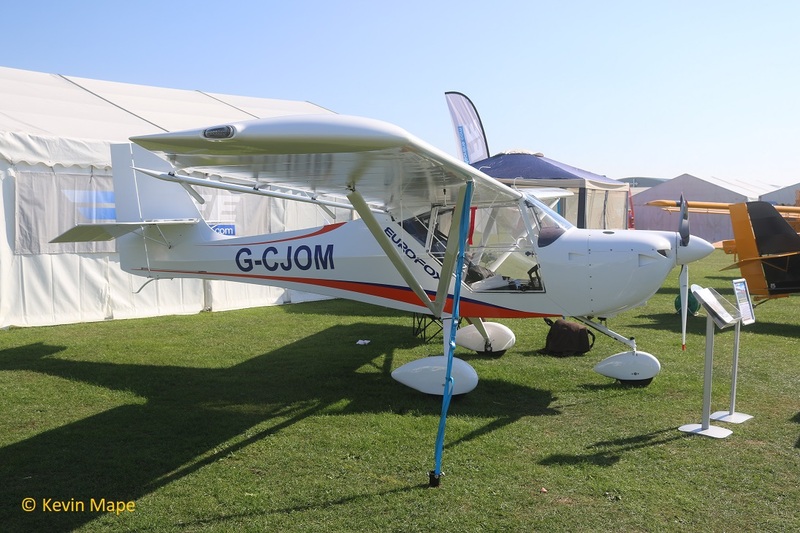 G-CJOM – Eurofox CK – Built 2017. 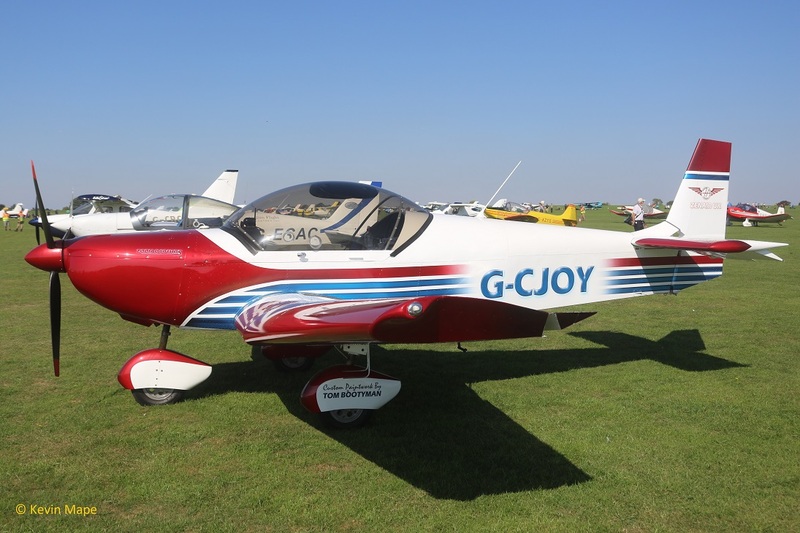 G-CJOY – Zenair CH 601HDS. Built 2016. 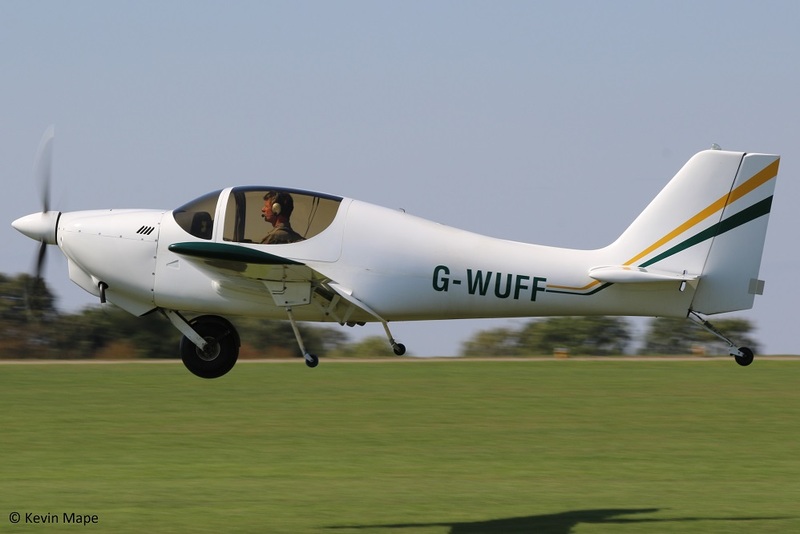 G-CKAA – Whittaker MW 9 Plank. – Built 2017. 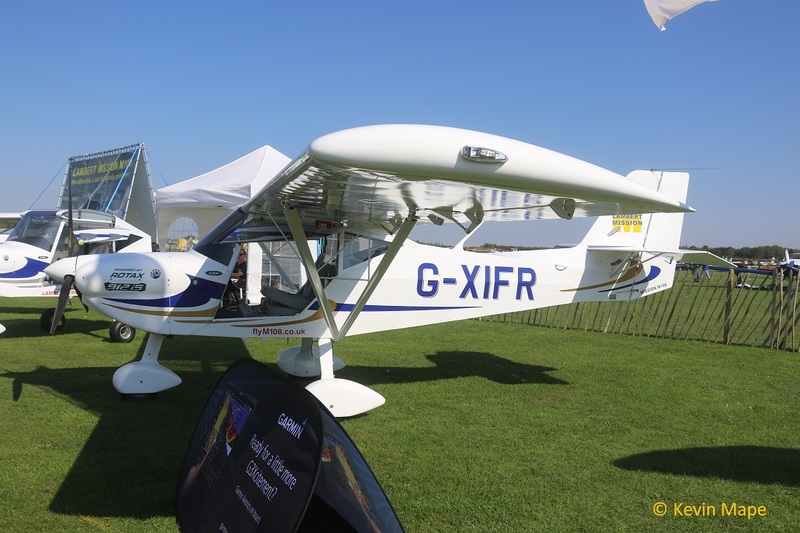 G-CKAB – Eurofox 120 – Built 2017. 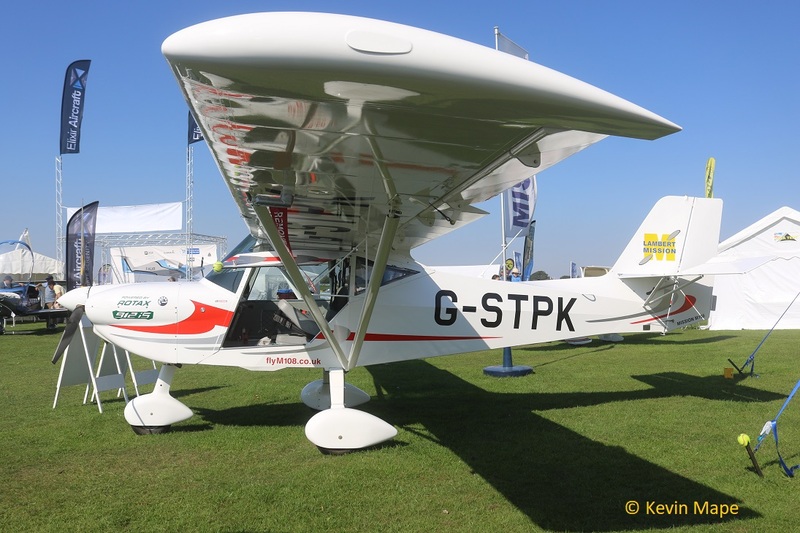 G-CKWX – Ikarus C42 – FB100- Bravo – Built 2018. 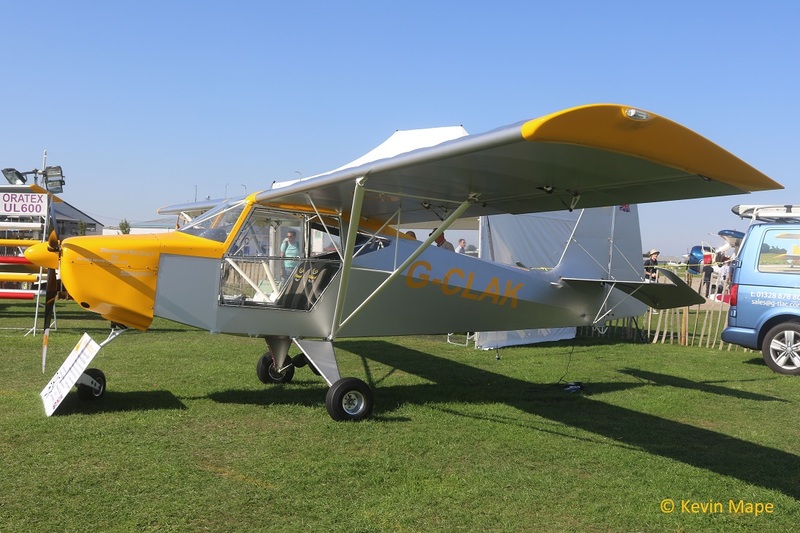 G-CLAK – Sherwood Scout – Built 2017. 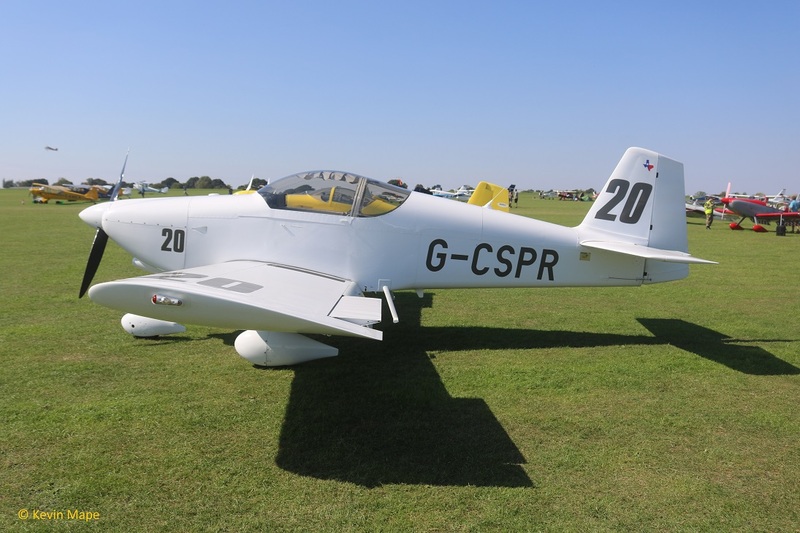 G-CSPR – Vans RV-6A . Built 2000. 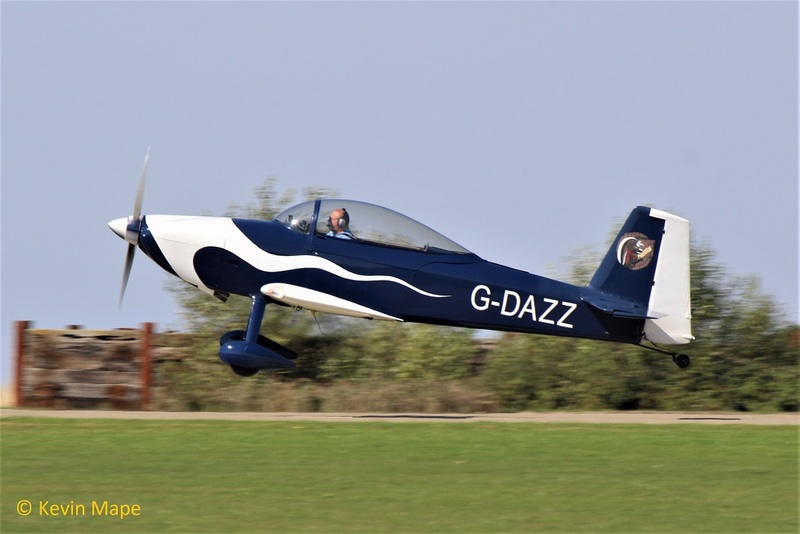 G-DAZZ – Vans RV-8. Built 2006. 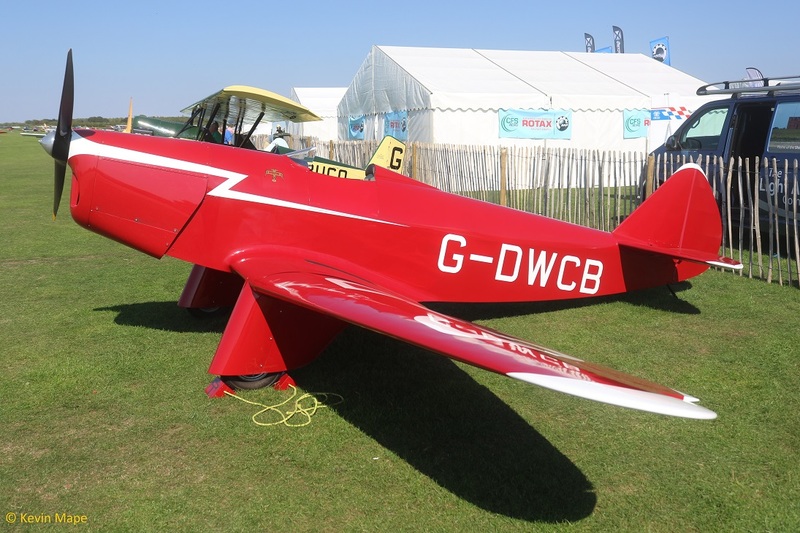 G–DWCB – Chilton DW1A Replica. Built 2016. 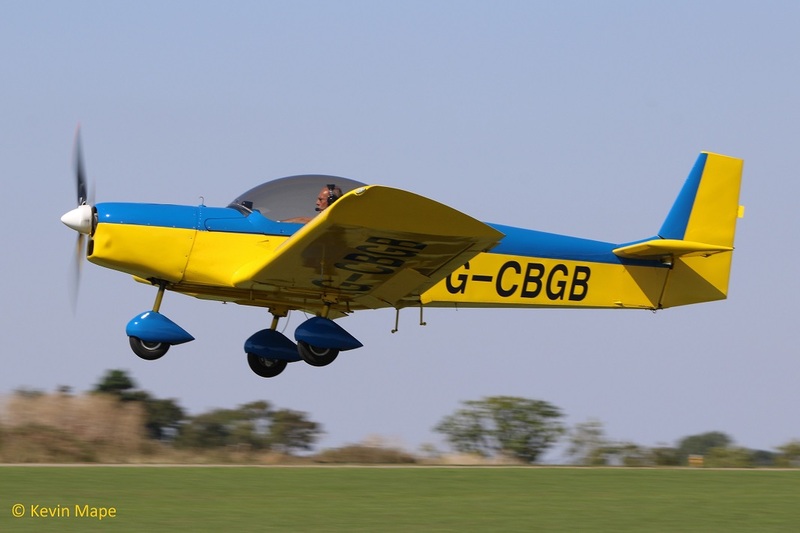 G-DYNM – Dynamic WT-9 UK. Built 2007. 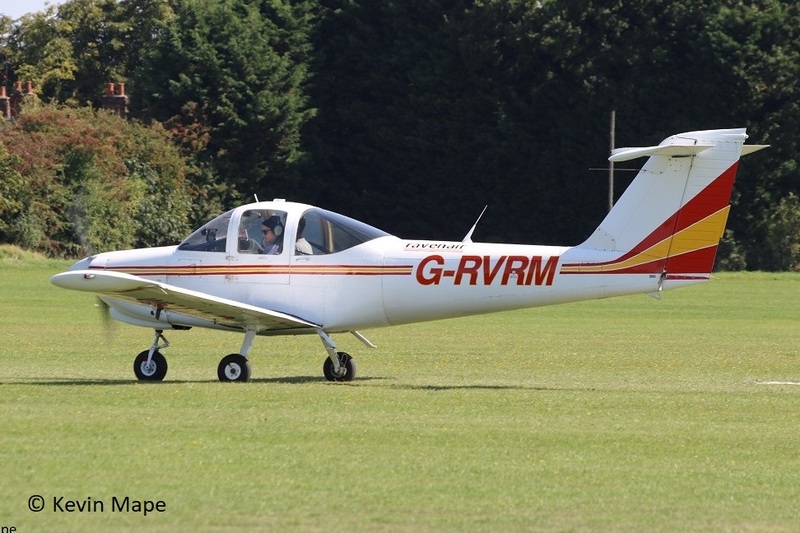 G-ECAC -Alpha Avn R2120U. Built 2007. 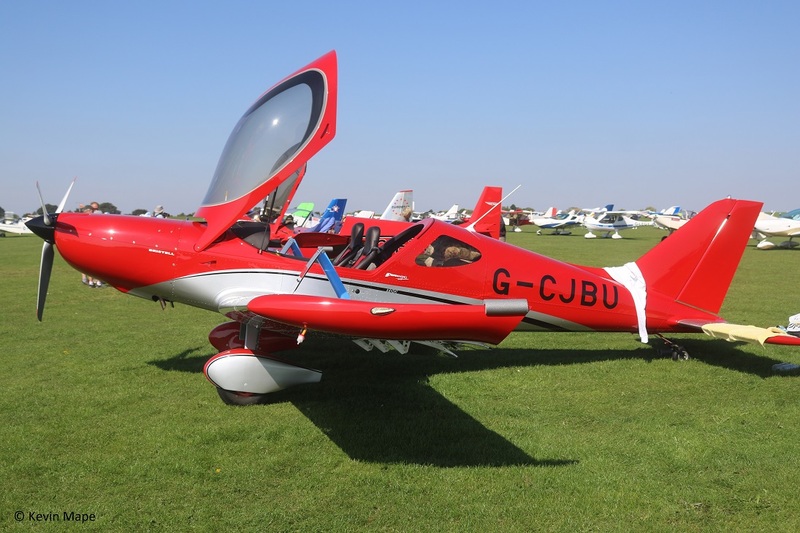 G-ECGO -Bolkow BO- 208C Junior. Built 1966. 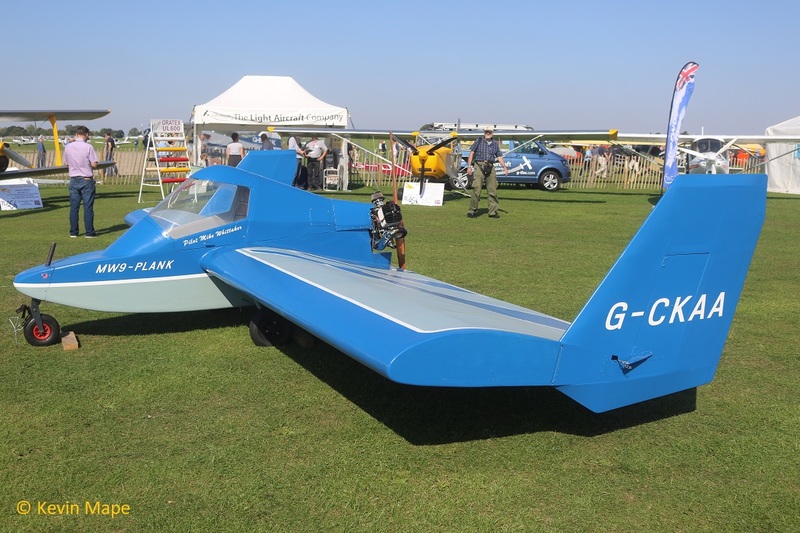 G-ECTF – Comper CLA7 Swift Replica – Built 2015. 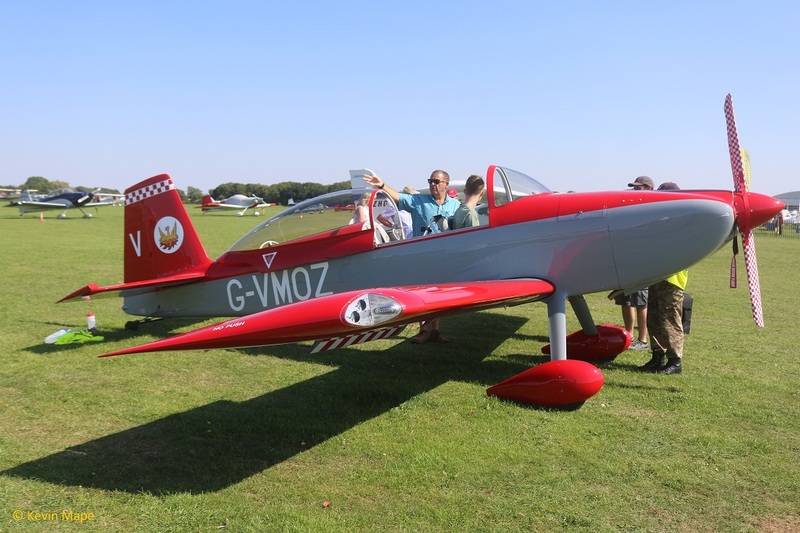 20/G-EFJD -Bolkow BO 209-160FV Maxsum – Built 1971. 259/G–EMIN – Europa . Built 1997. 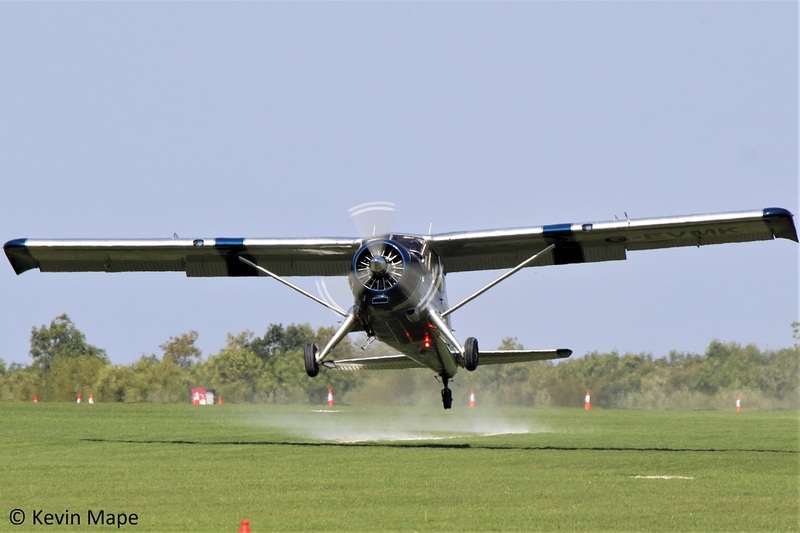 G-EVMK – DHC-2 Beaver I. Built 1953. 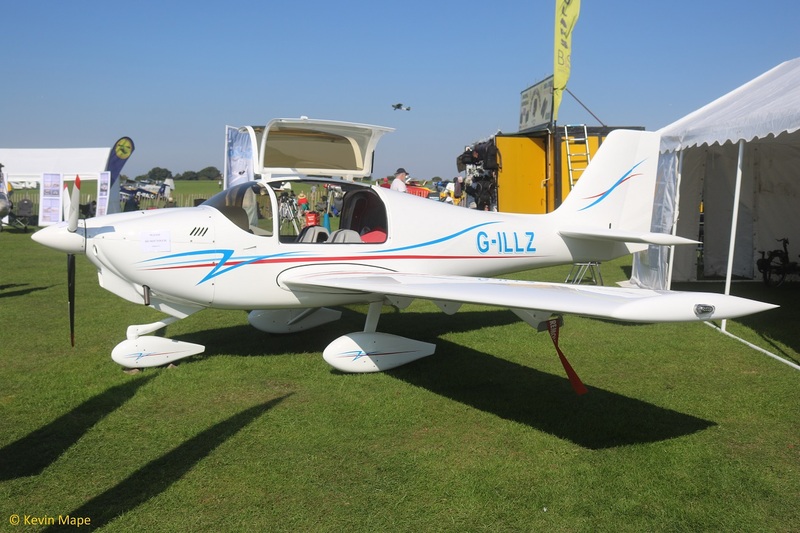 G-EXLL – Zenair CH601XL. Built 2004. 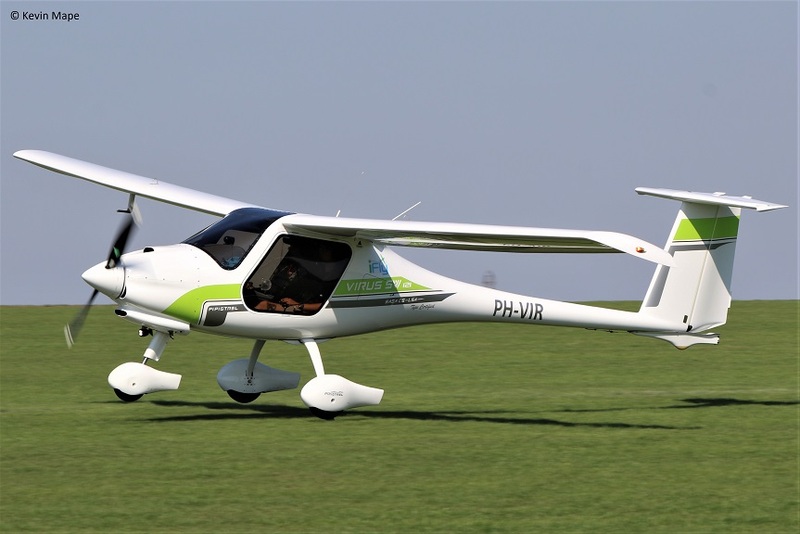 G-EXXL – Zenair CH601XL. Built 2012. 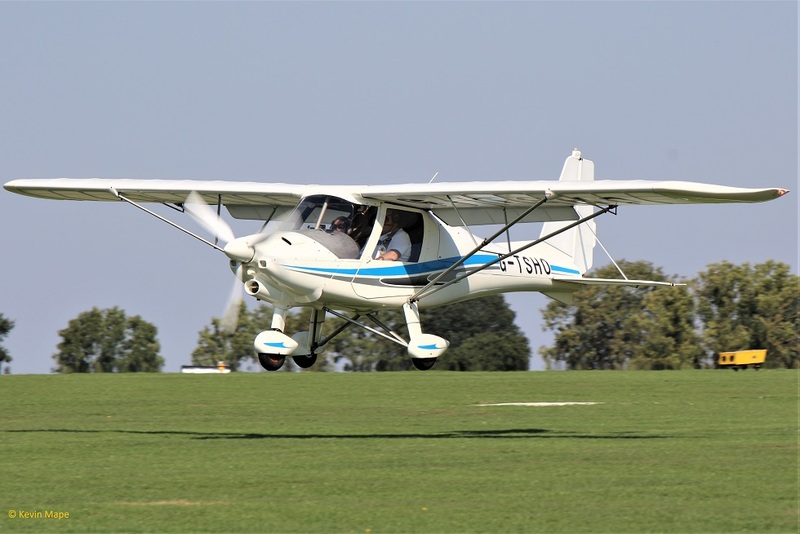 117/G-FLKS – Scheibe SF25C Falke. Built 2000. 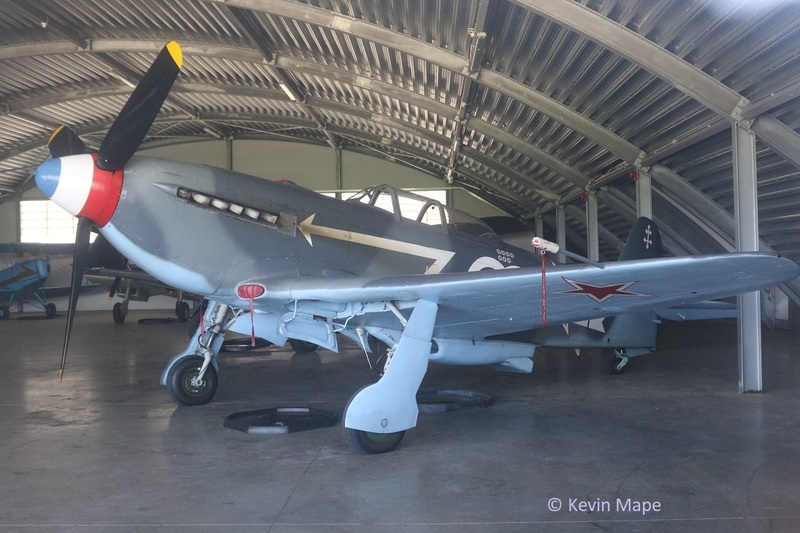 G-FKNH – Pa-15 (Mod )Vagabond. Built 1948. 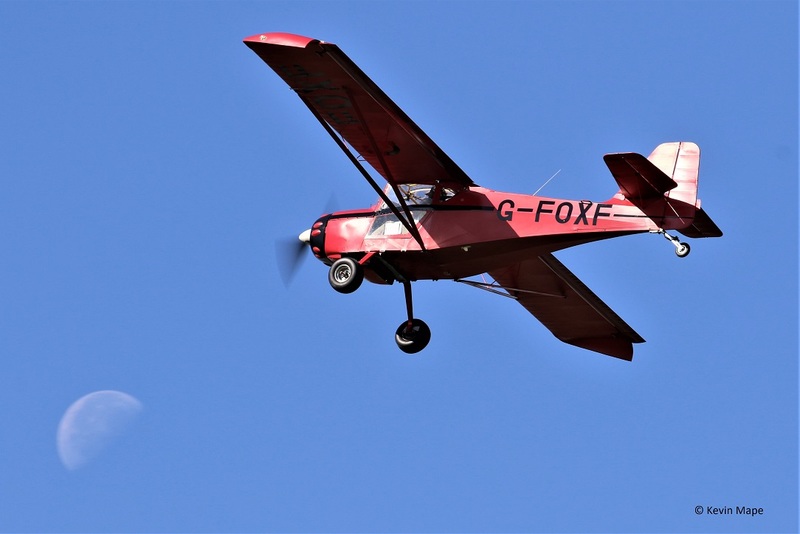 G-FOXF – Denny Kitfox Mk 4. Built 2000. 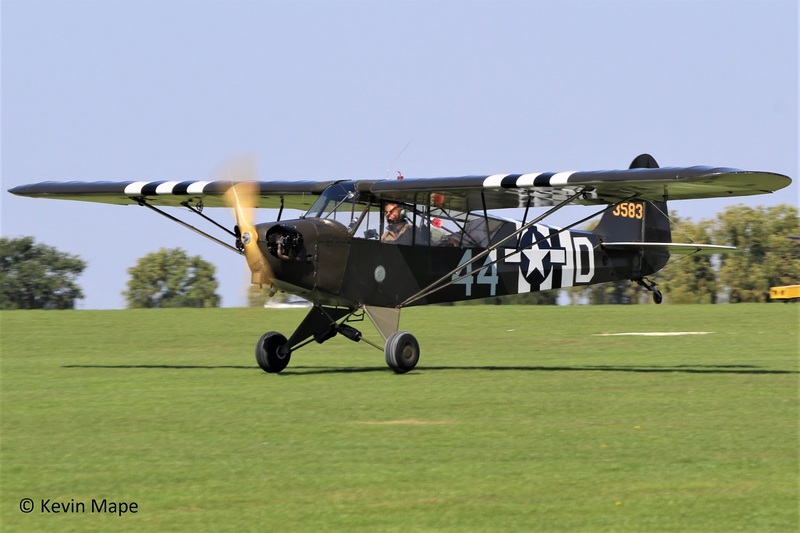 G-FINT – Pa- L-4B Grasshopper -Built 1942 Wears 43-583 USAAC coded 44-D Invasion stripes. 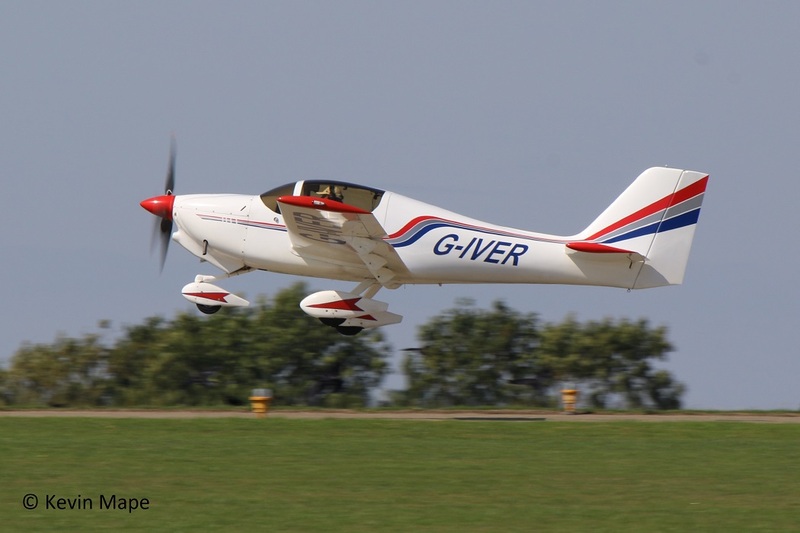 G-GORV – Vans RV-8 . Built 2013. 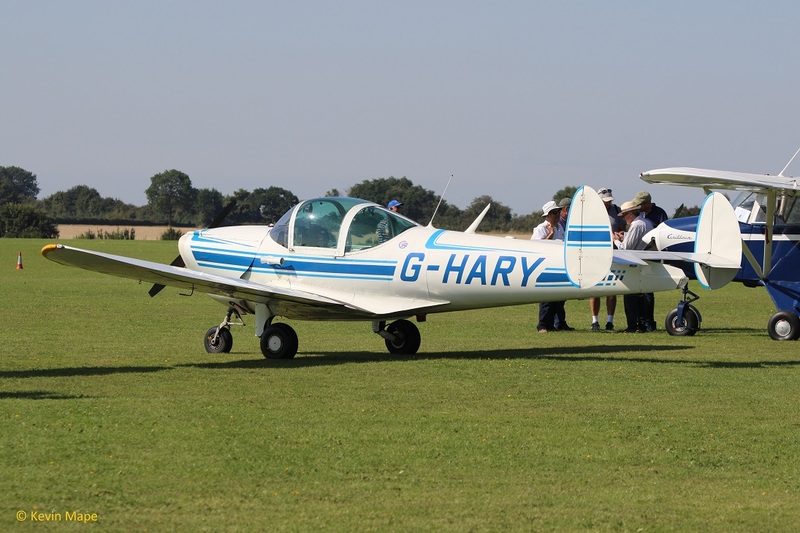 G-HARY – Alon A2. Built 1966. 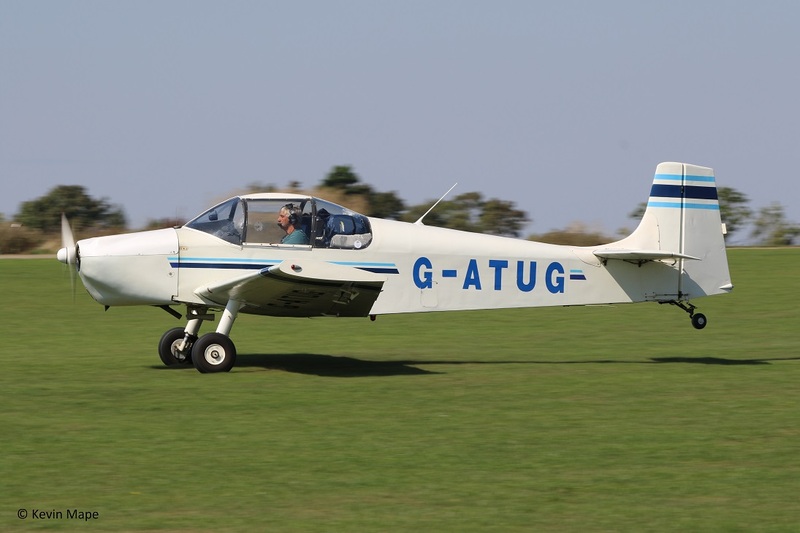 G-HAIG – Rutan Long- Eze. Built 1989. 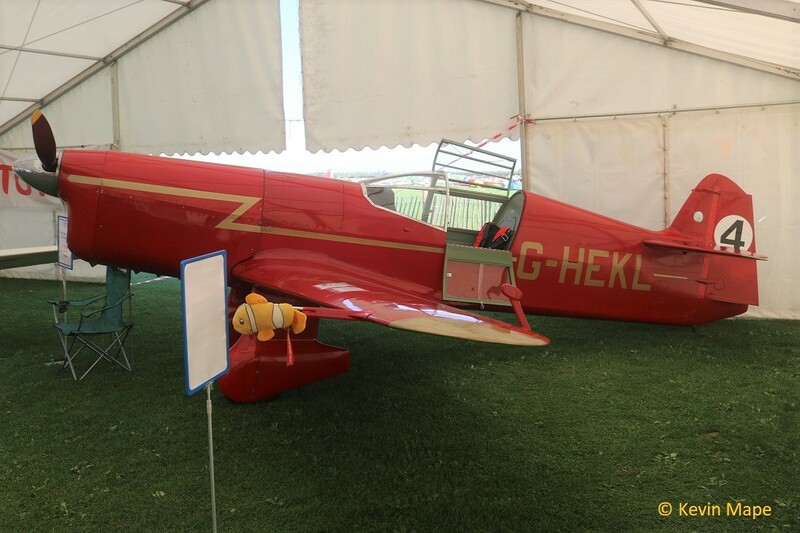 G-HEKL- Percival Mew Gull Replica. – Built 2013. 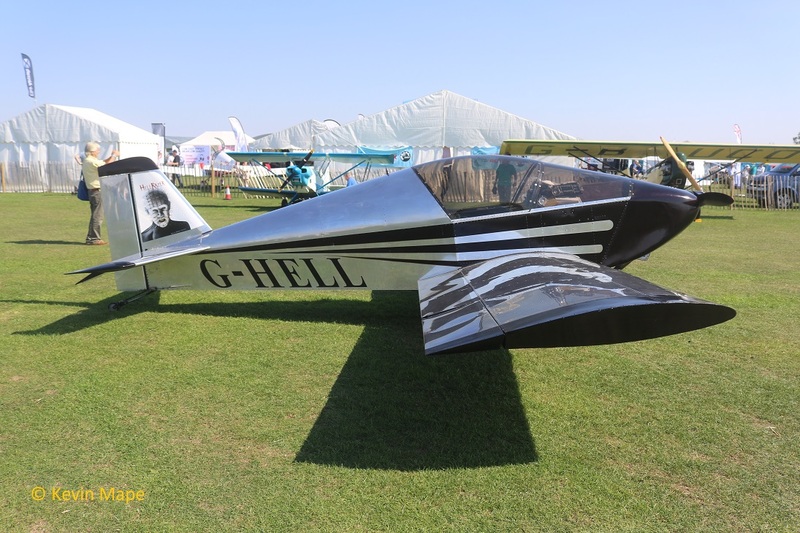 G-HELL – Sonex. Built 2015. 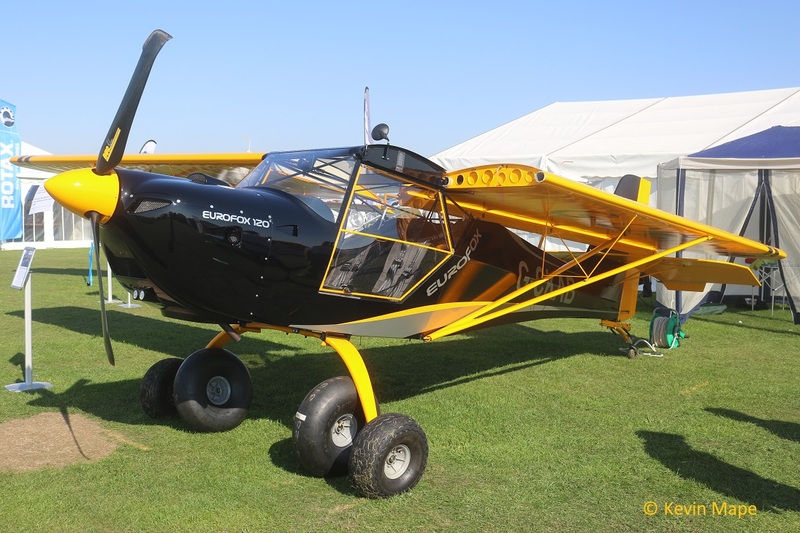 G-IIAC – Aeronca 11AC – Built – 1946. 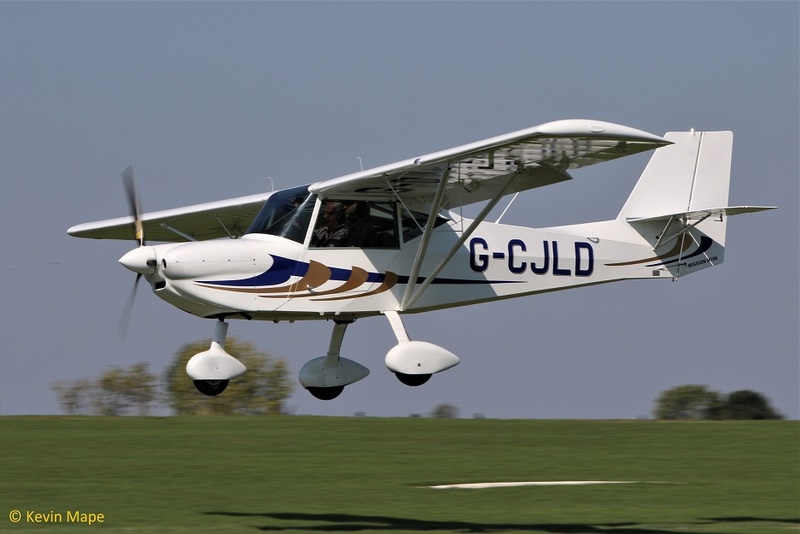 G-IIDR – Ikarus C42 FB100 Bravo. Built 2012. G-ILLZ – Europa XS. Built 2015. 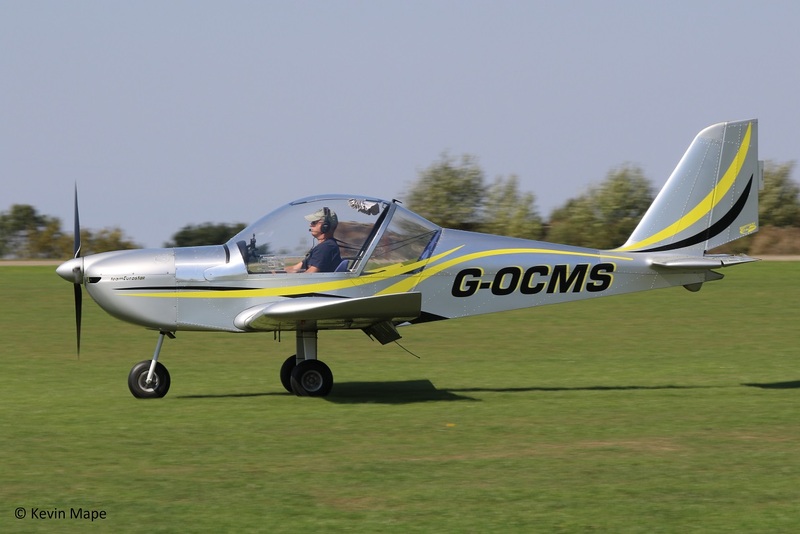 251/G-IMCD – Vans RV-7. Built 2005. 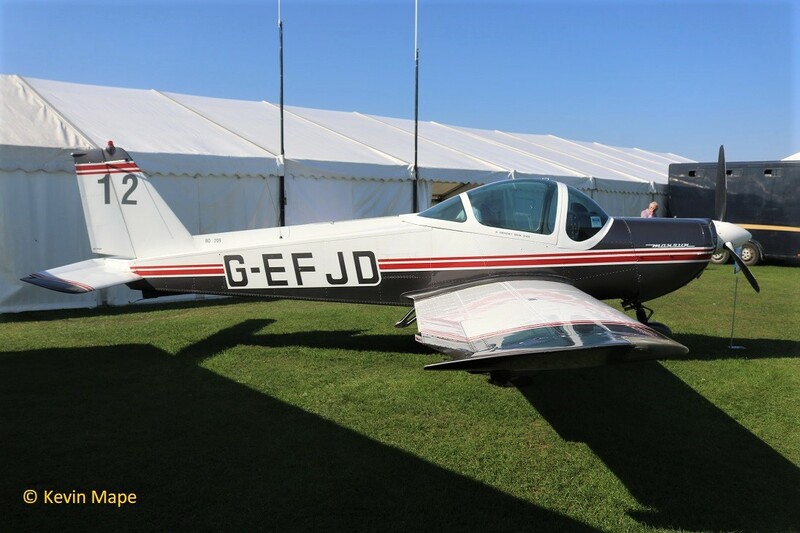 G-INNY – FE5A Replica – Wears F5459 RFC marks coded Y. Built 1983. 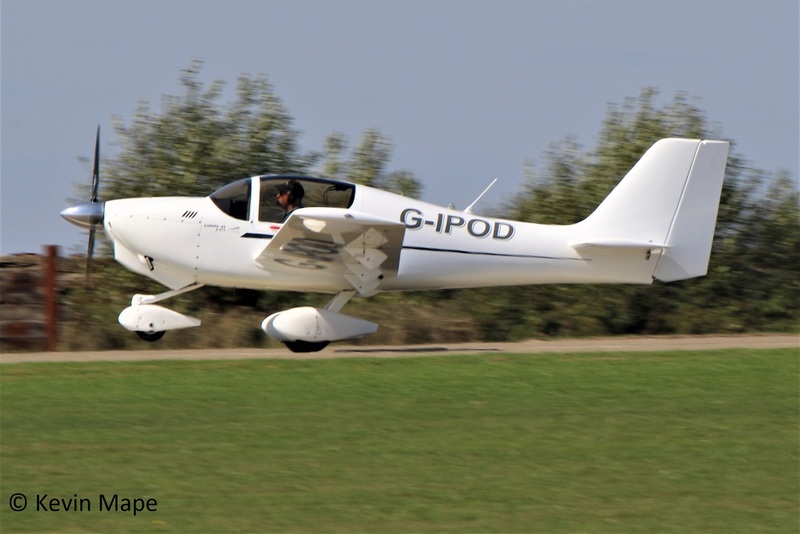 191/G-IPOD – Europa XS Built 2007. 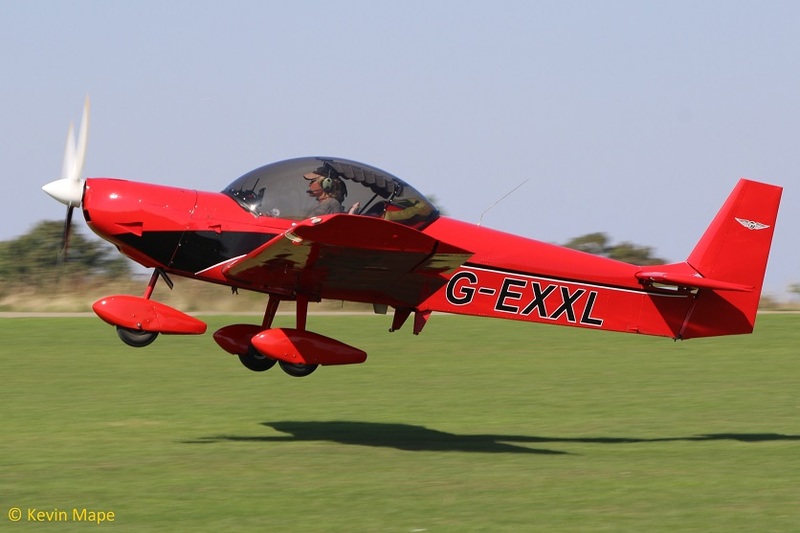 263/G-IRPW – Europa XS Built 2013. 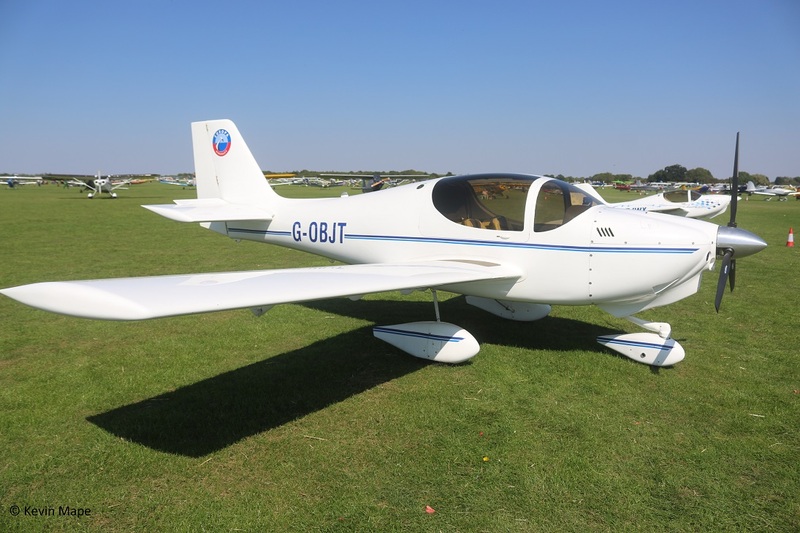 G-JHDD – Sportscruiser Built 2009. 215/G-JUFS – TB 9 Tampico. Built 1989. 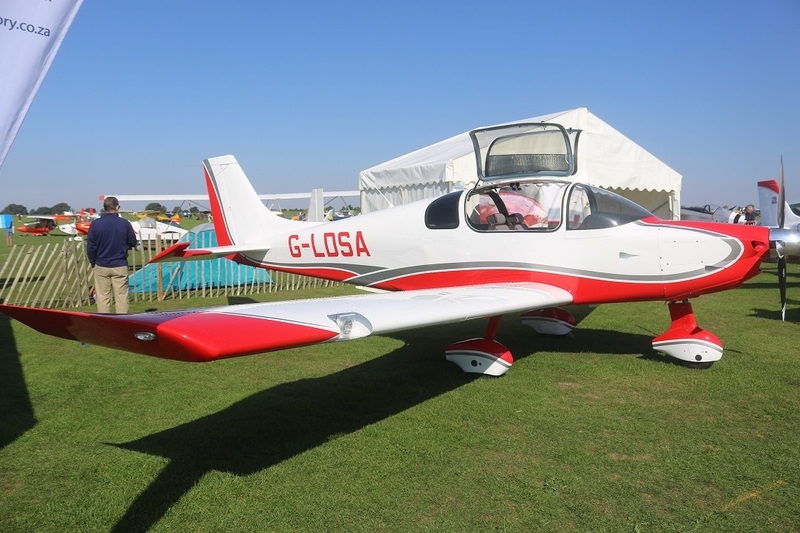 G-LDSA – Sling 4 – Built 2017. 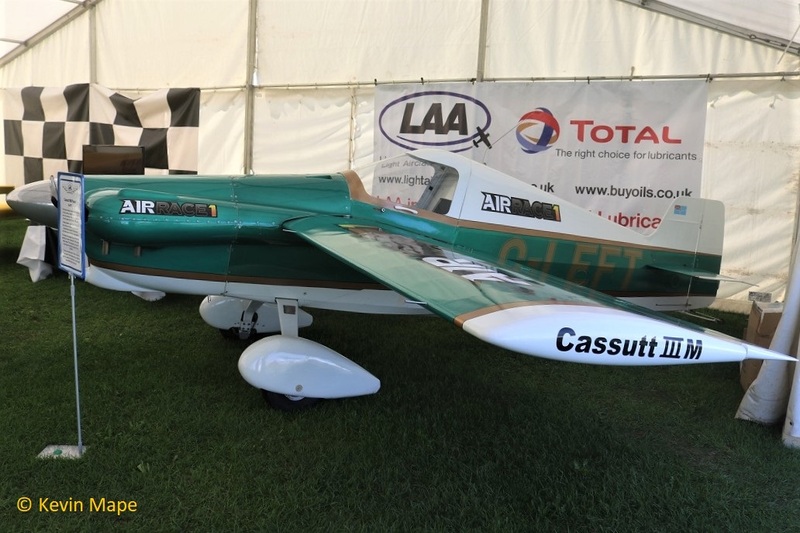 G-LEFT – Cassutt Racer 3M – Built 2010. 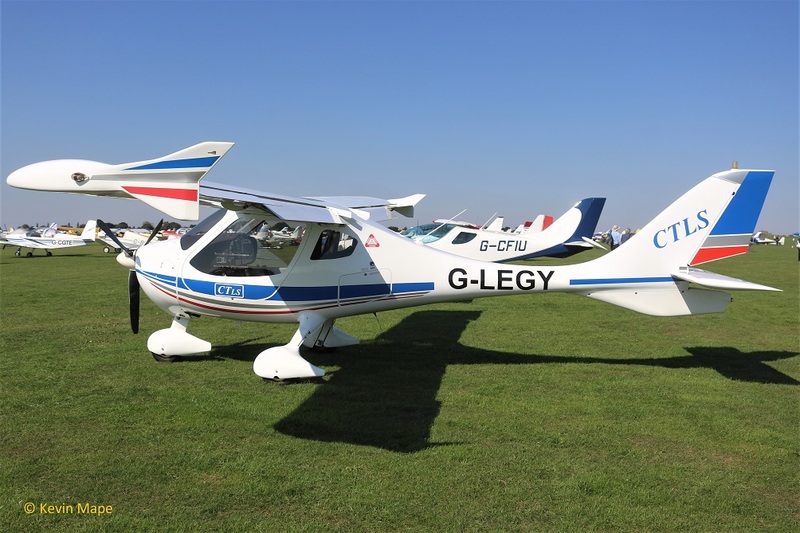 G-LEGY – Flight Design CTLS. Built 2008. 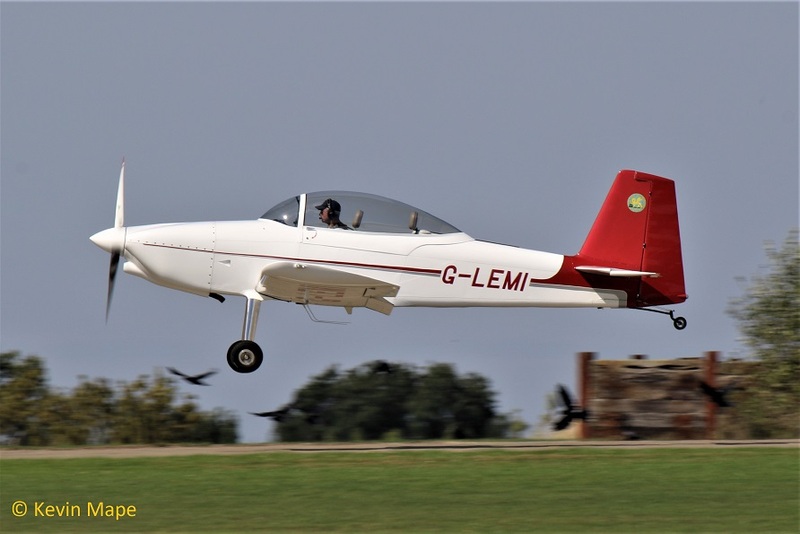 G-LEMI – Vans RV-8. Built 2015. 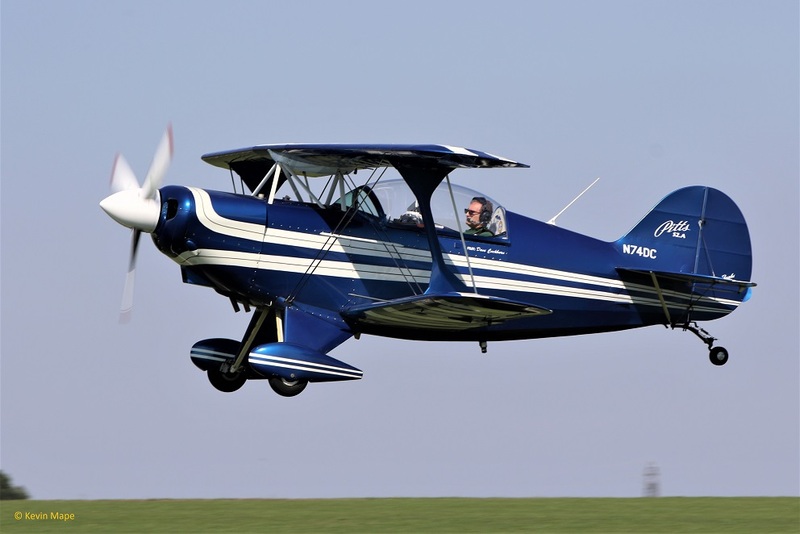 G-LIKY – Aviat A-1C-180 Husky. Built 2015. 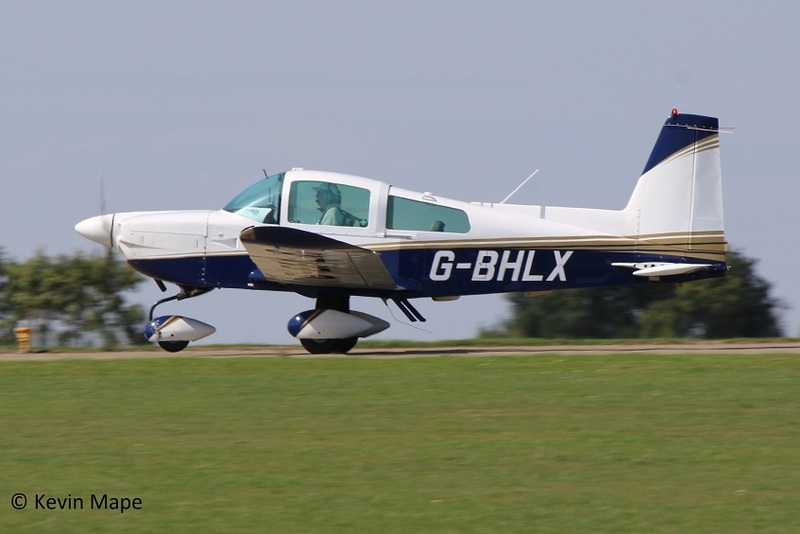 G-LLOY – Pioneer 300 Hawk. Built 2006. 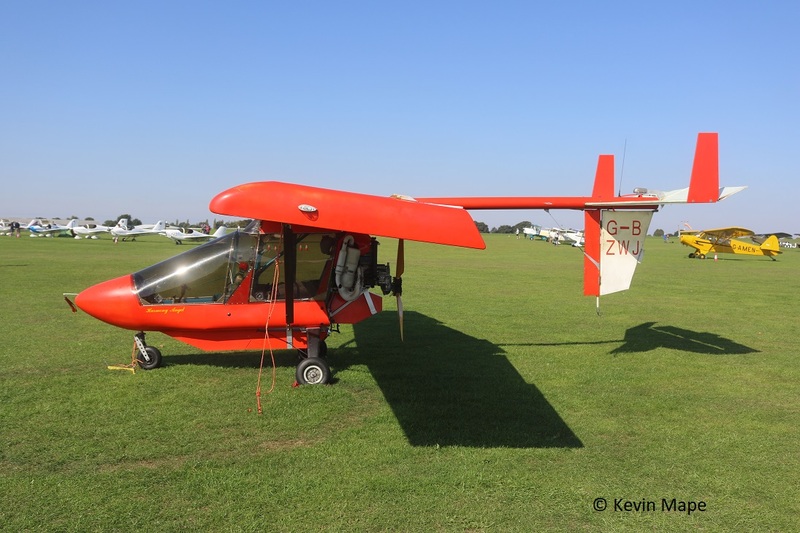 207/G-LUBY – Jabiru J430 . Built 2008. 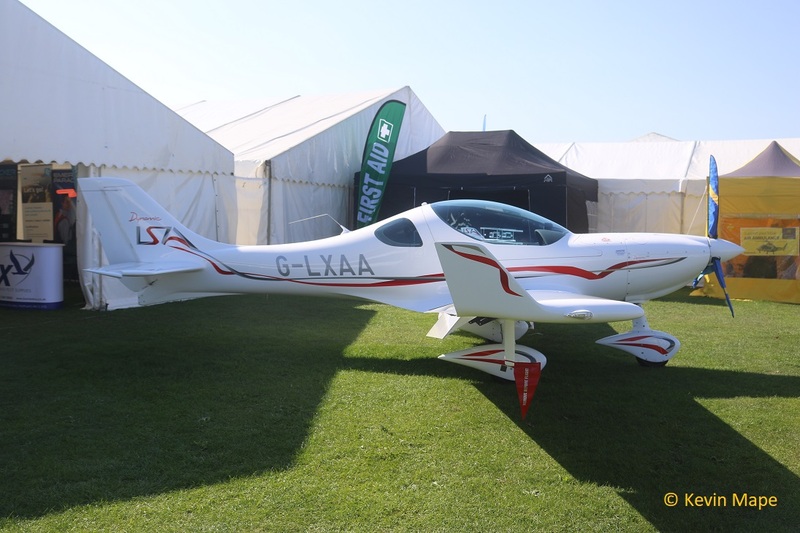 12/G-LXAA – WT9 Dynamic LSA Club – Built 2018. 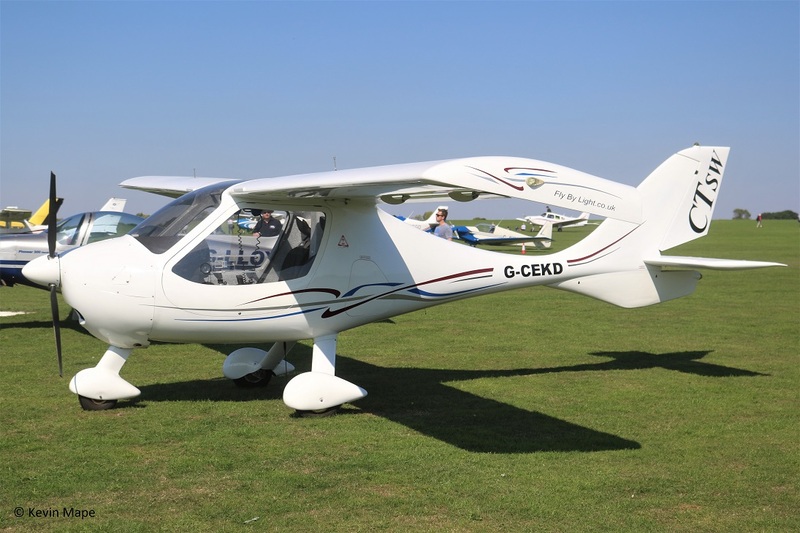 G-MCEL – Pegasus Quantum 15-912. Built 2001. 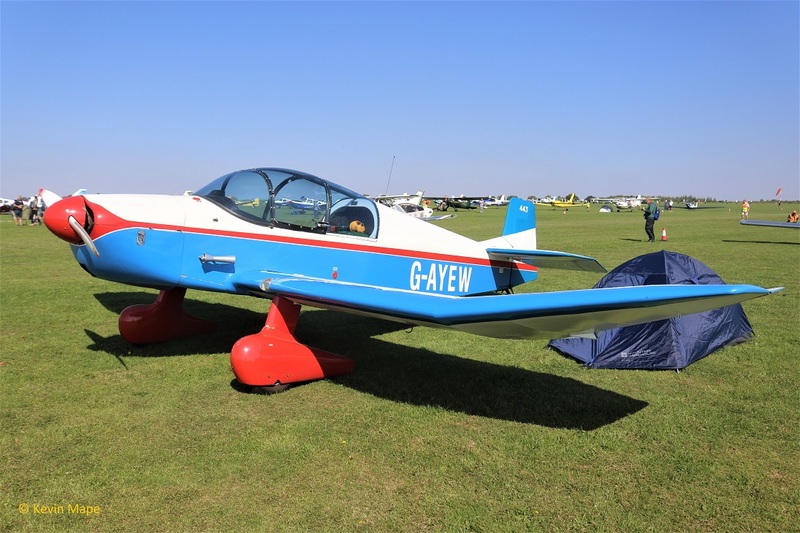 G-MGNI – Magni M16C. Built 2017. 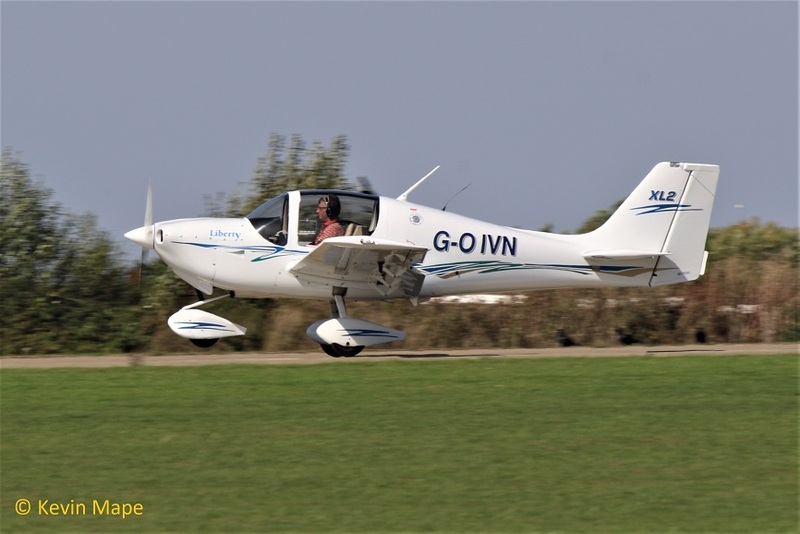 G-MHGS – Glastar. Built 2004. 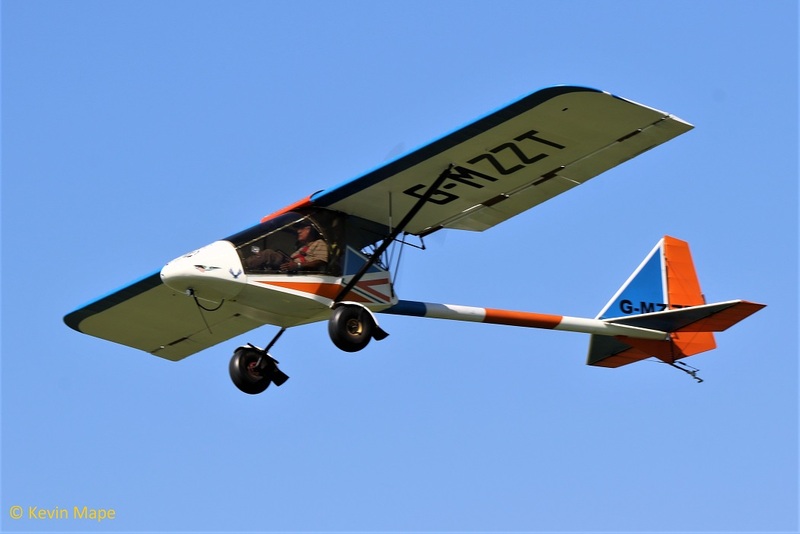 G-MOGS – CZAW Sportscruiser. Built 2011. 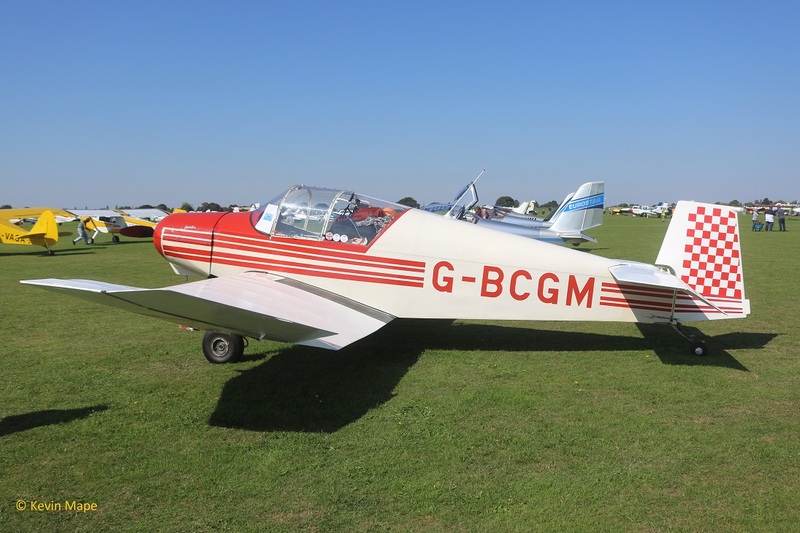 G-MVEN – CFM Shadow CD (Modified SS) Built 1989. 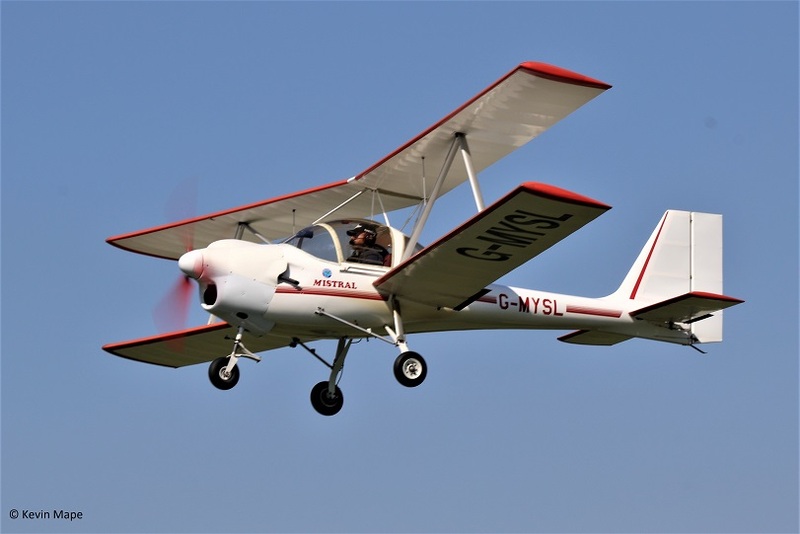 G-MYSL – Aviasud Minstral. Built 1988. 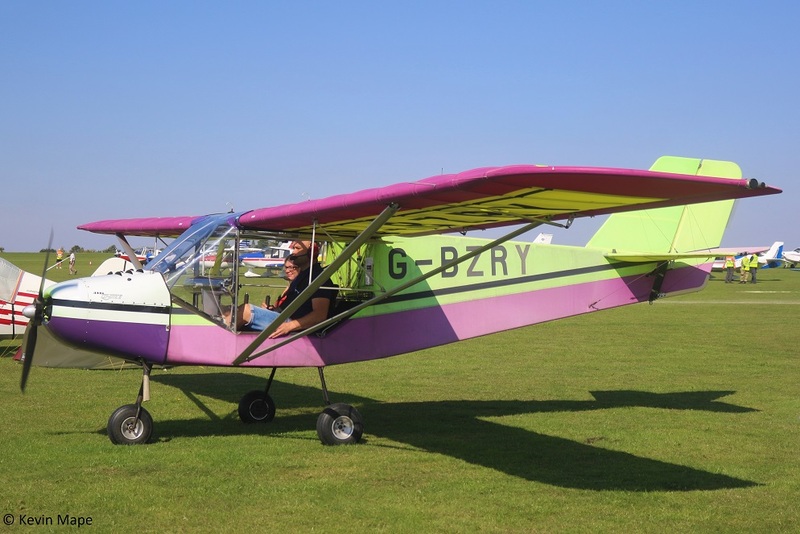 G-MZZT – Kolb Twinstar Mk III (Modified SS) Built 1999. 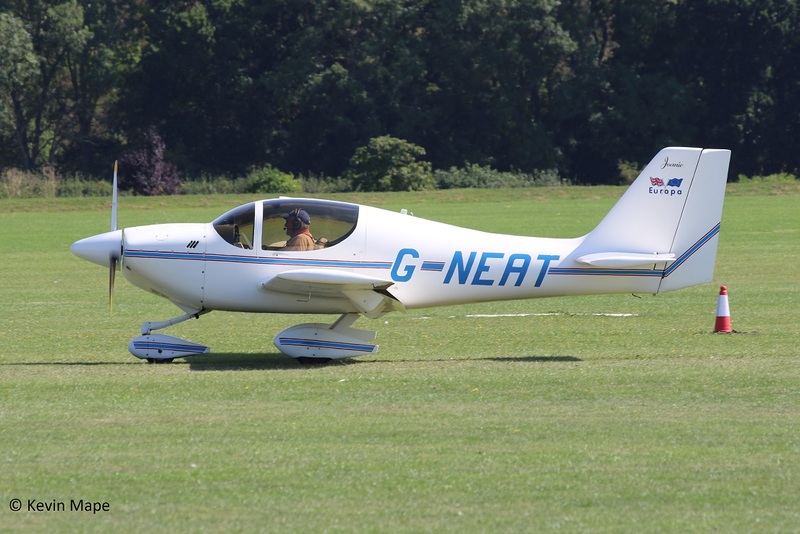 209/G-NEAT – Europa . Built 1996. 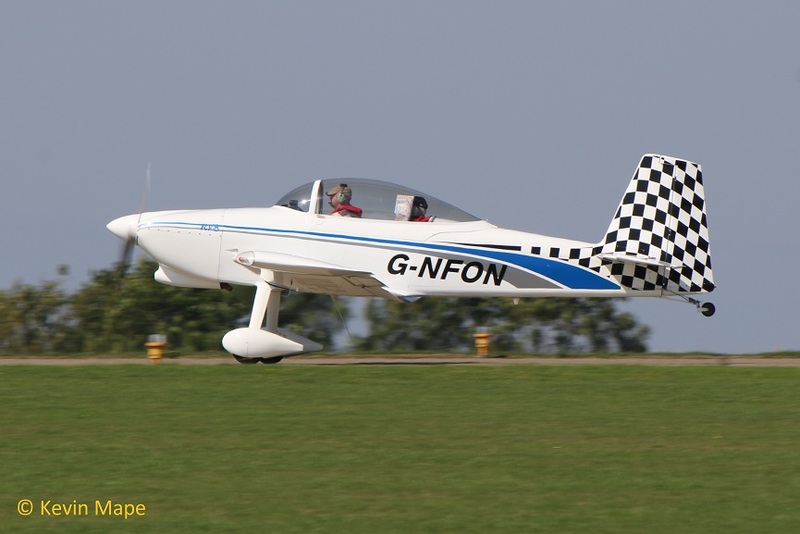 G-NFON – Vans RV-8 . Built 2011. 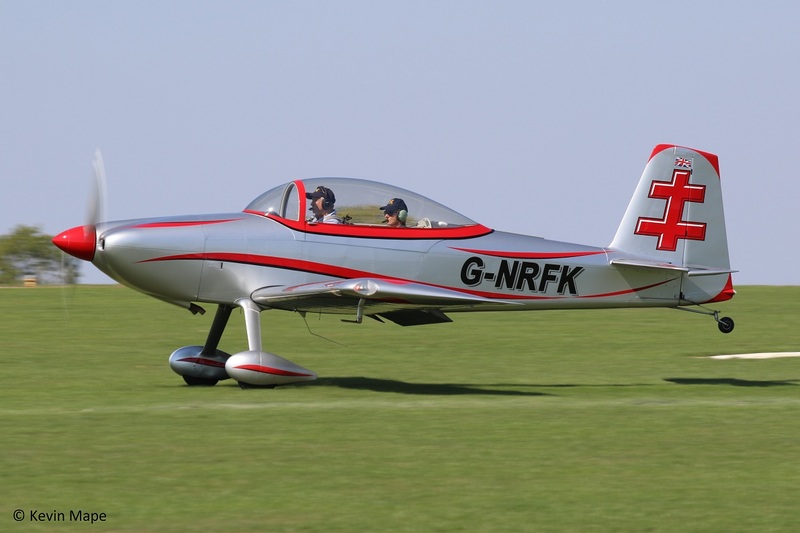 G-NRFK – Vans RV-8. Built 2013. 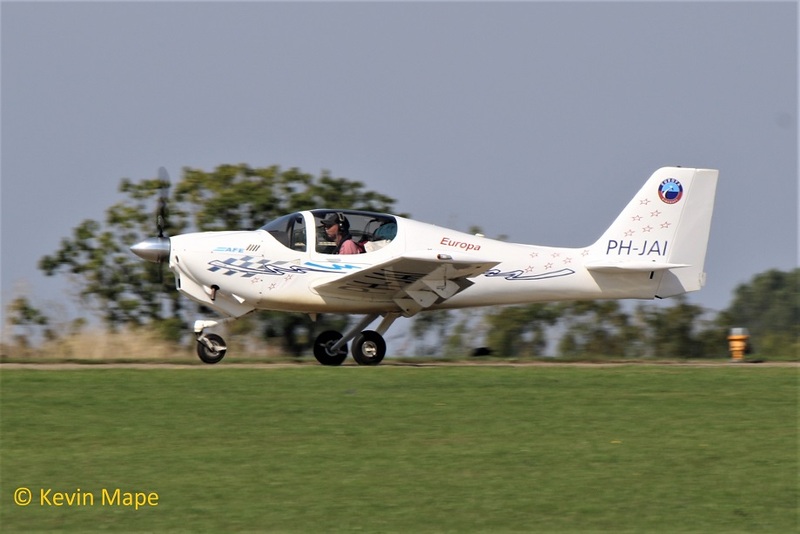 268/G-OBJT – Europa . Built 2015. 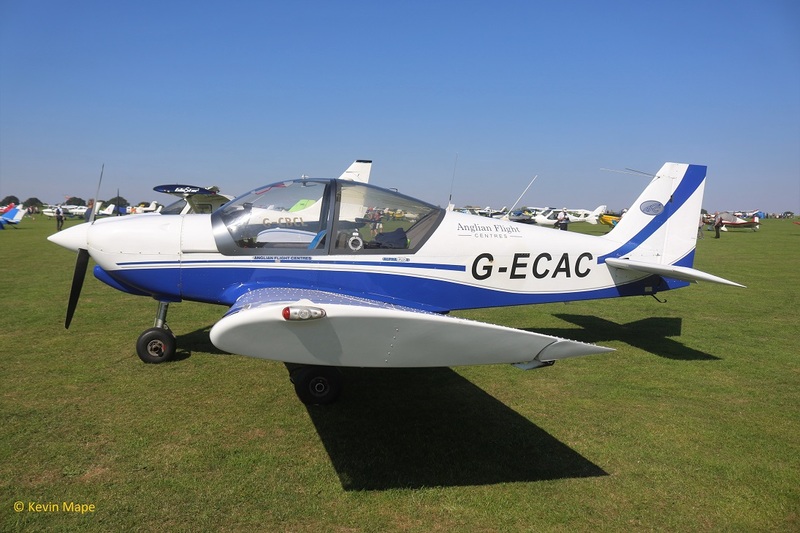 G-OCMS – EV-97 Teameurostar UK. Built 2010. 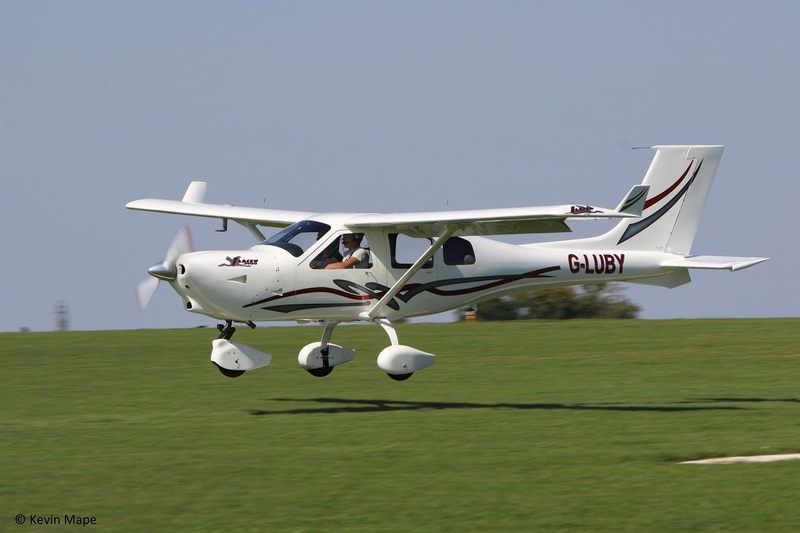 G-OIVN – Liberty XL-2. Built 2005. 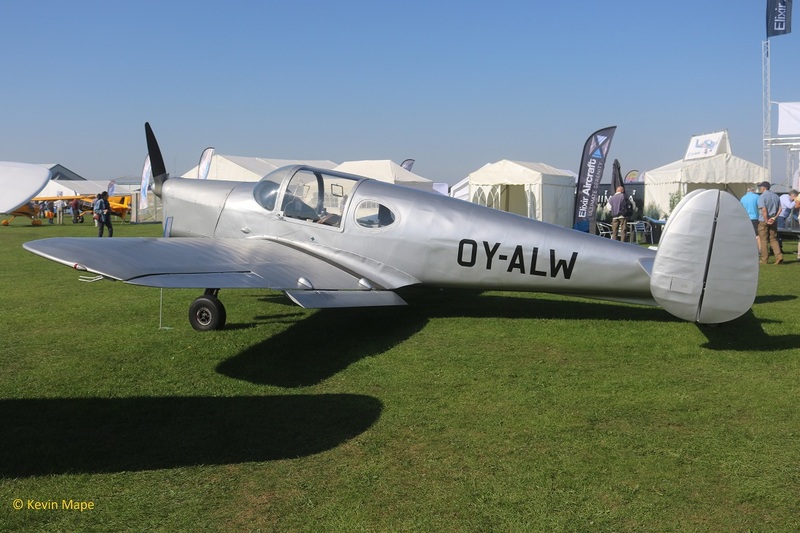 G-OLEG – Yak 3UA – wears Russian Air Force marks – coded 00. Built 1990. 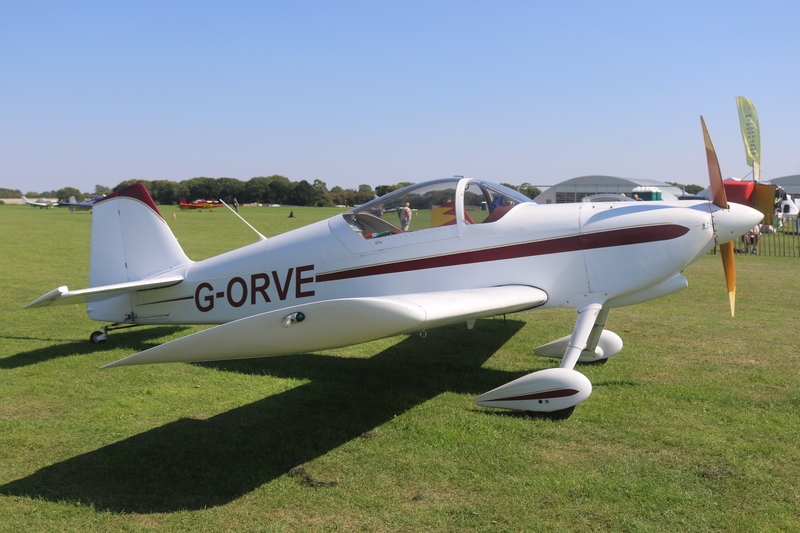 G-ORVE – Vans RV-6. Built 1994. 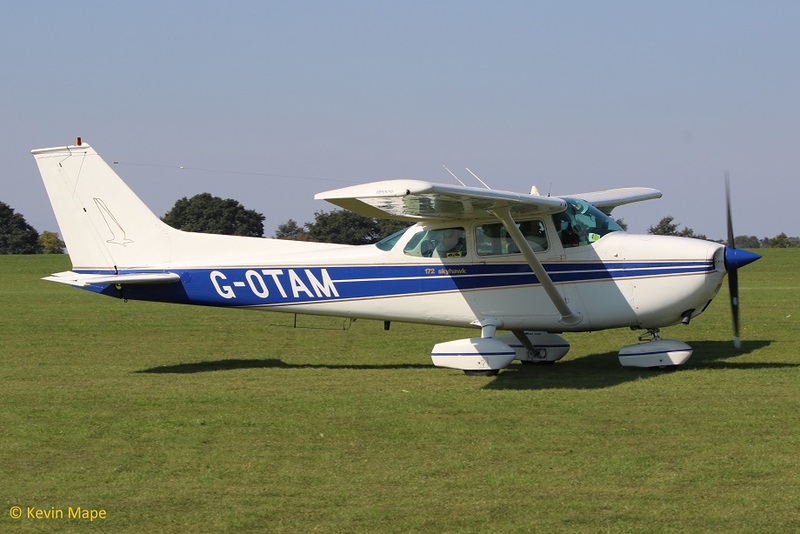 120/G-OTAM – Cessna 172M. Built 1974. 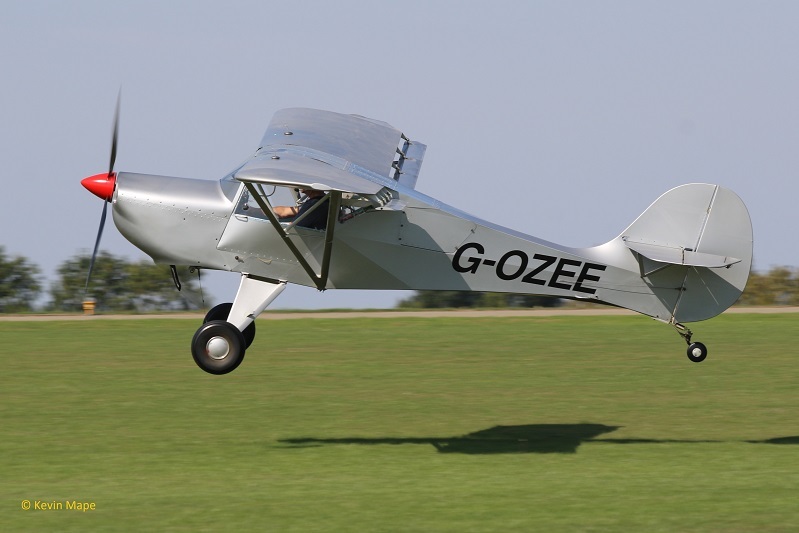 G-OZEE – Avid Speedwing Mark IV. Built 1994. 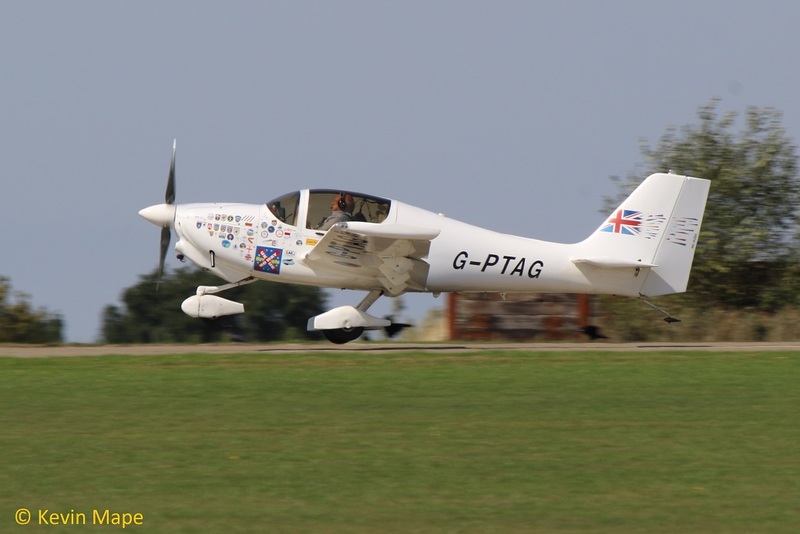 G-PTAG – Europa . Built 2000. 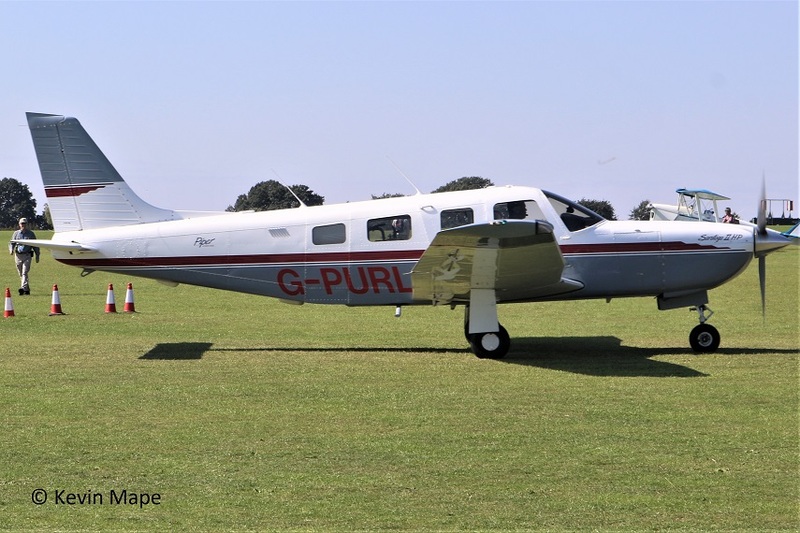 G-PURL – Pa-32R-301 Saratoga II HP. Built 1994. 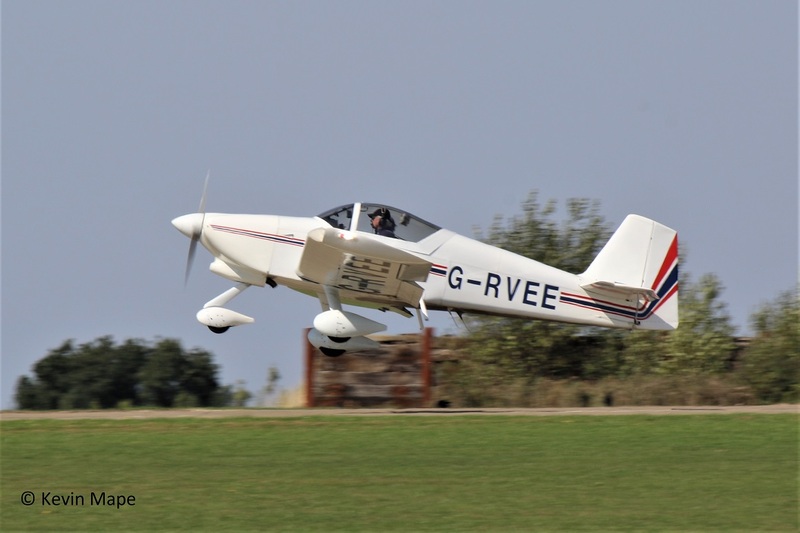 G-RATD – Vans RV-8. Built 2009. 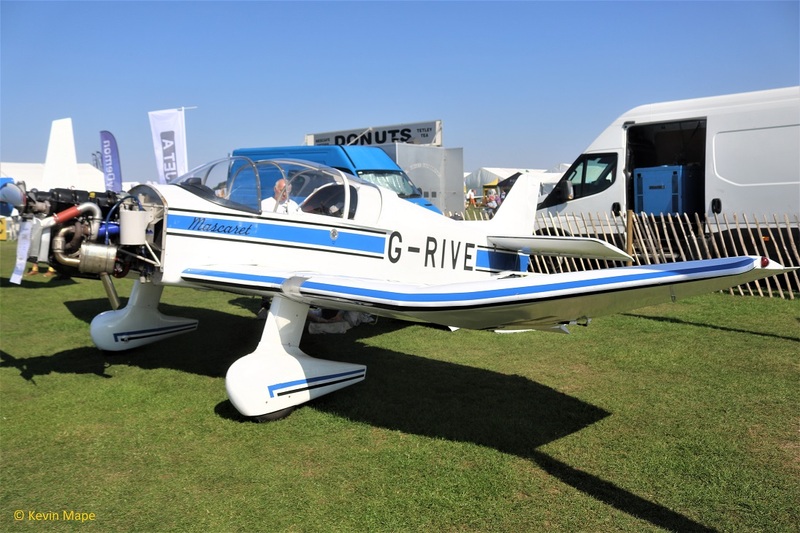 G-RIVE – Jodel D.153. Built 2007. 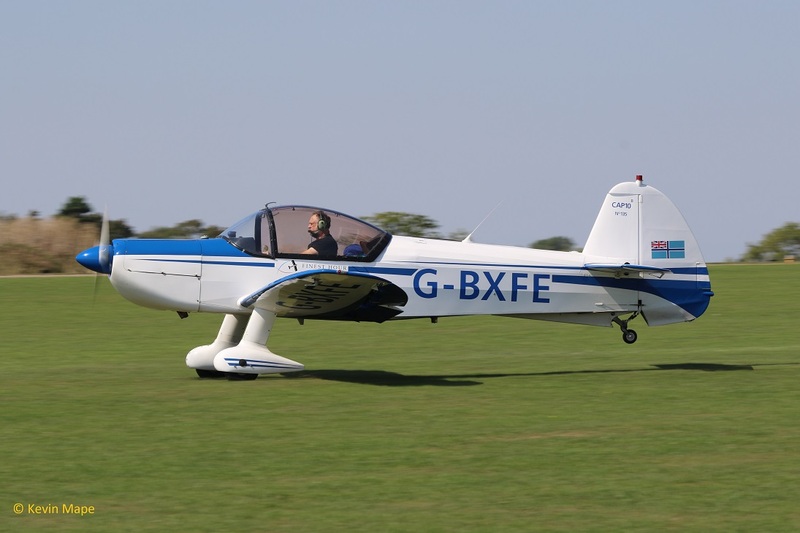 G-RJWX – Europa XS. Built 2001. 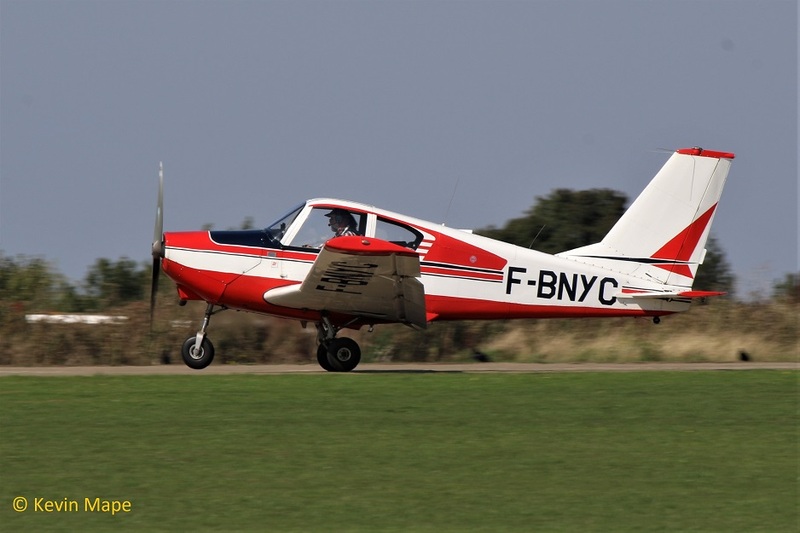 G-RUIA – Reims Cessna F172N. Built 1979. 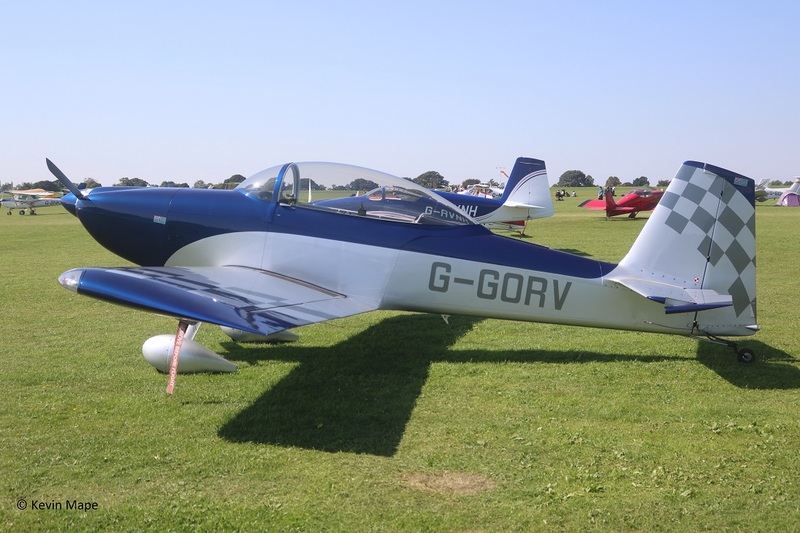 G-RVAN – RV- 6 . Built 1998. 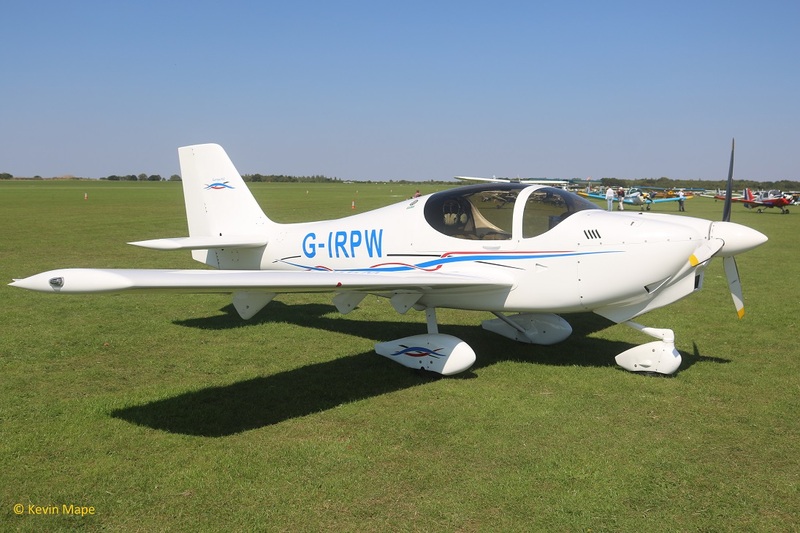 G-RVBI – Vans RV- 8. Built 2010. 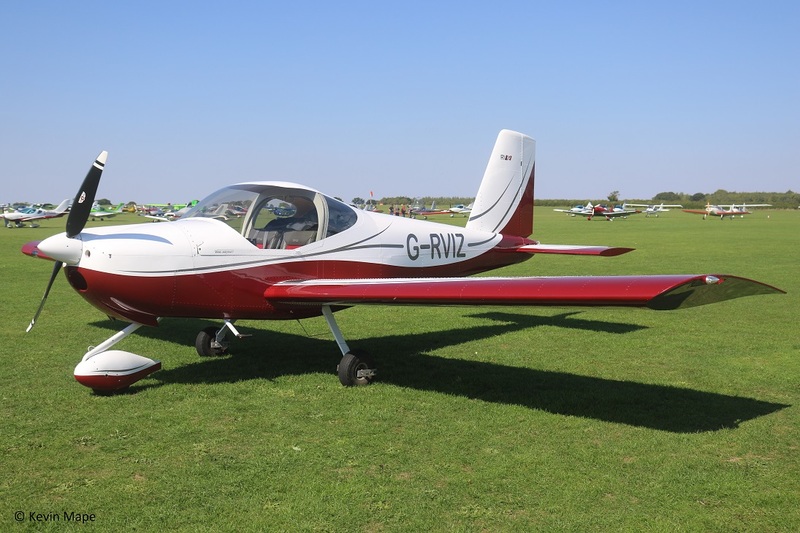 228/G-RVDB – Vans RV- 7. Built 2018. 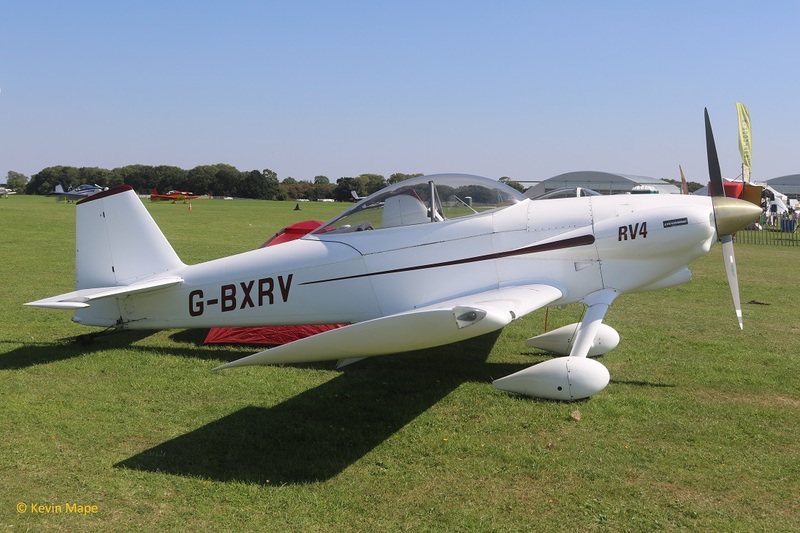 158/G-RVEE – Vans RV-6A. Built 1992. 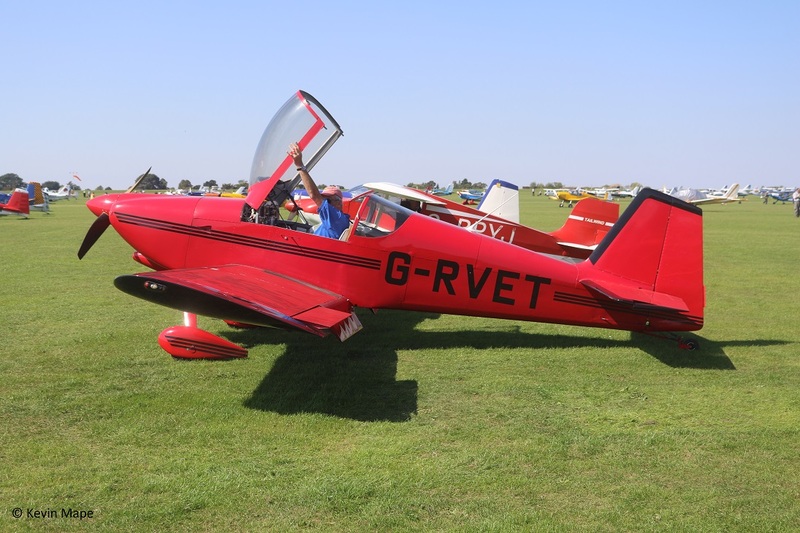 233/G-RVET- Vans RV-6. Built 1999. 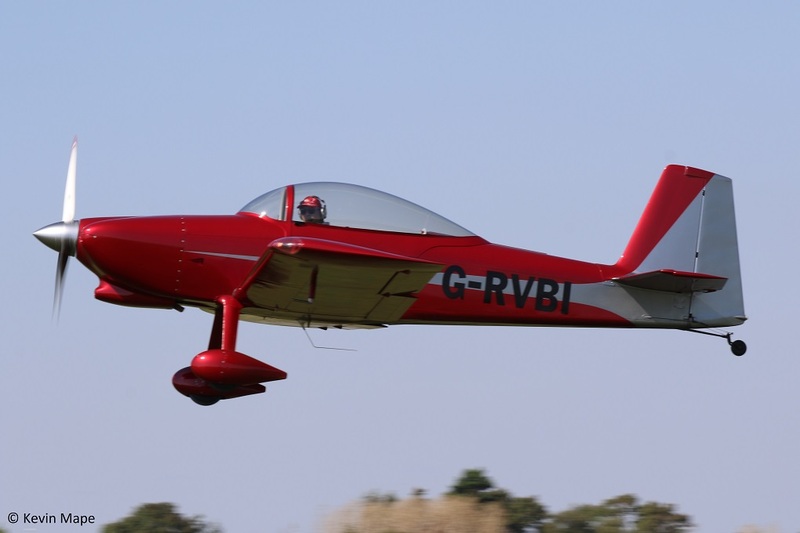 G-RVIB – Vans RV- 6 . Built 2002. 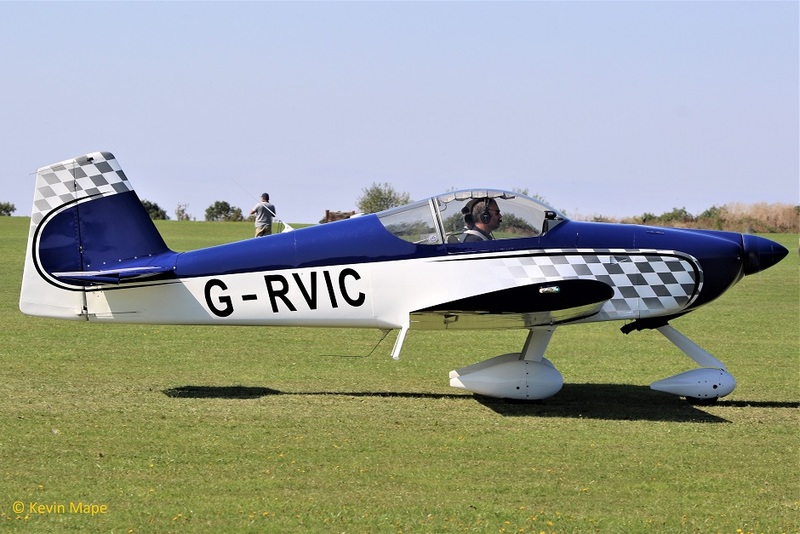 223/G-RVIC – Vans RV- 6A. Built 2004. 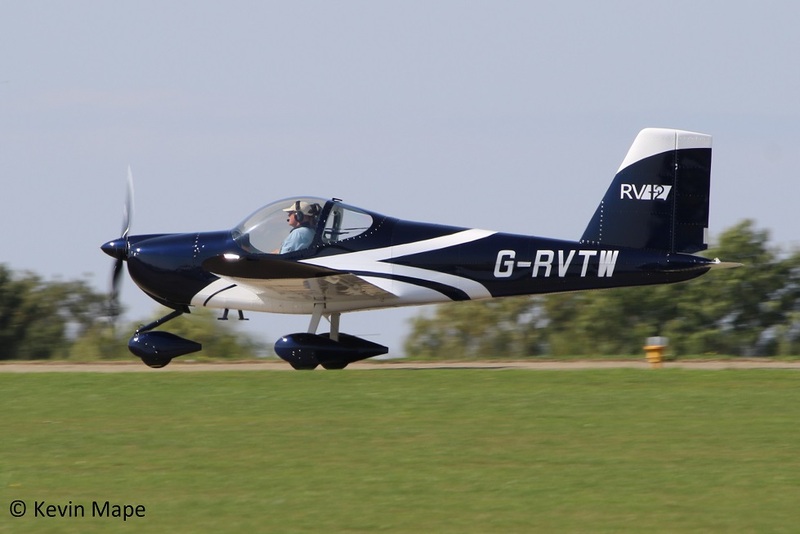 235/G-RVIW – Vans RV-9. Built 2010. 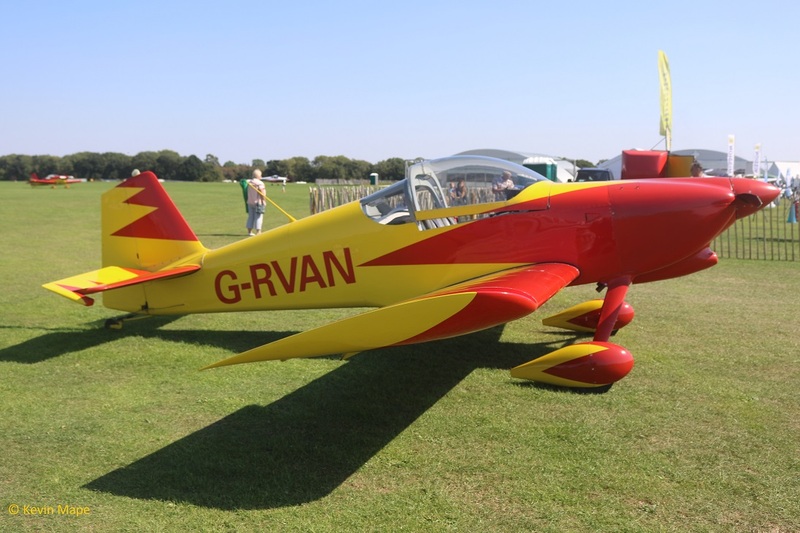 G-RVIZ – Vans RV-12. Built 2013. 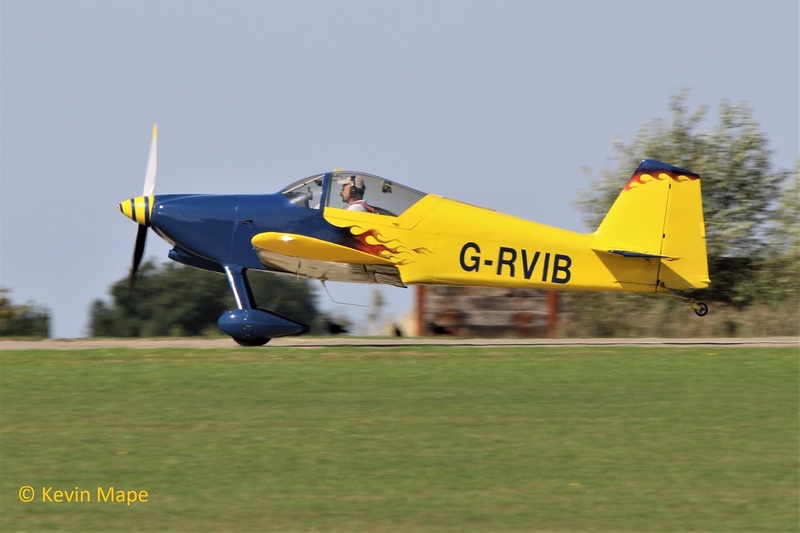 G-RVMT – Vans RV-6. Built 2002. 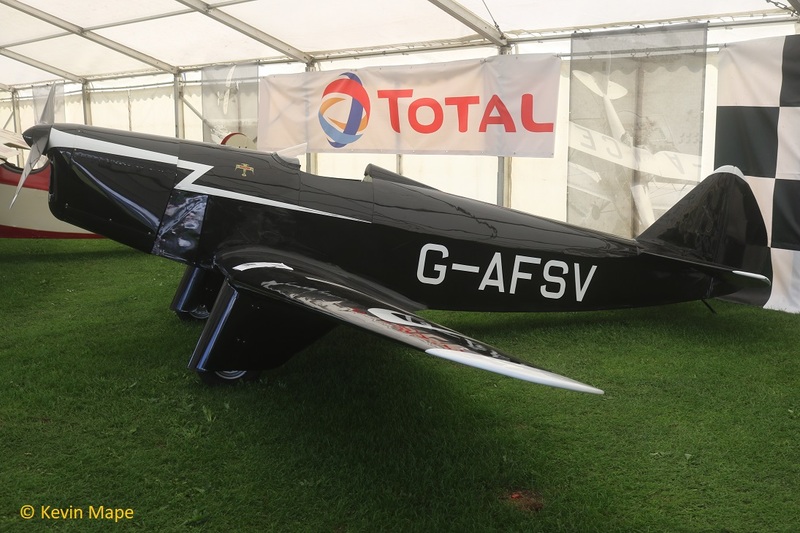 G-RVNH – Vans RV-9A. Built 2006. 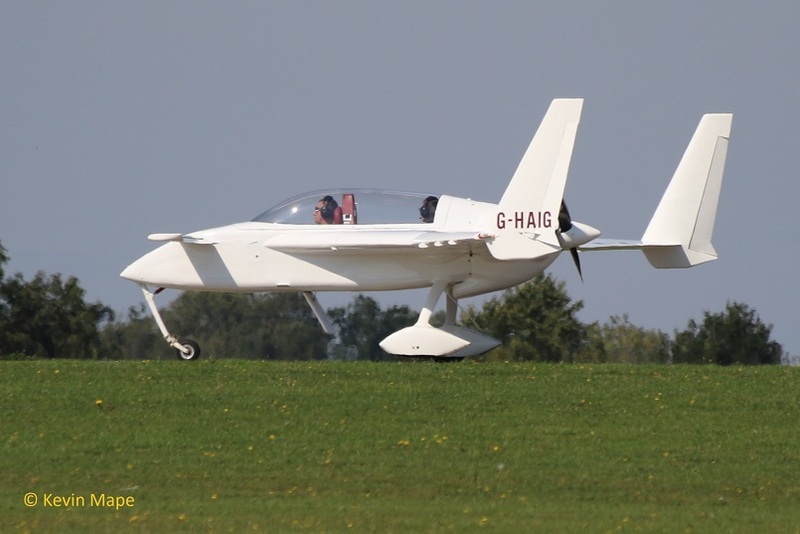 G-RVTT – Vans RV-7. Built 2010. 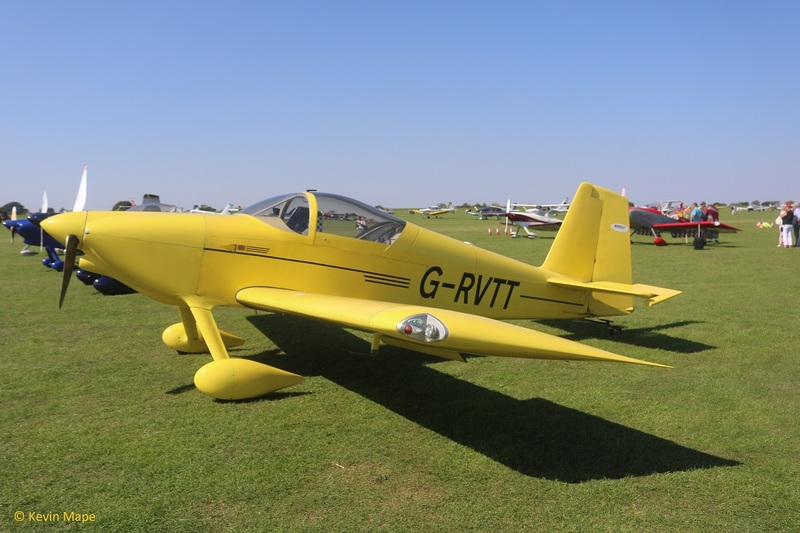 G-RVTW – Vans RV-12. Built 2015. 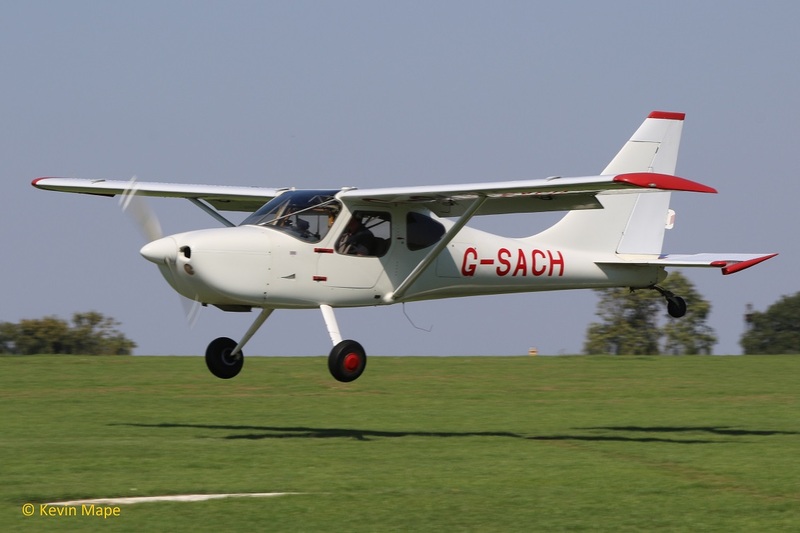 G-SACH – Glastar. Built 2002. 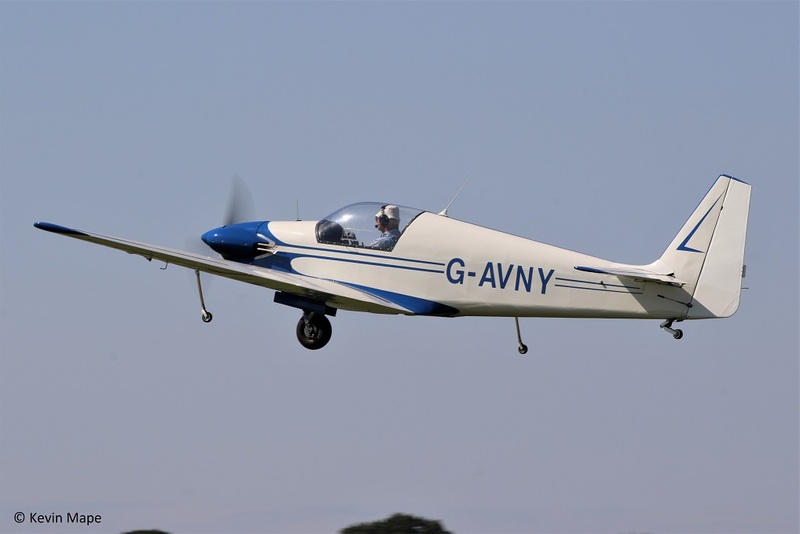 G-SARV – Vans RV-4. Built 2002. G-STPK – Mission M108 . Built 2012. 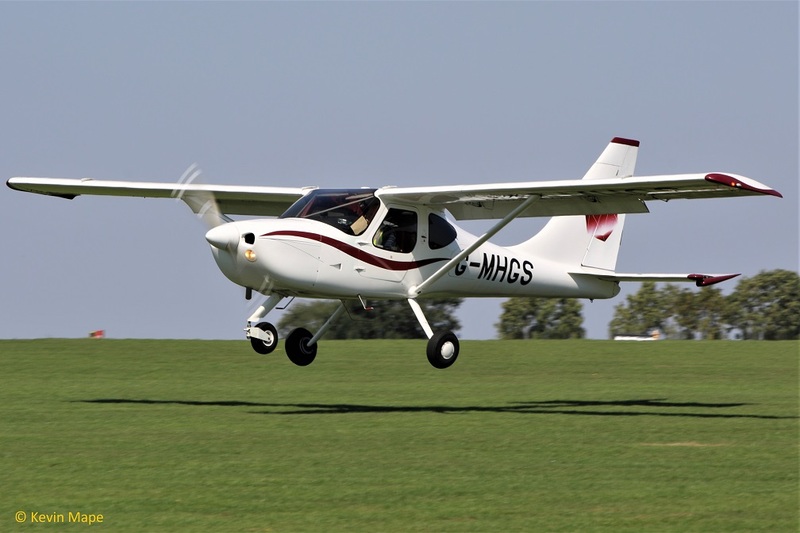 G-TECS – Tecnam P2002-EA Sierra. Built 2004. 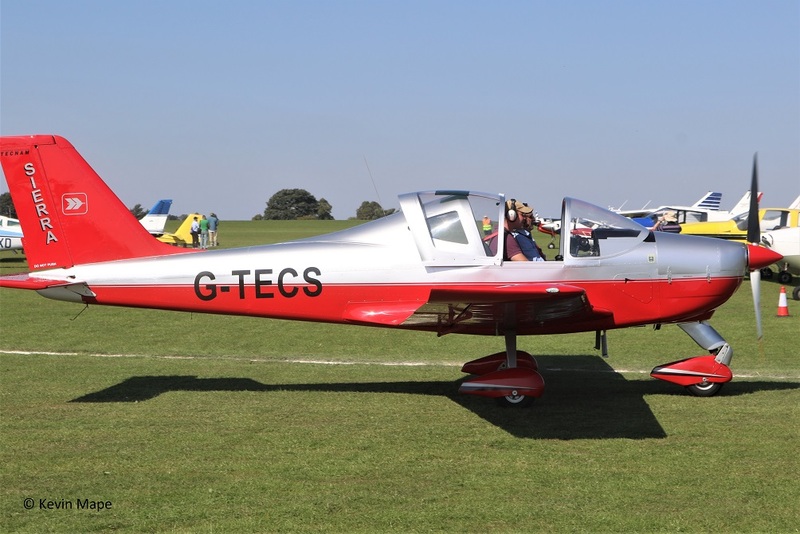 G-TERO – Vans RV-7. Built 2014. 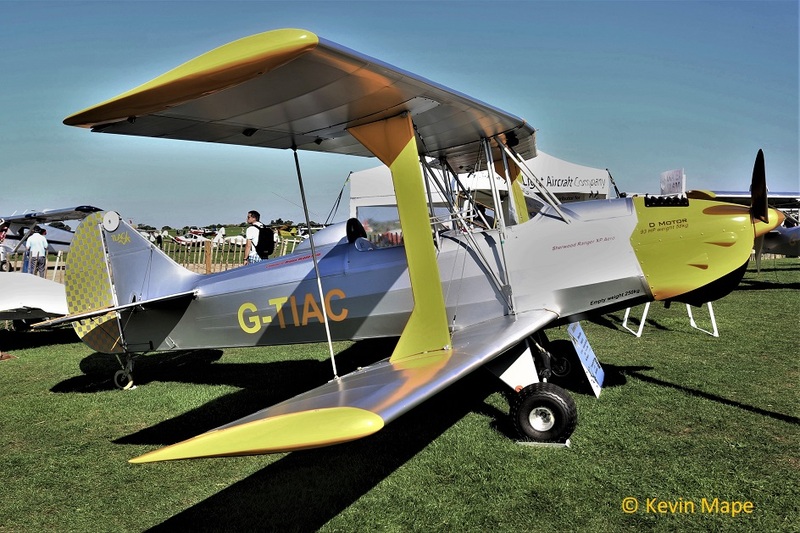 G-TIAC – Sherwood Ranger XP -Built 2014. 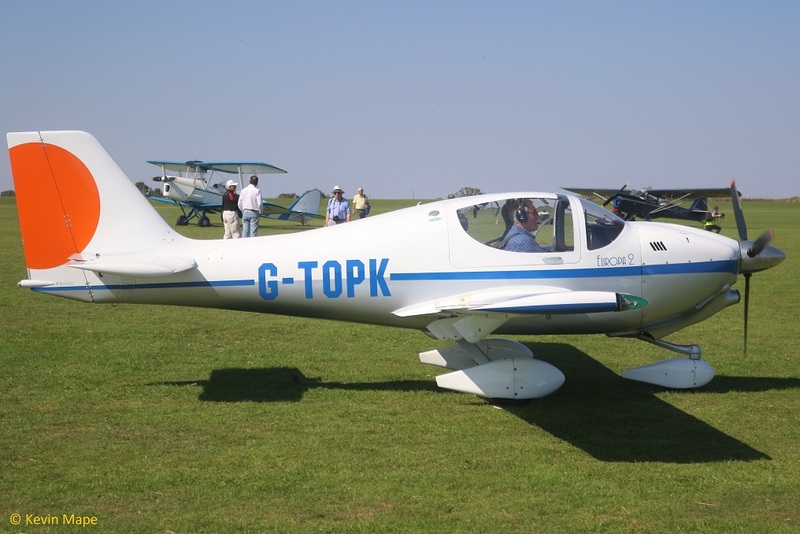 G-TOPK – Europa XS. Built 2004. 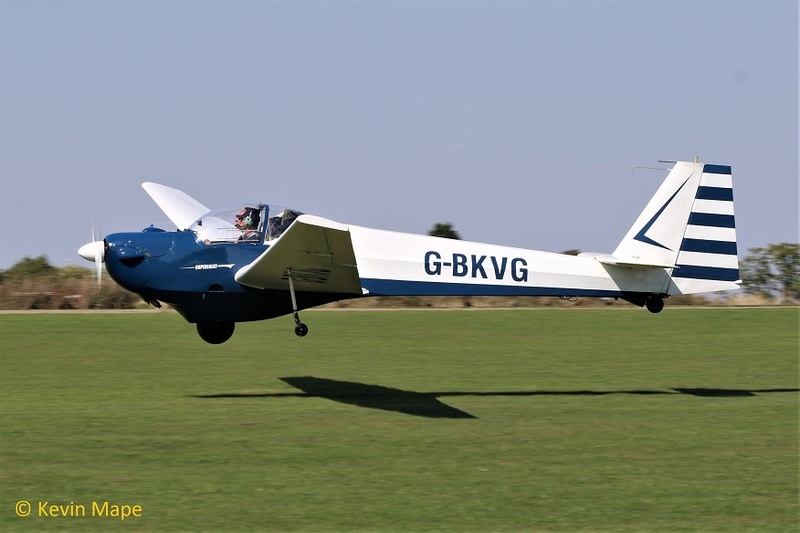 G-TPPW – Vans RV-7. Built 2013. 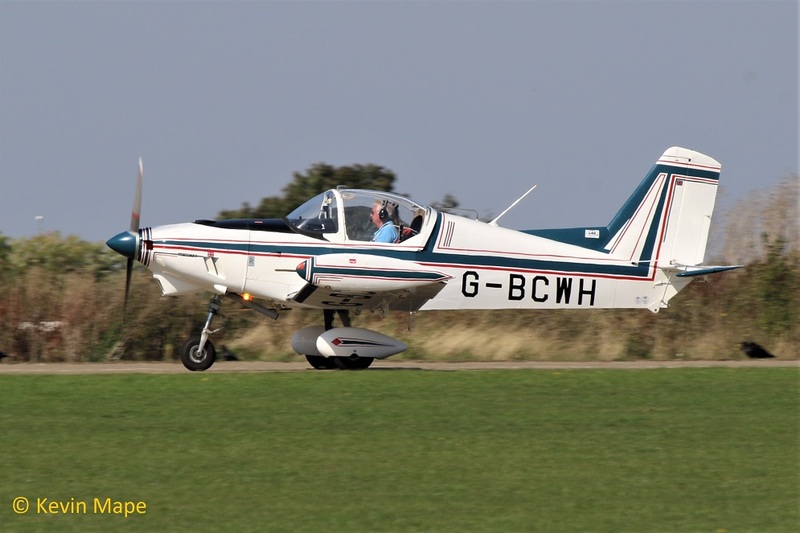 G-TSGA – Pa-28R -201 Cherokee Arrow III. Built 1977. 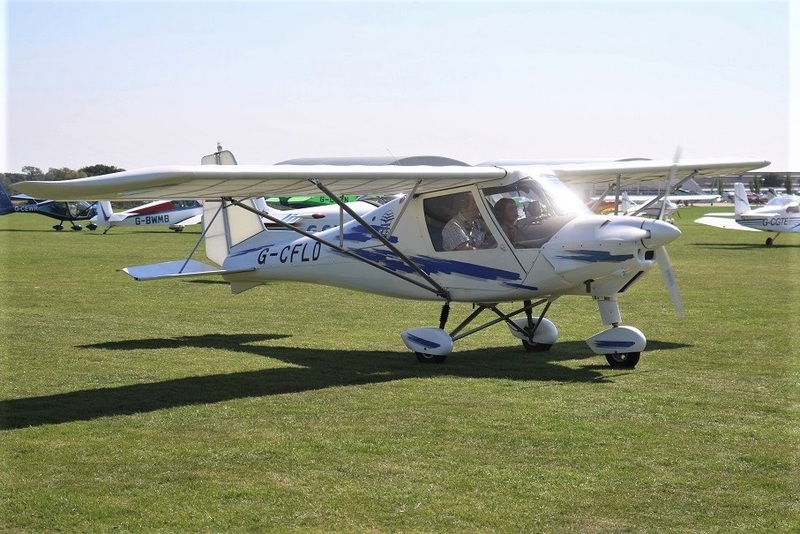 G-TSHO – Ikarus C42 FB80 Bravo. Built 2011. 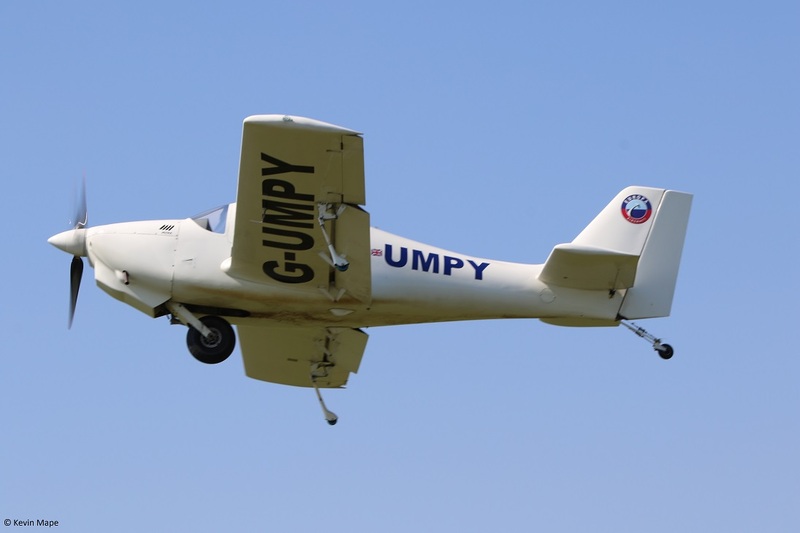 G-UMPY – Europa. Built 2012. 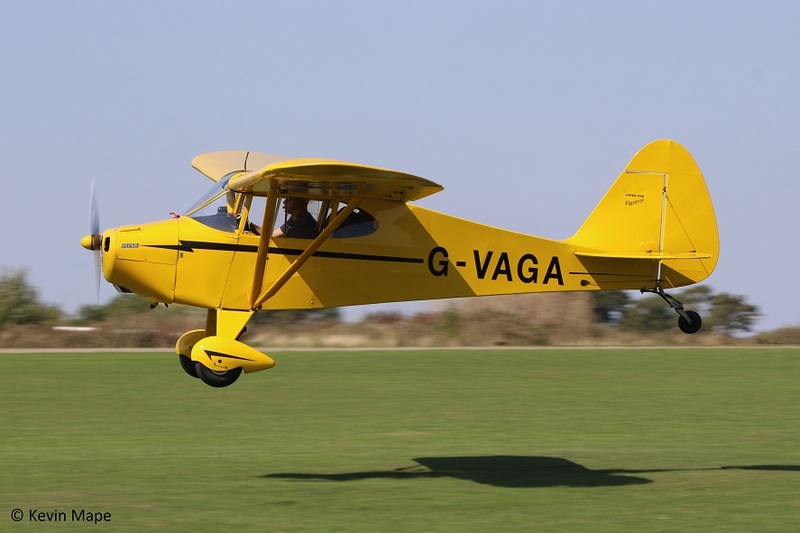 G-VAGA – Pa – 15 Vagabond. Built 1948. 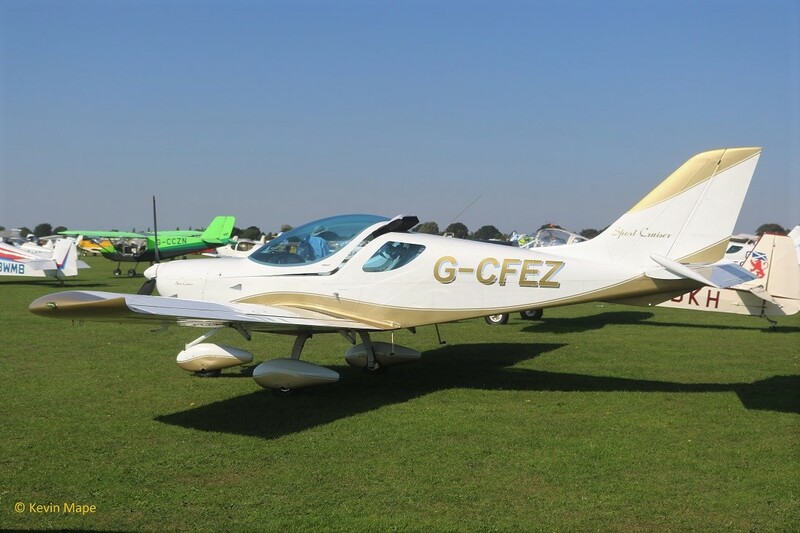 G-VMOZ – Vans RV-8. Built 2015. 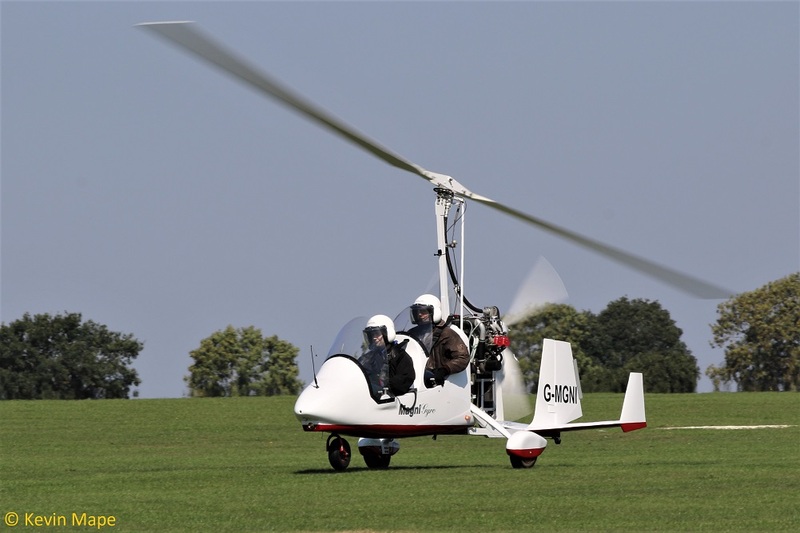 G-XIFR – Mission M108 – Built 2014. 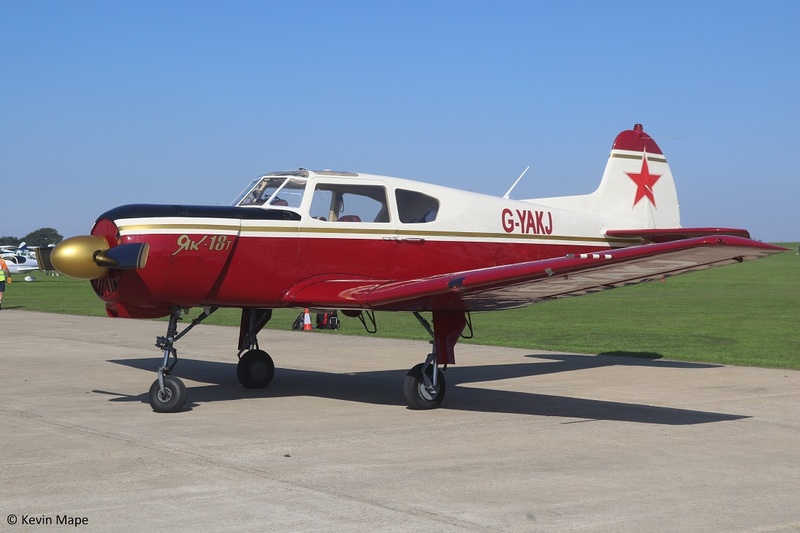 G-YAKJ – Yak 18T. Built 1993. 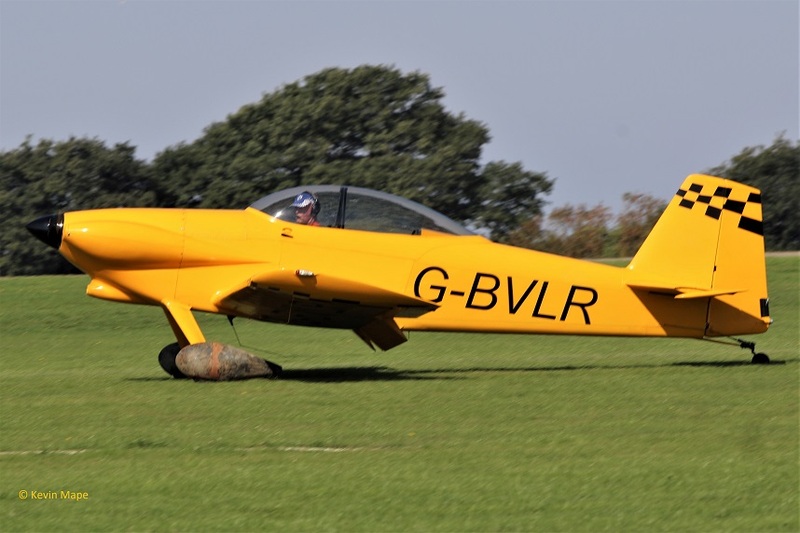 D-EGDC – AA-5B Tiger. Built 1978. 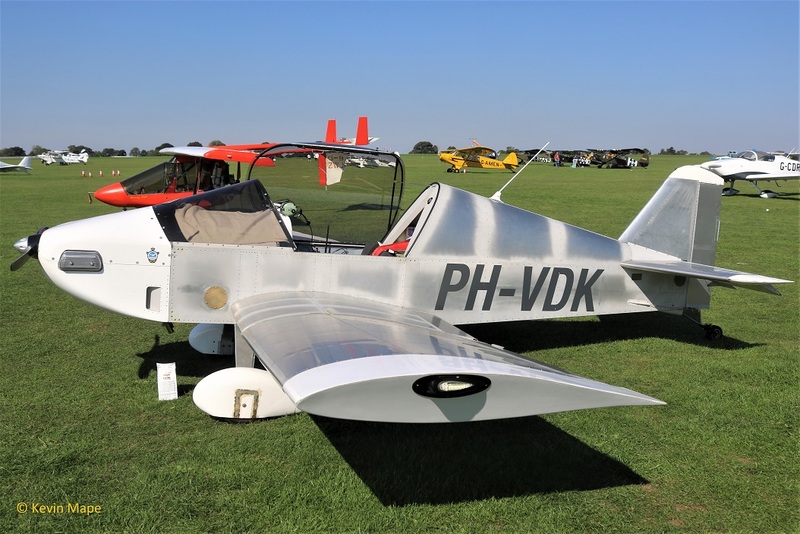 EC-ZCZ – Jodel D-92 Bebe. Built. 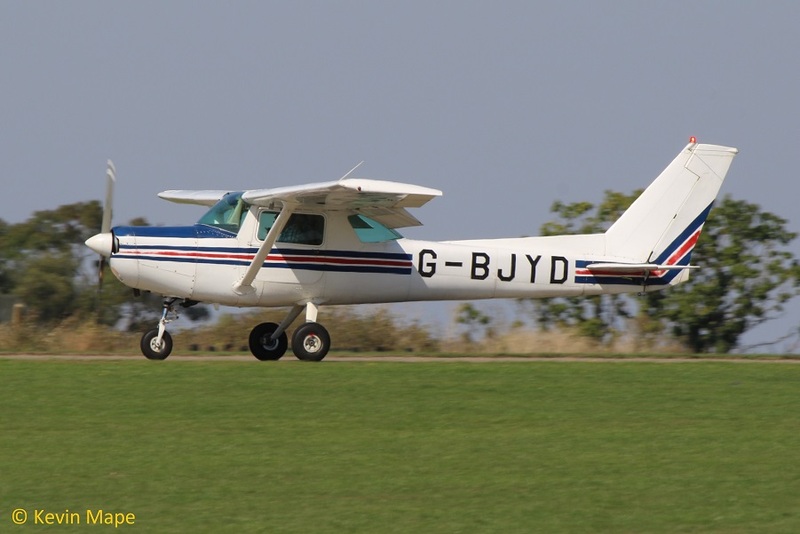 EI-GSM- Cessna 182S. Built 1998. 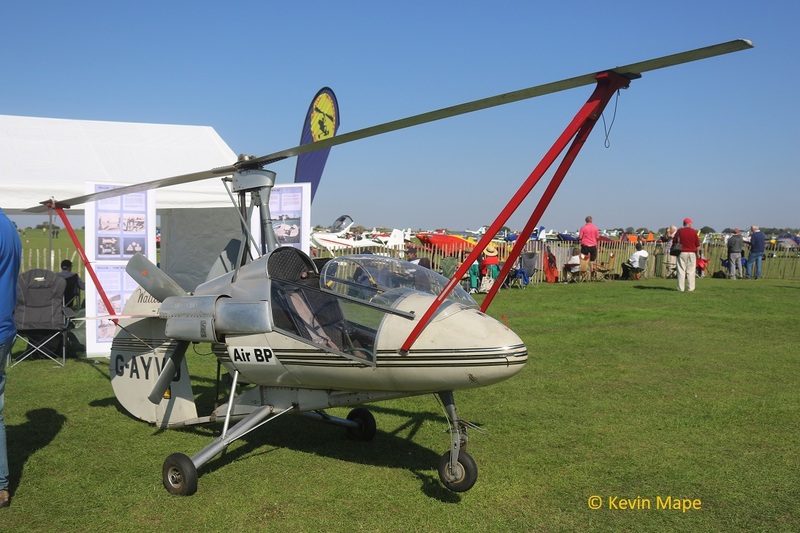 F-BNYC – Sud GY80-80 Horizon. Built 1966. 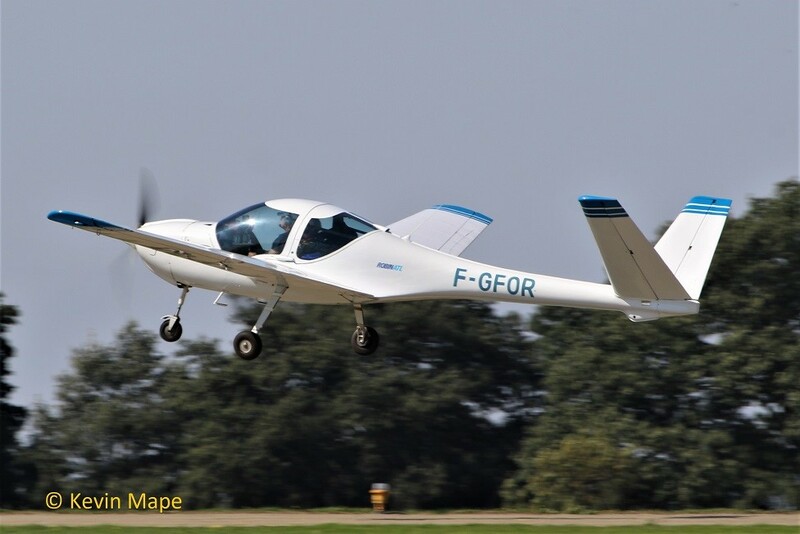 206/F-PGKL – Europa XS. Built . 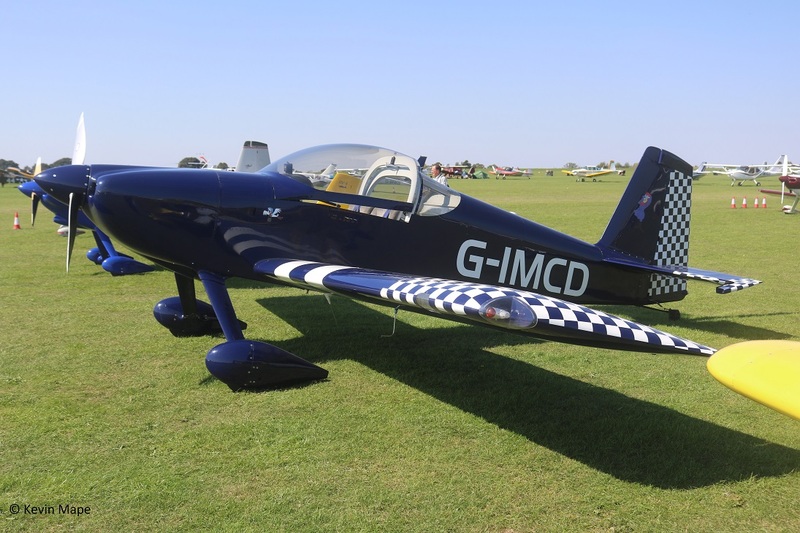 N74DC – Pitts S-2A Built. 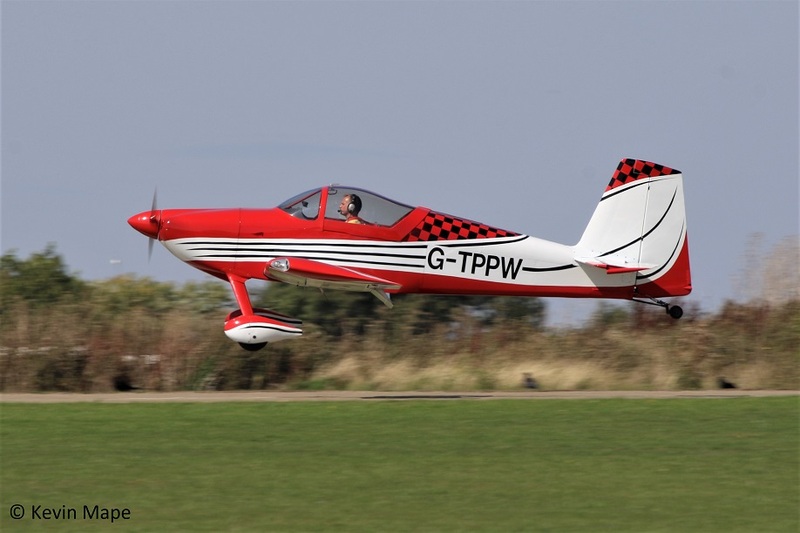 SE-XIP – Thorpe T18 Tiger. Built 1988. I will keep adding picture as time allows me.